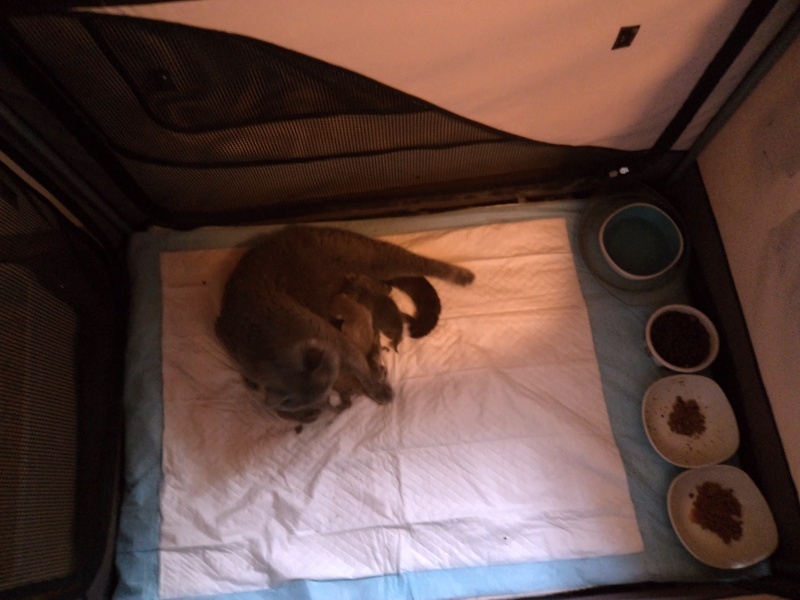 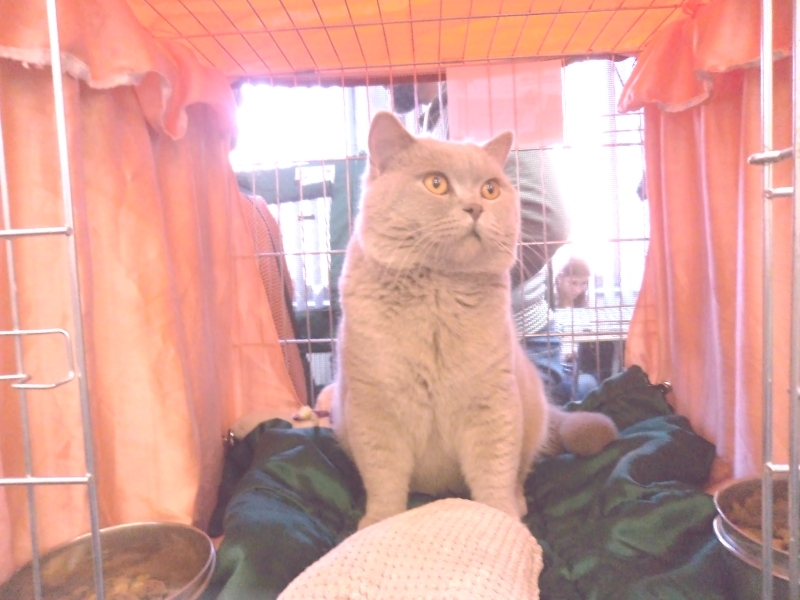 We have available kittens - see litter "O" and litter "P" and litter "Q"
Our litter "Q" got Ex.1 + BIS both days. 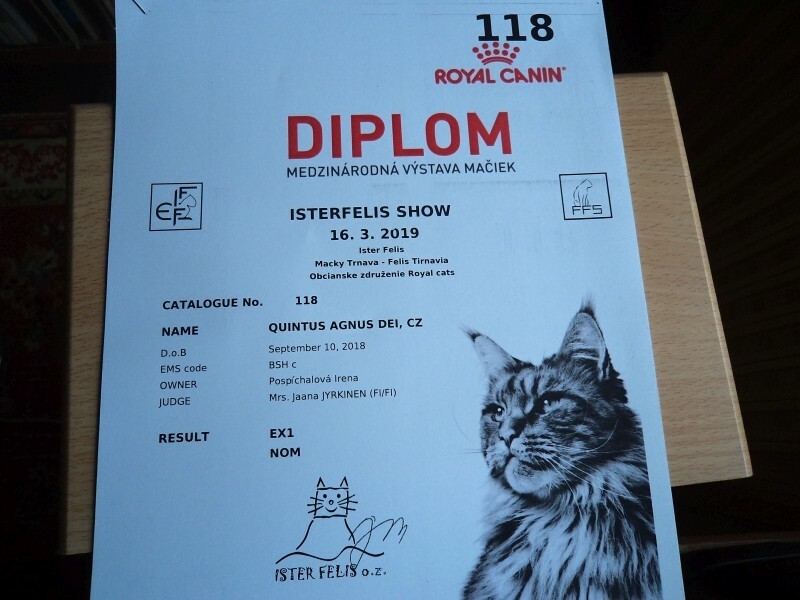 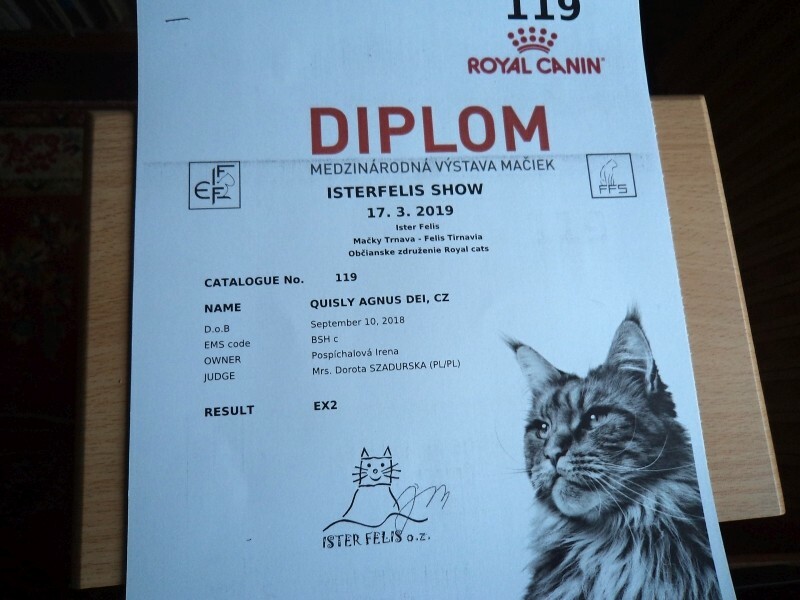 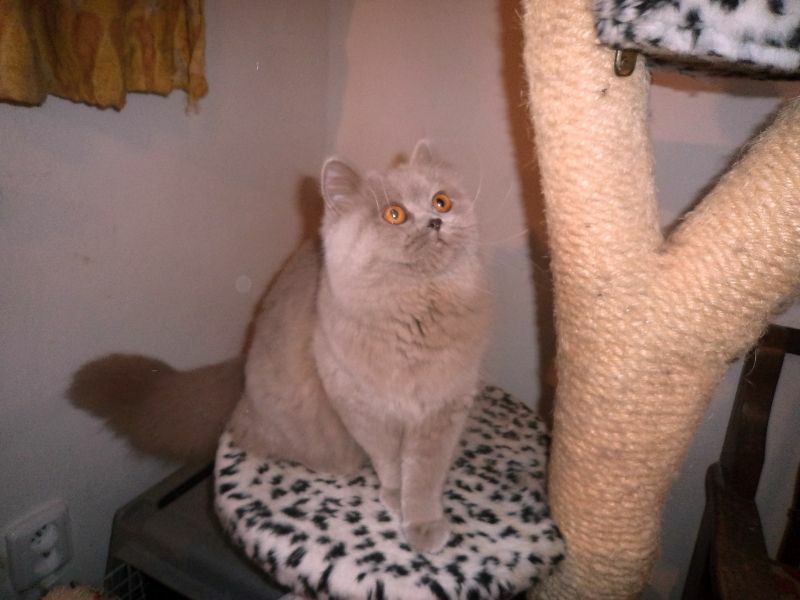 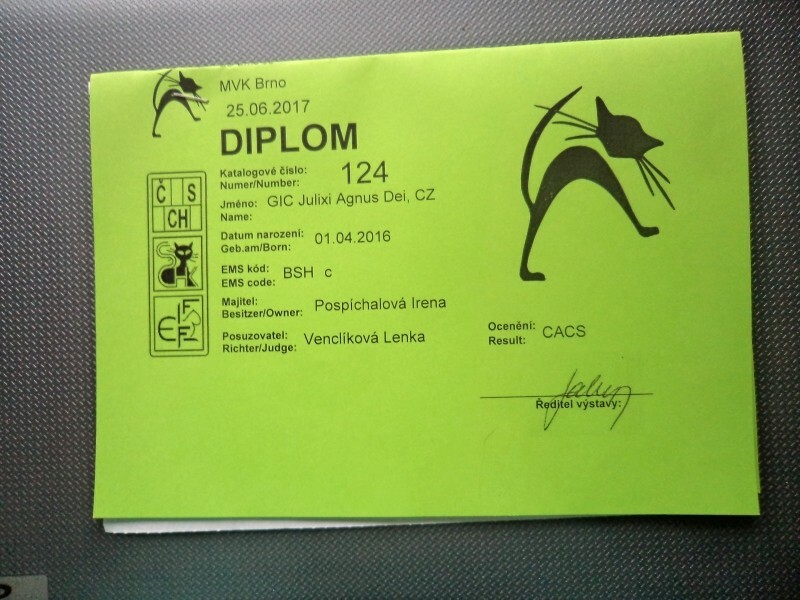 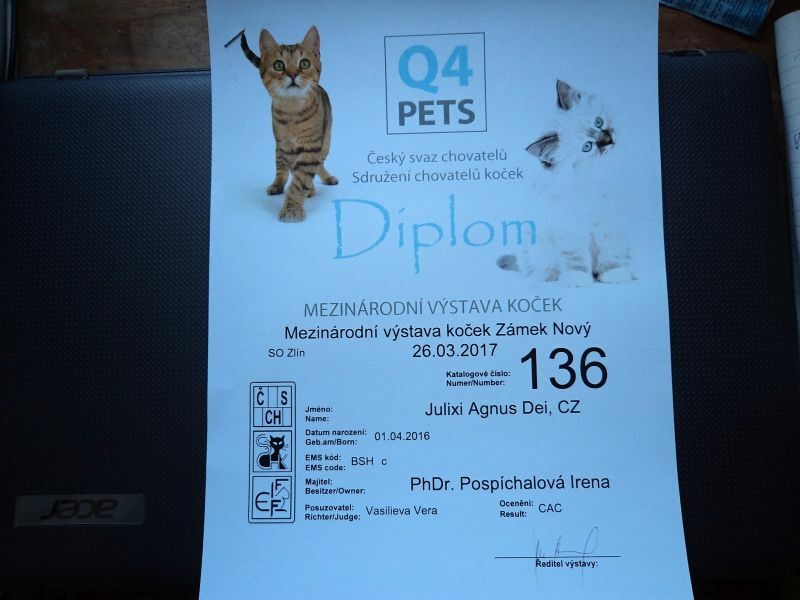 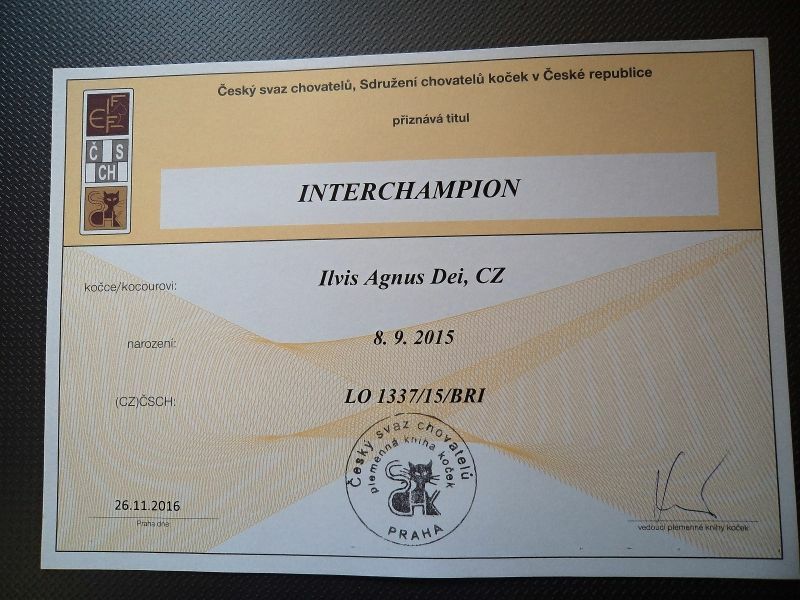 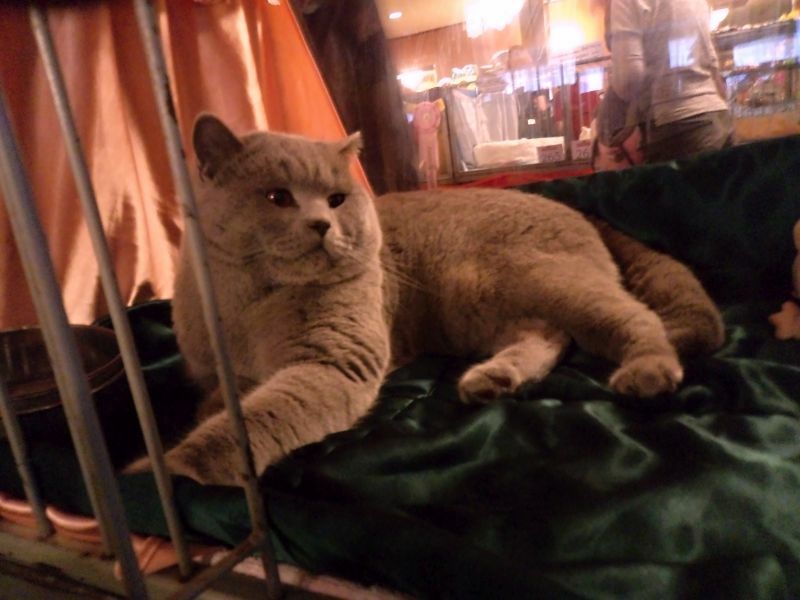 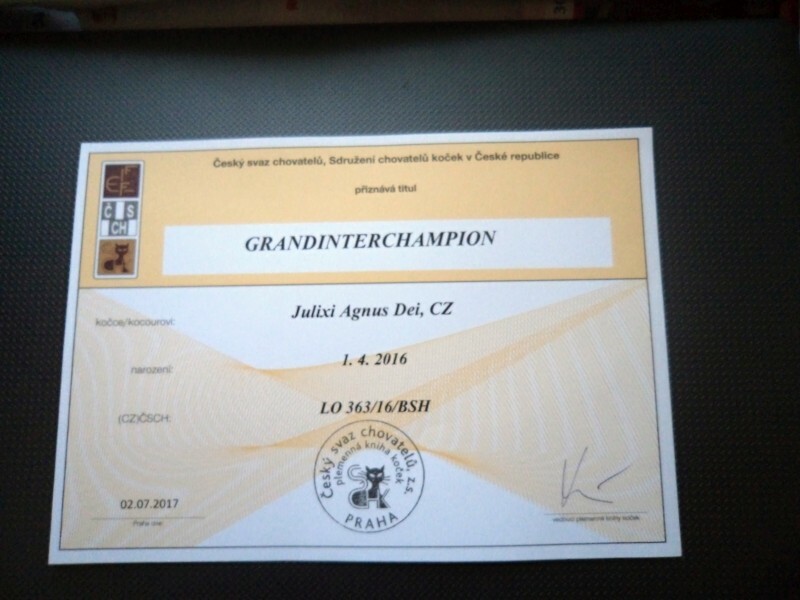 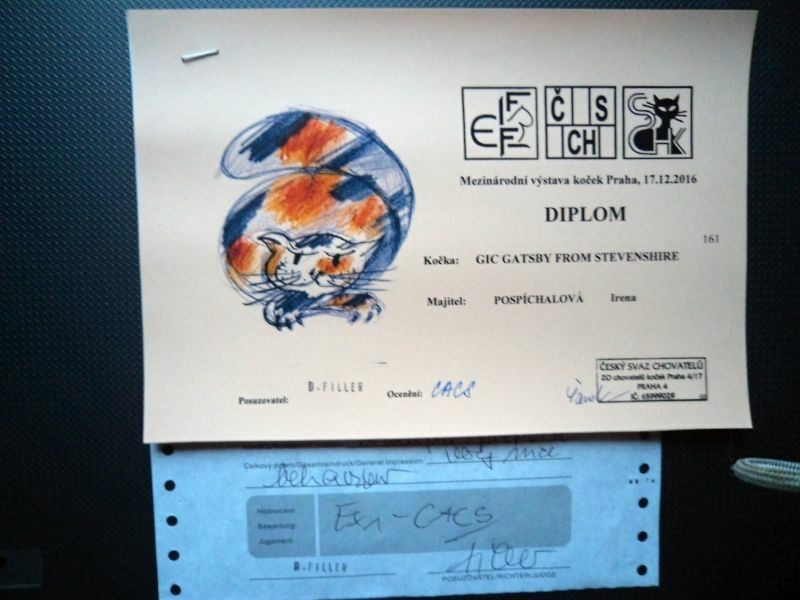 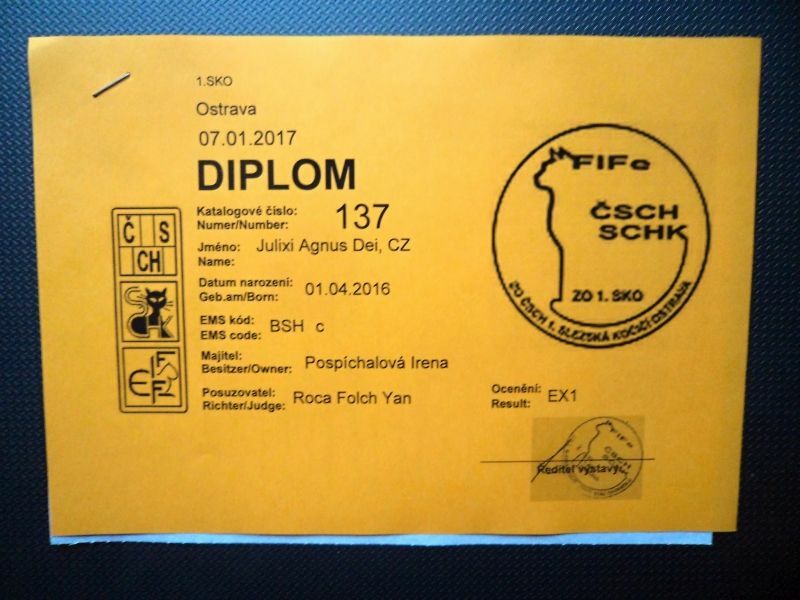 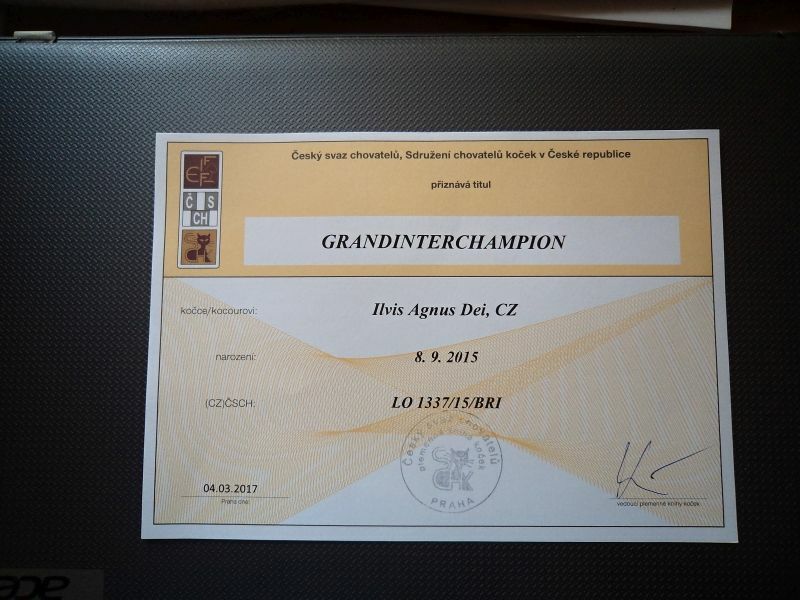 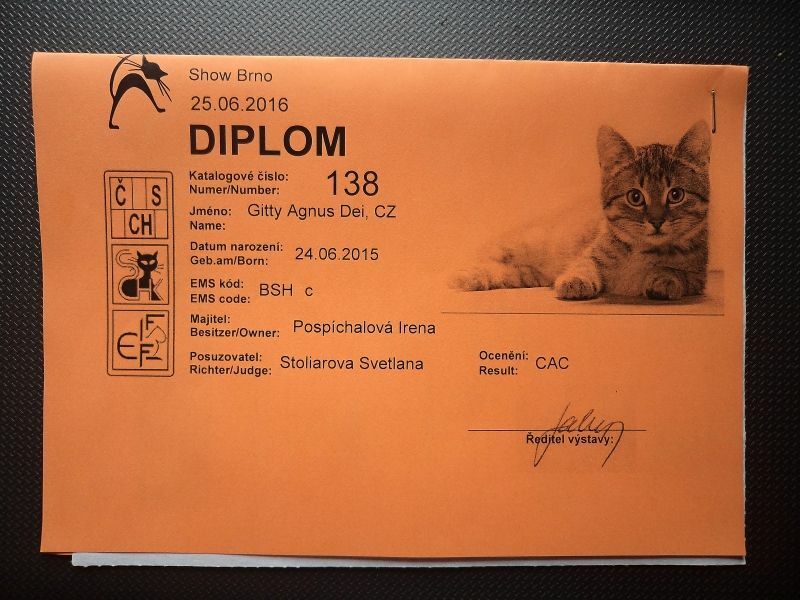 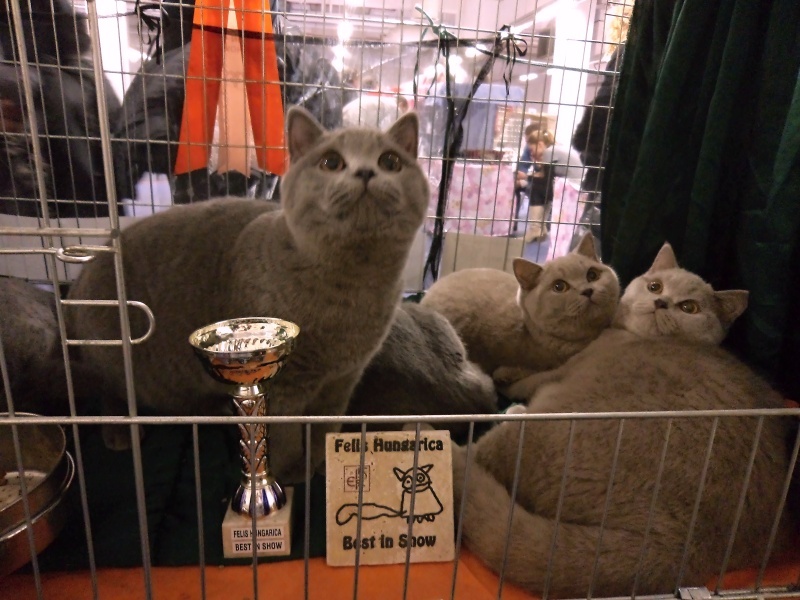 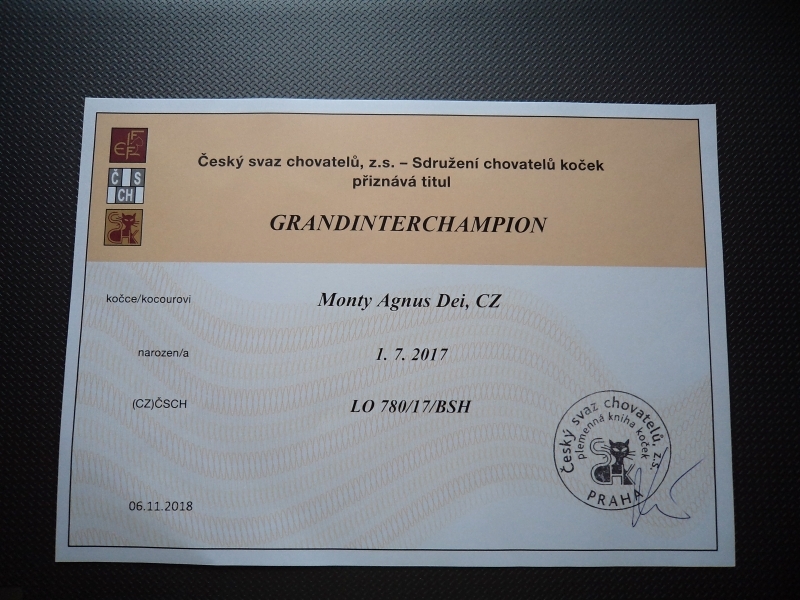 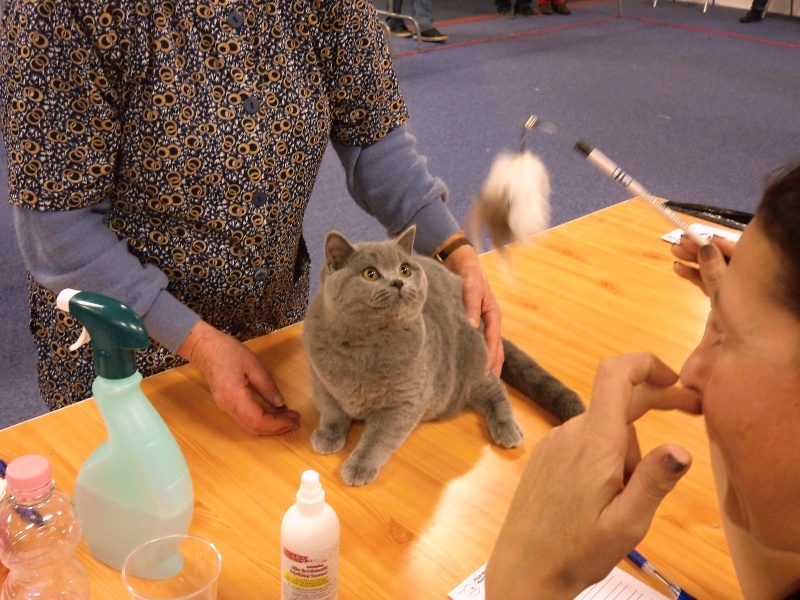 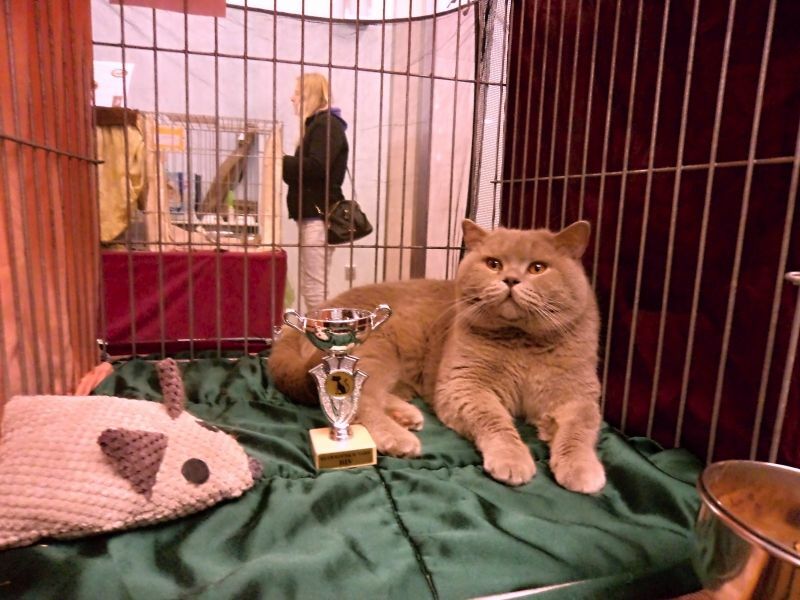 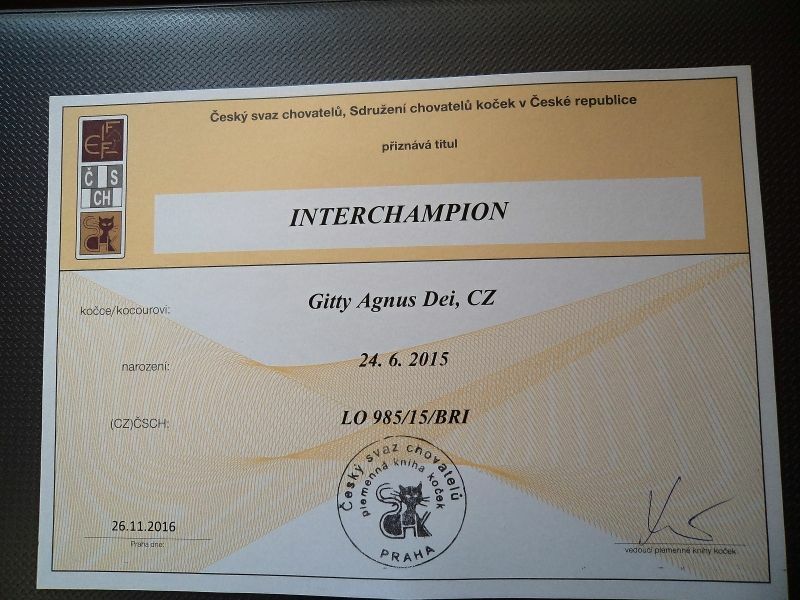 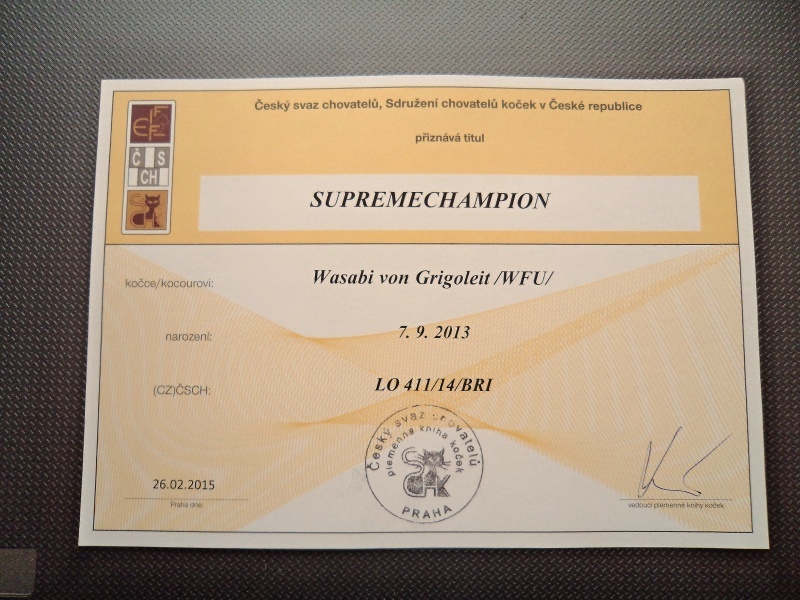 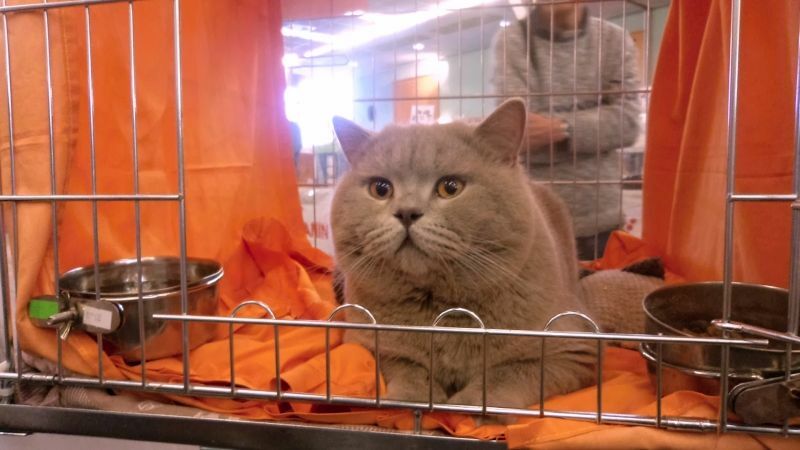 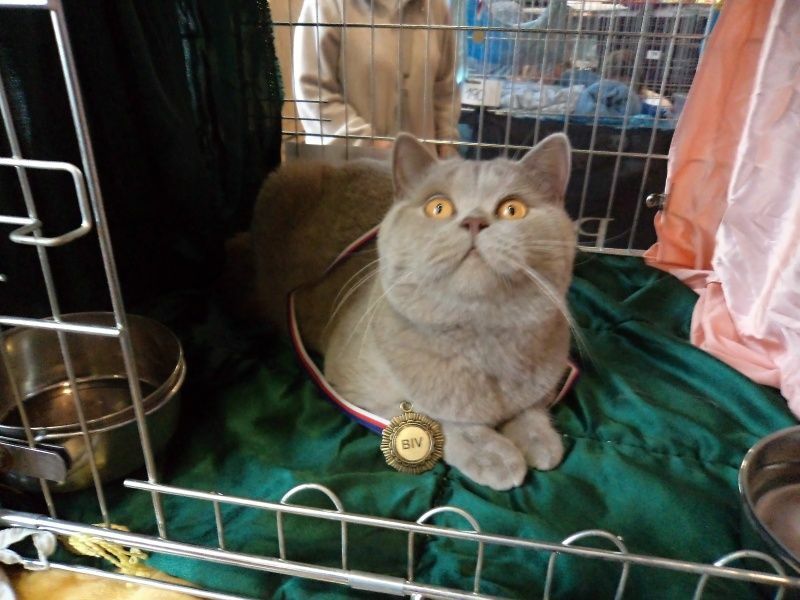 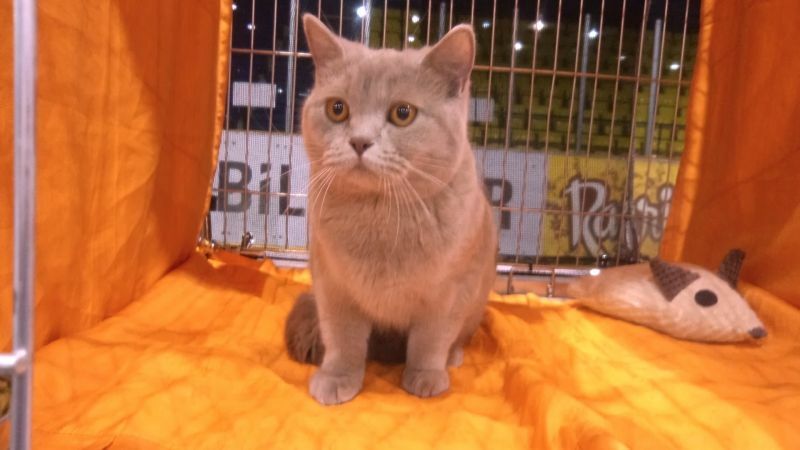 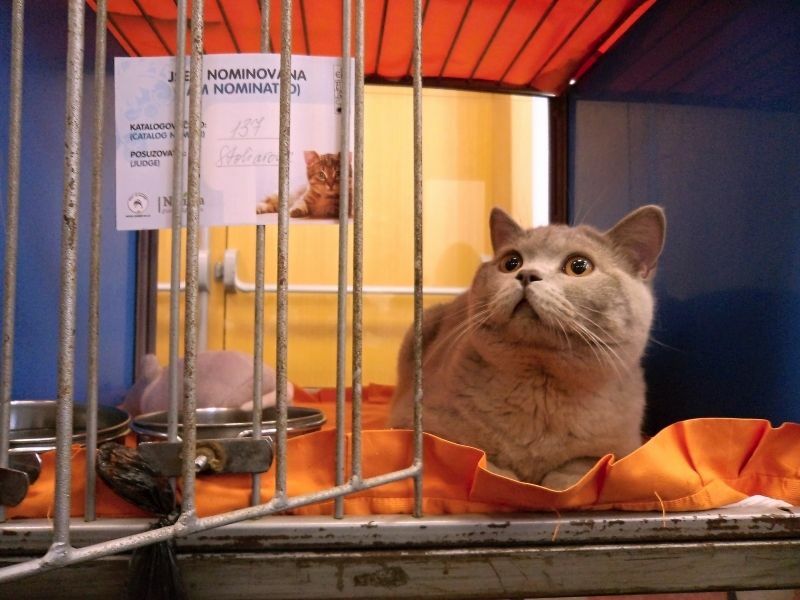 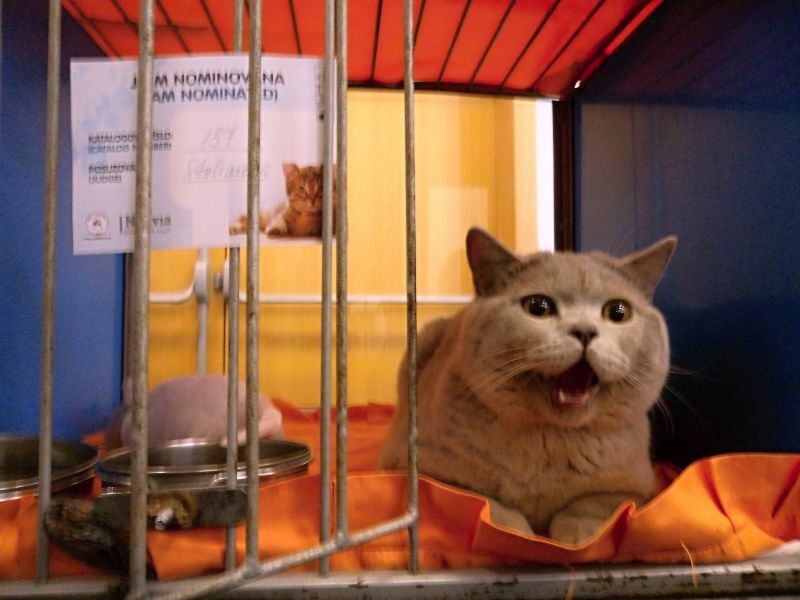 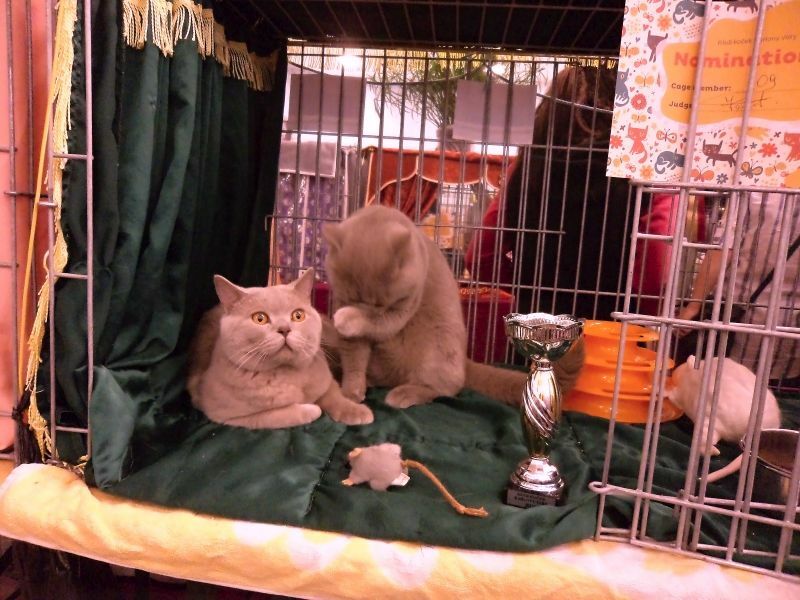 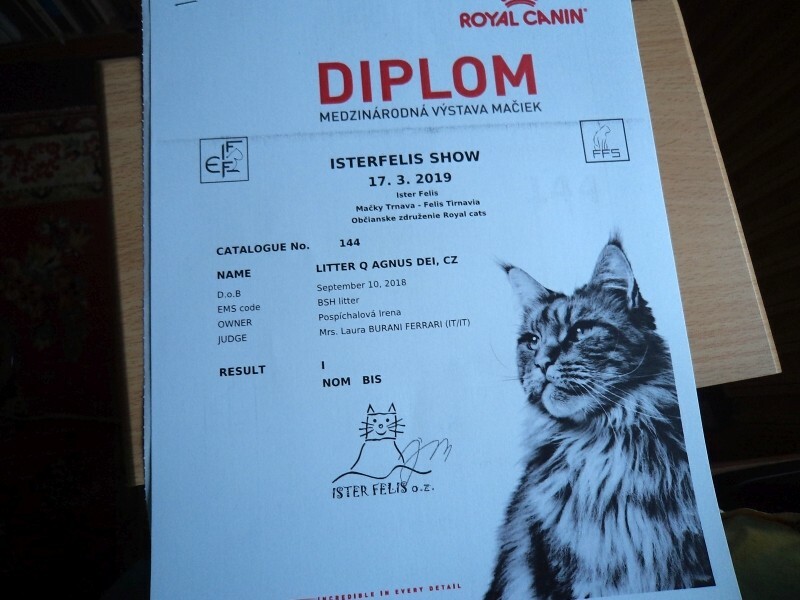 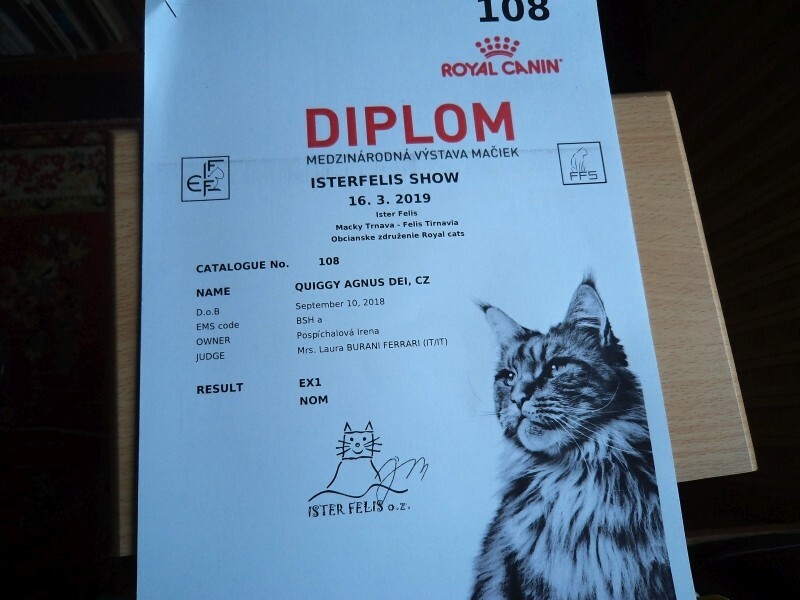 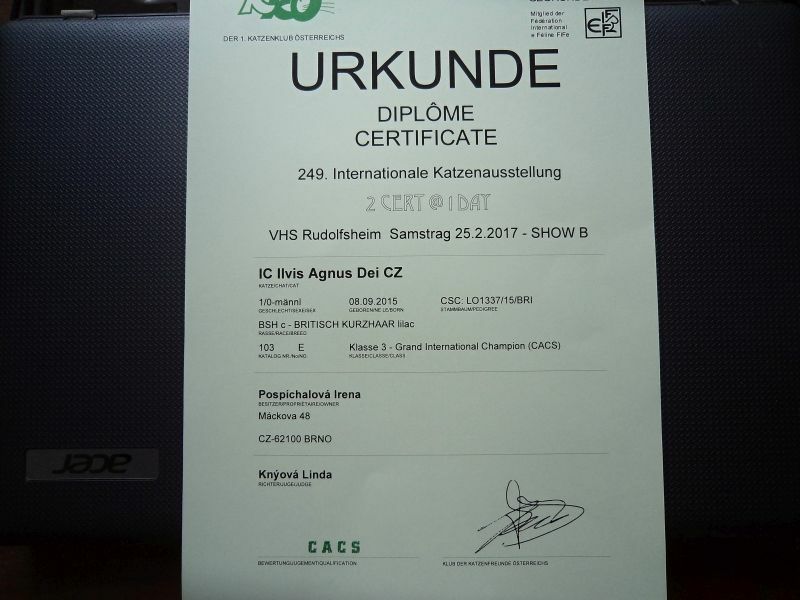 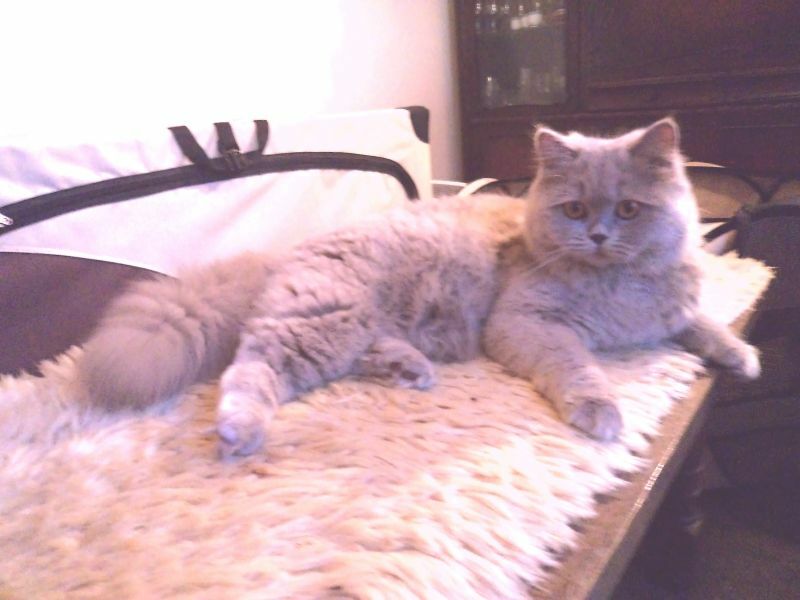 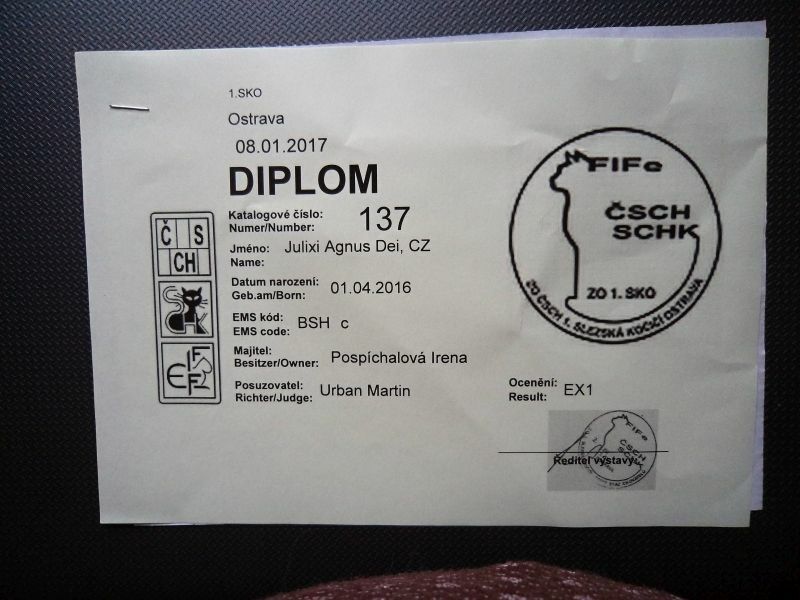 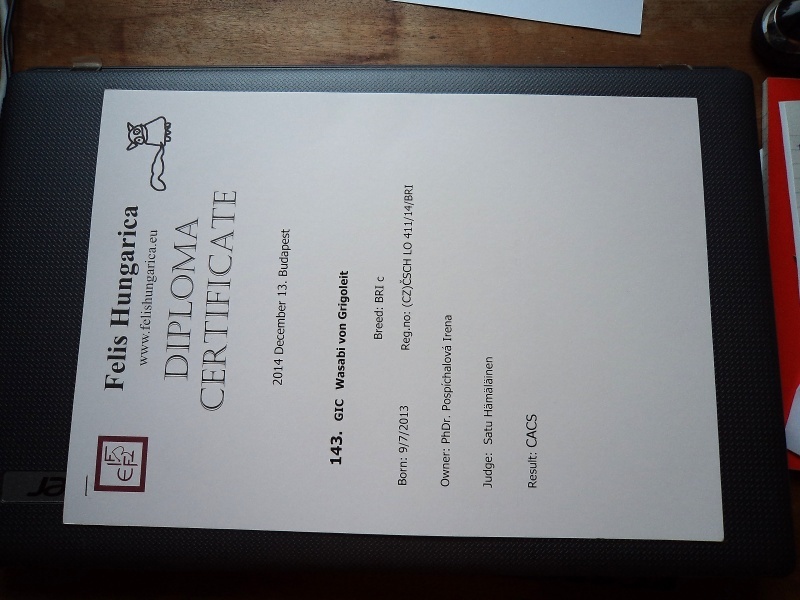 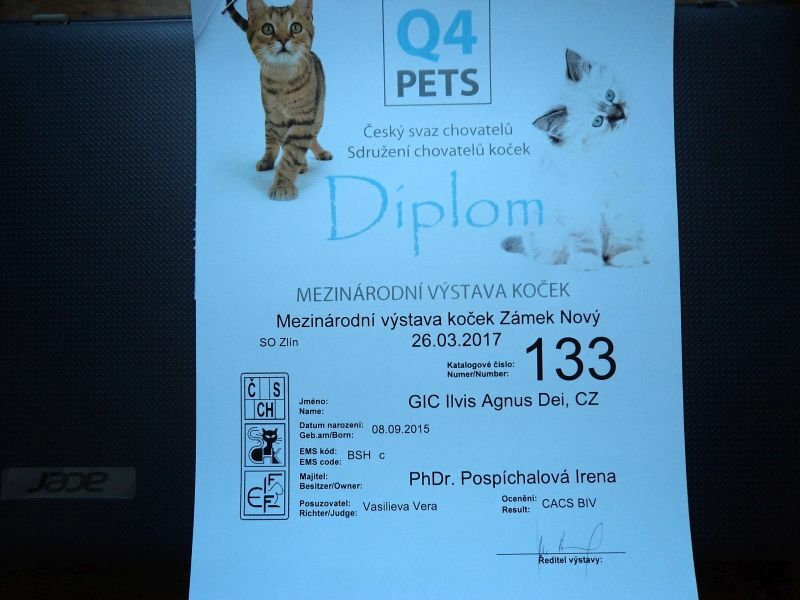 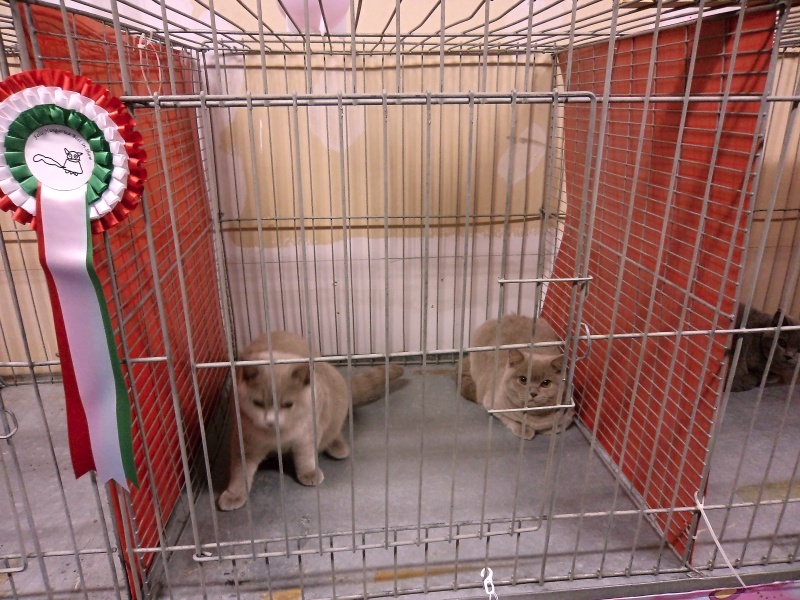 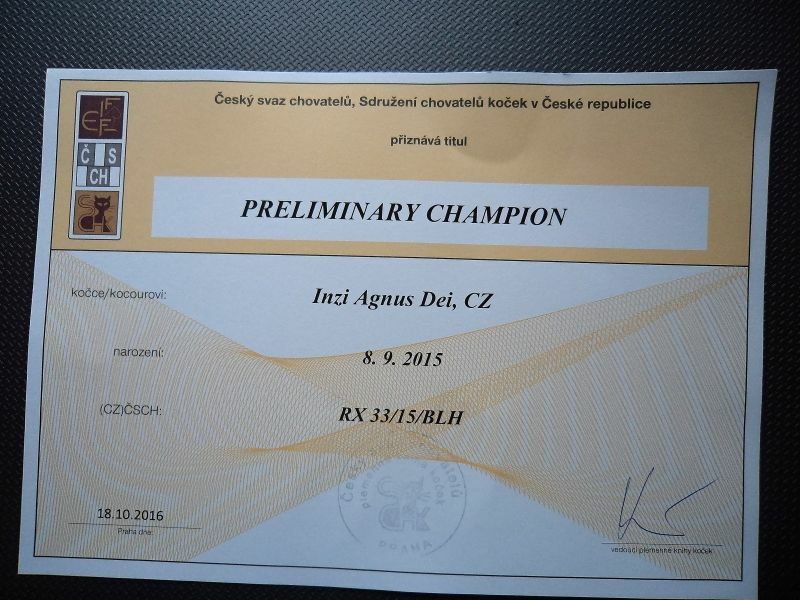 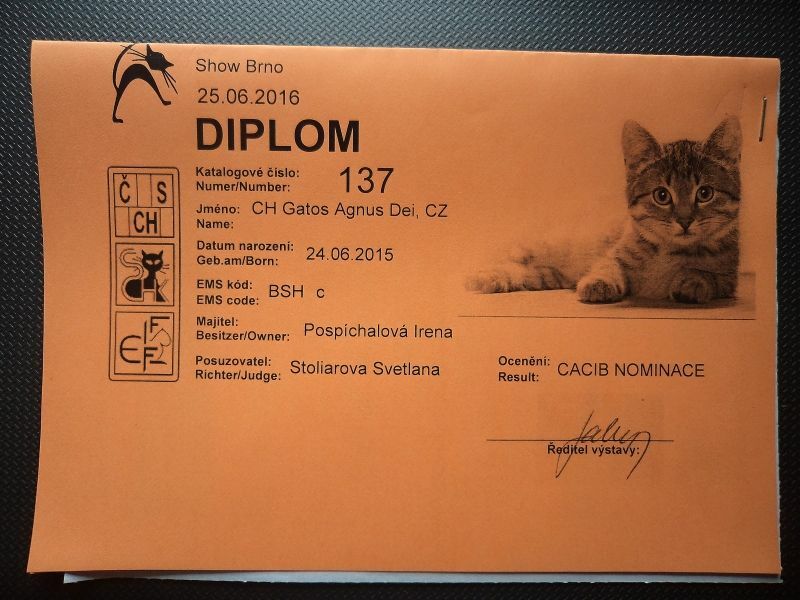 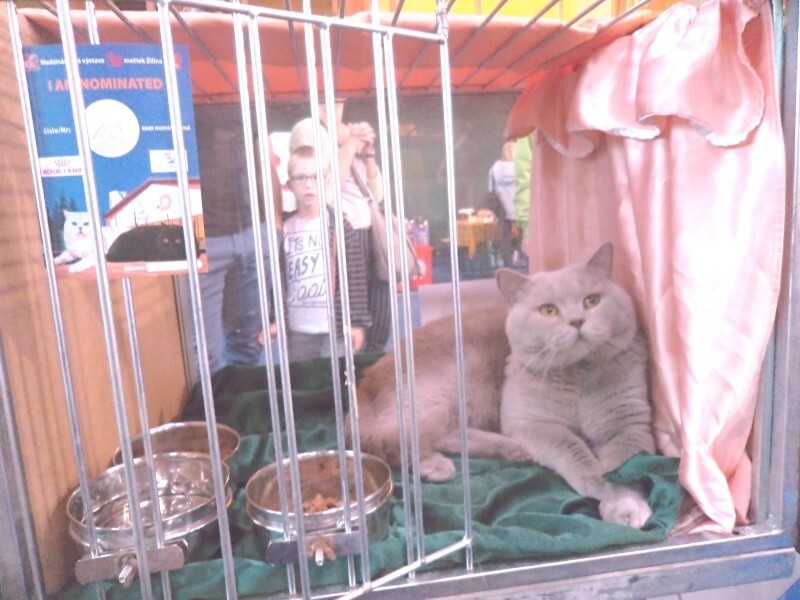 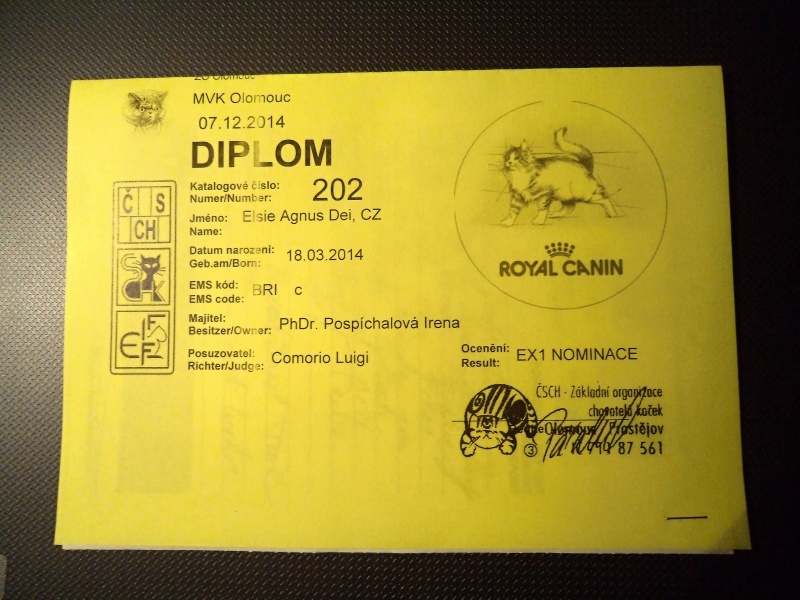 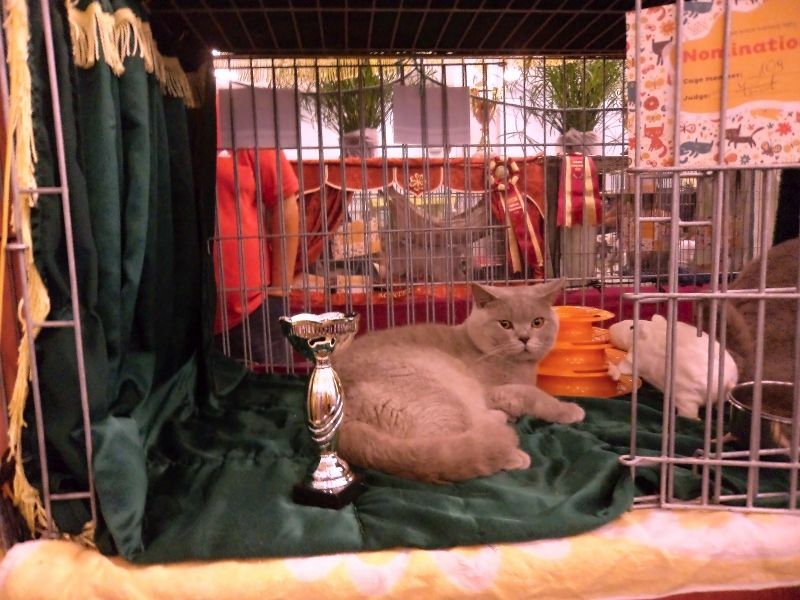 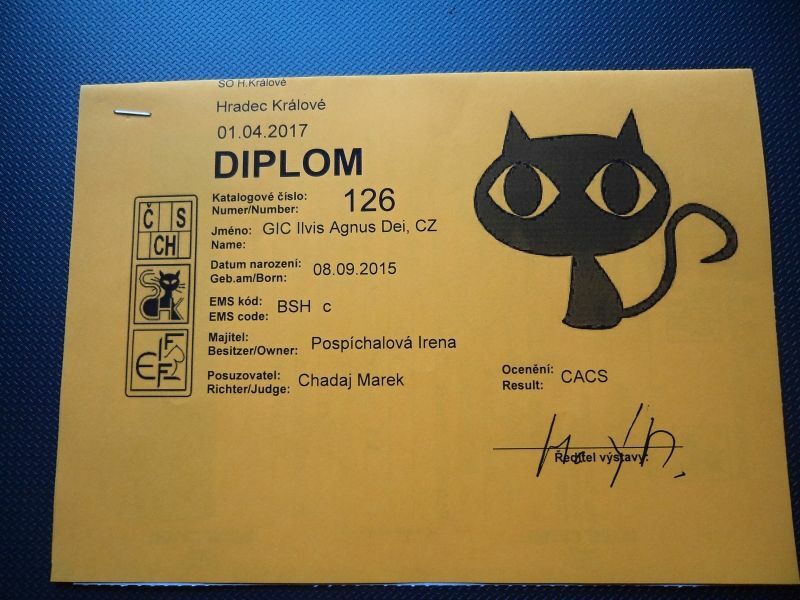 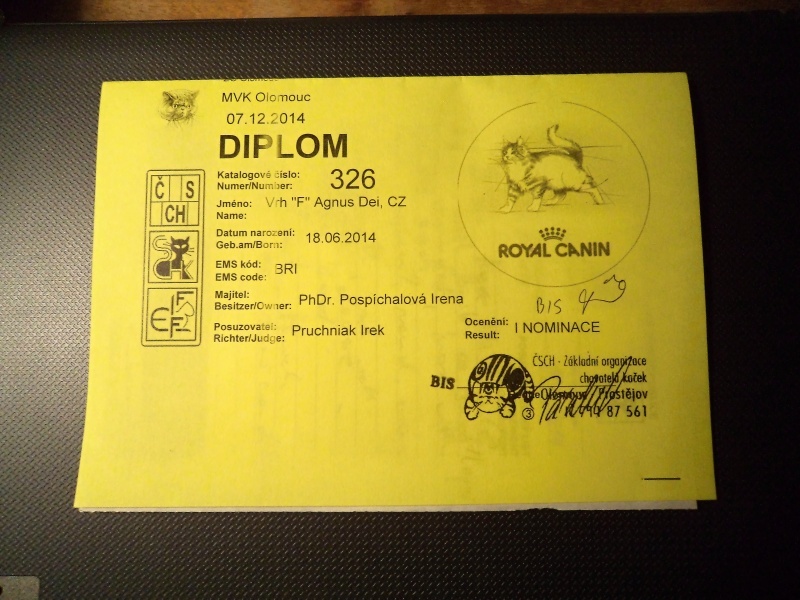 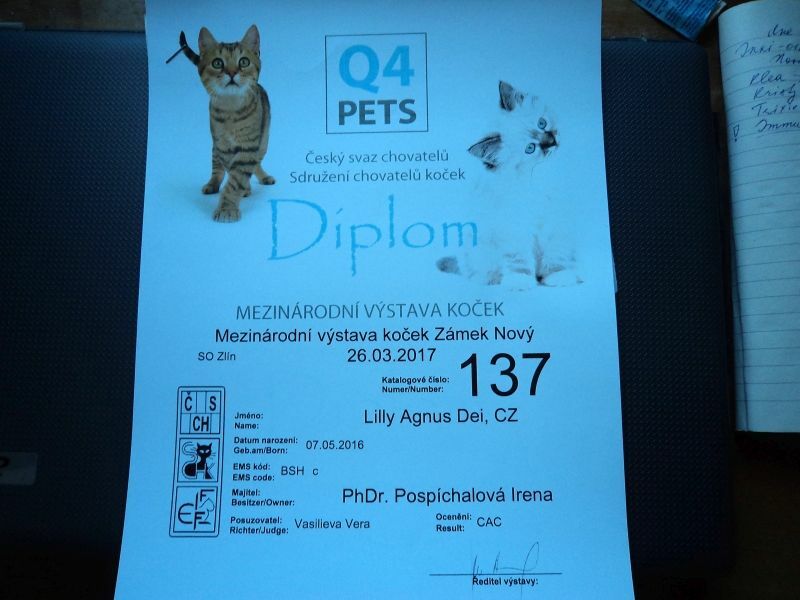 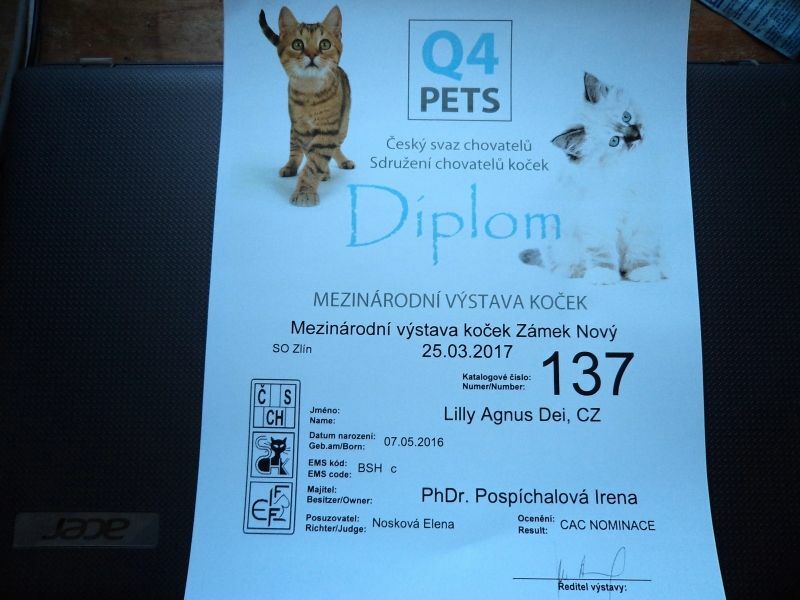 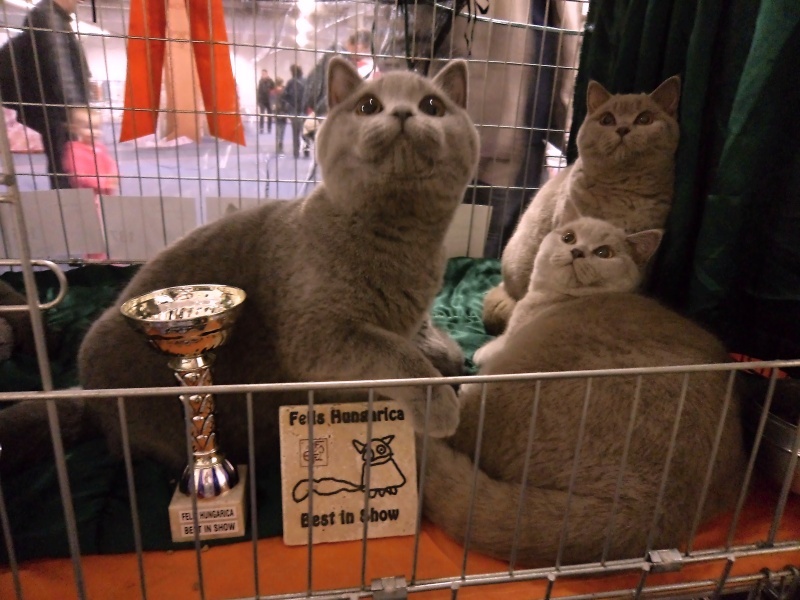 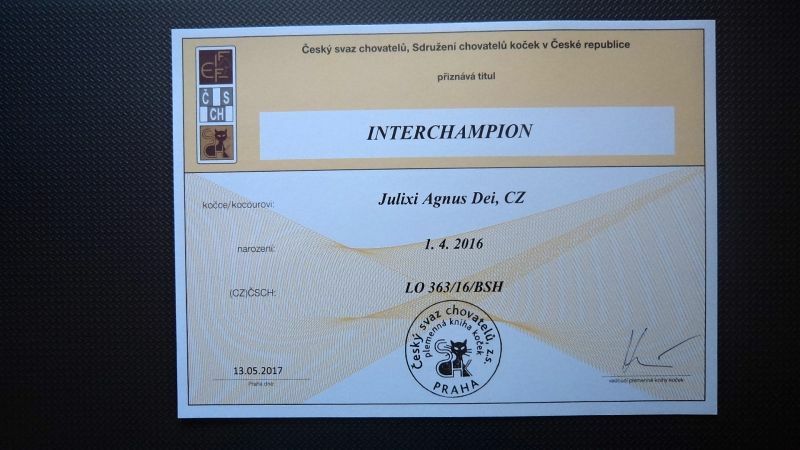 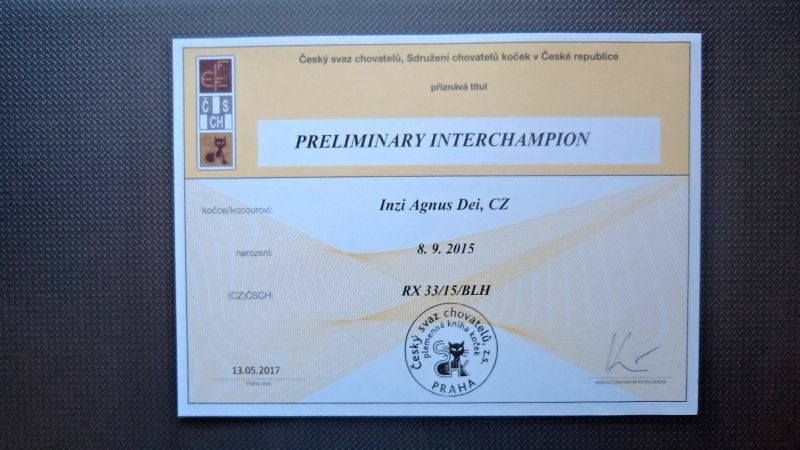 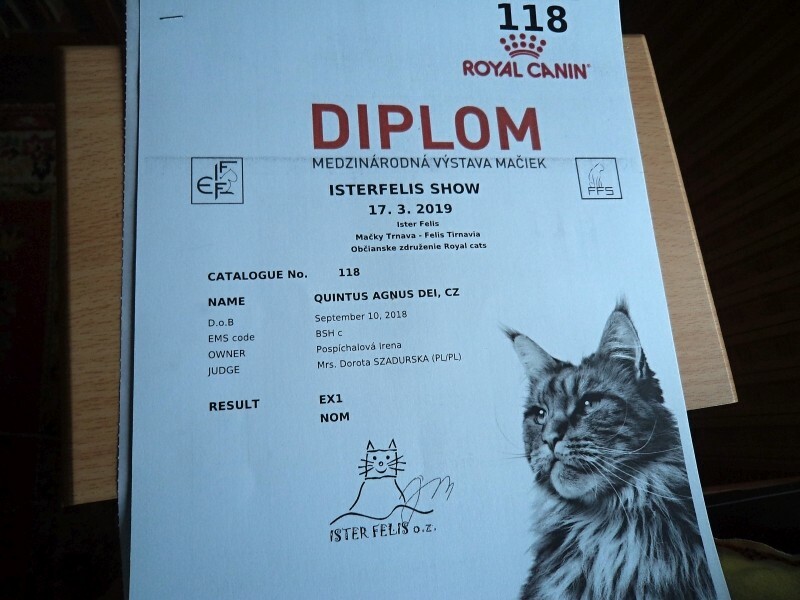 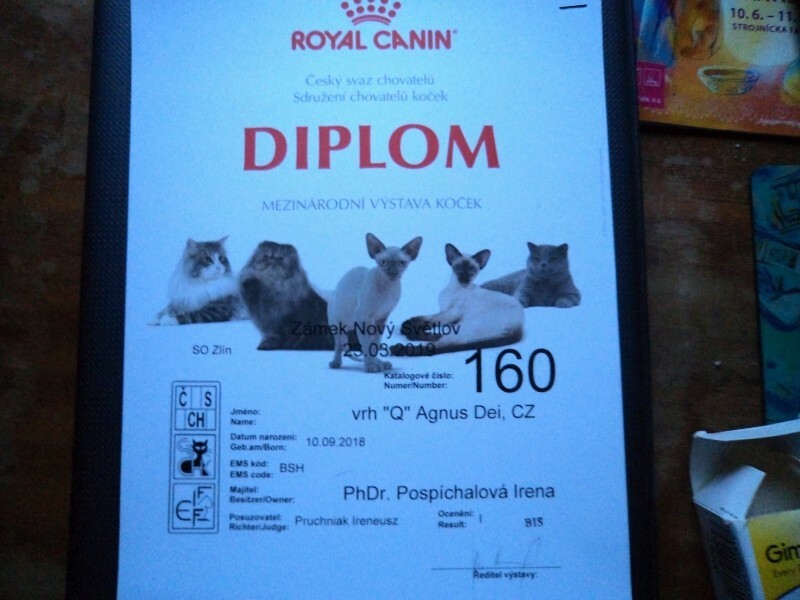 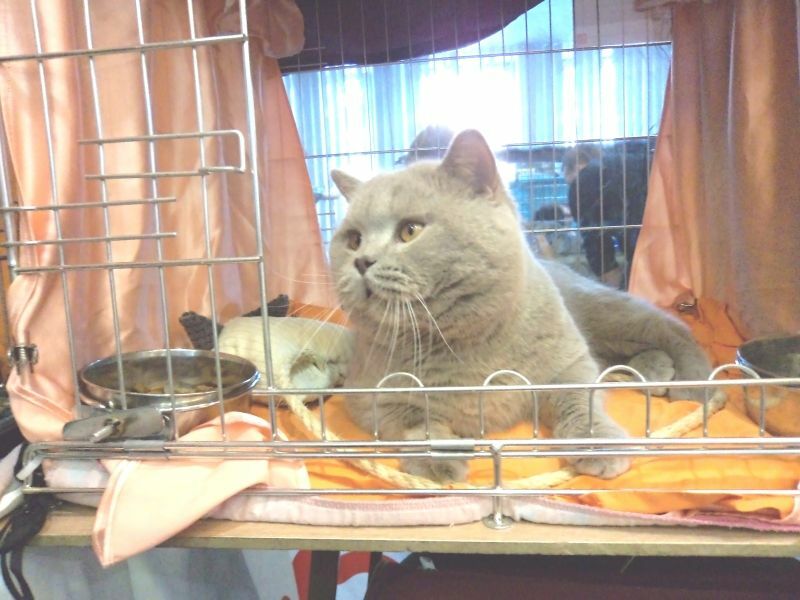 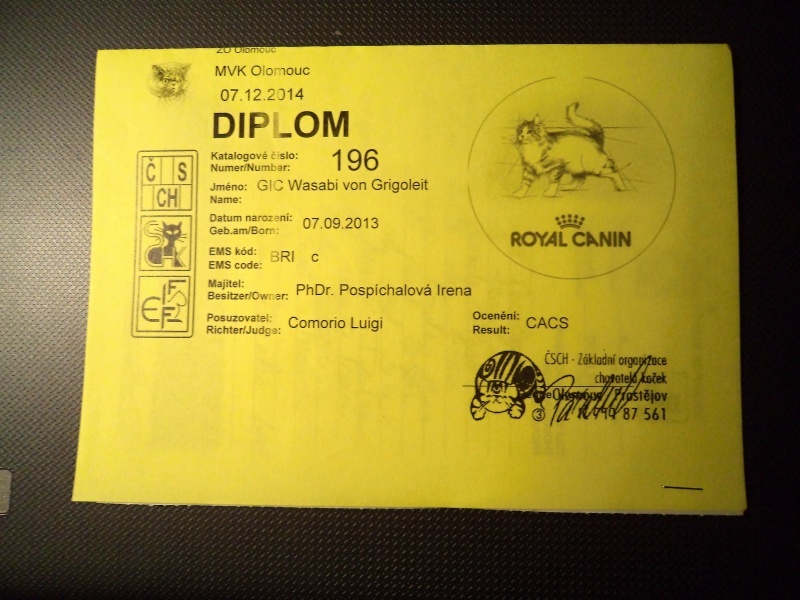 Our British shorthair blue kitten Quintus Agnus Dei, CZ (BSH a) has got two diplomas Ex.1 + NOM on both days. 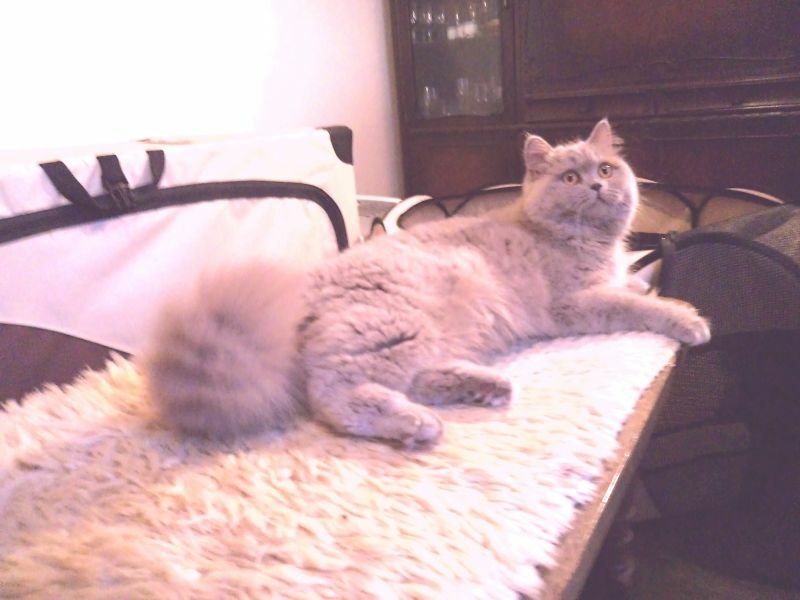 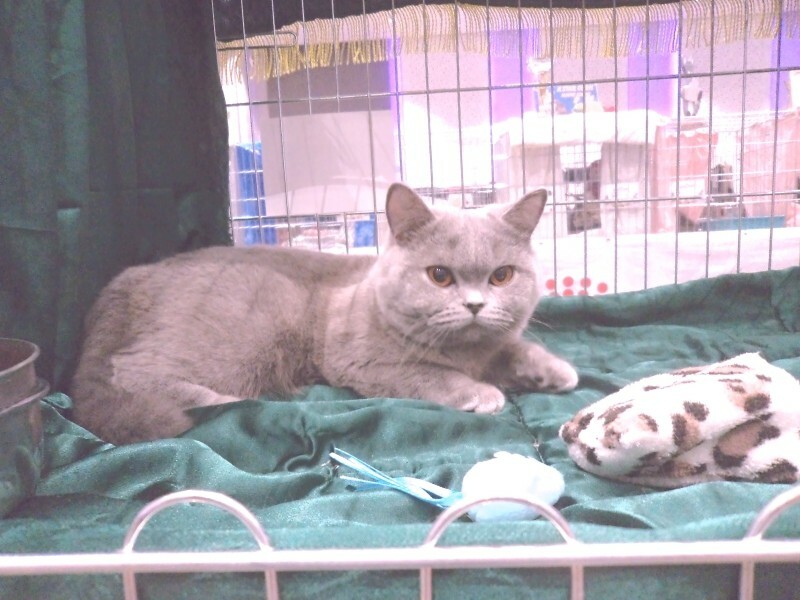 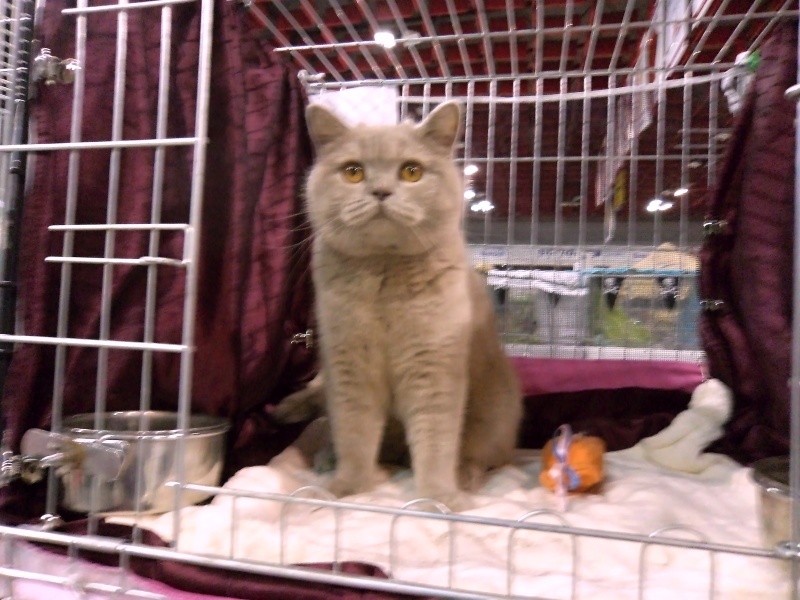 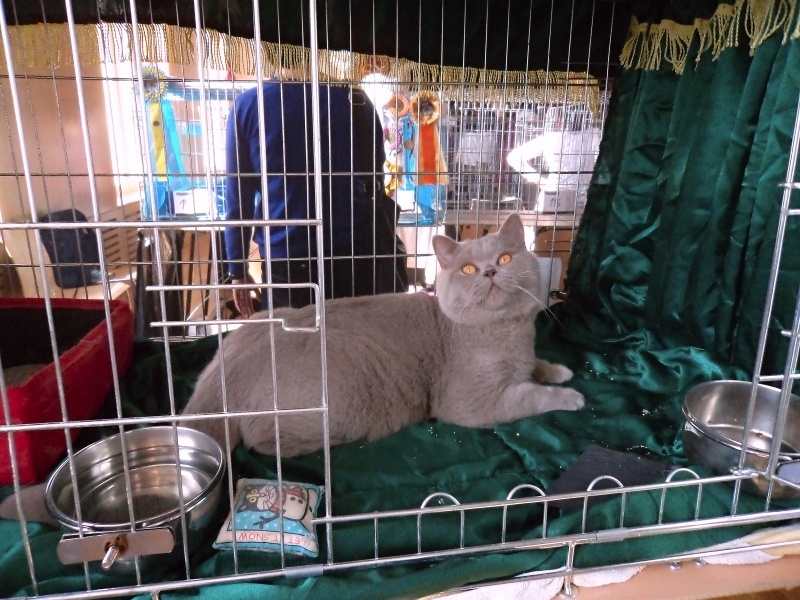 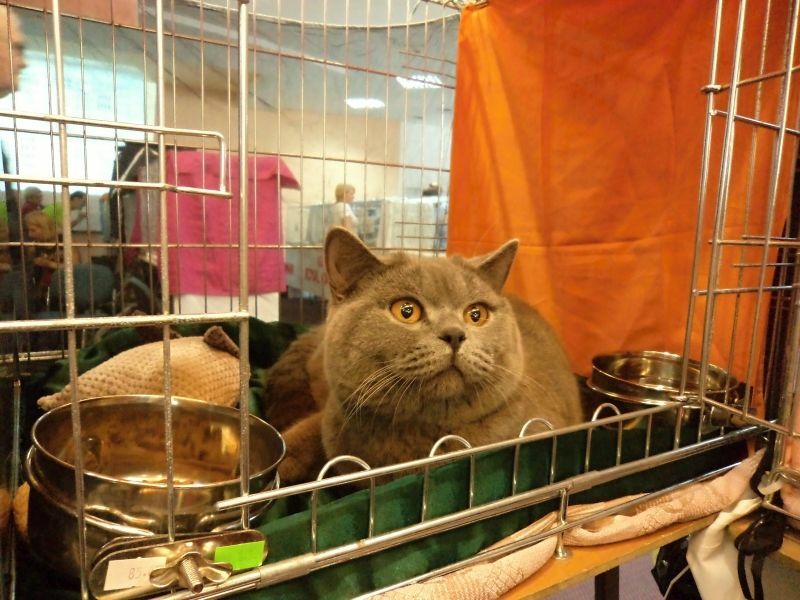 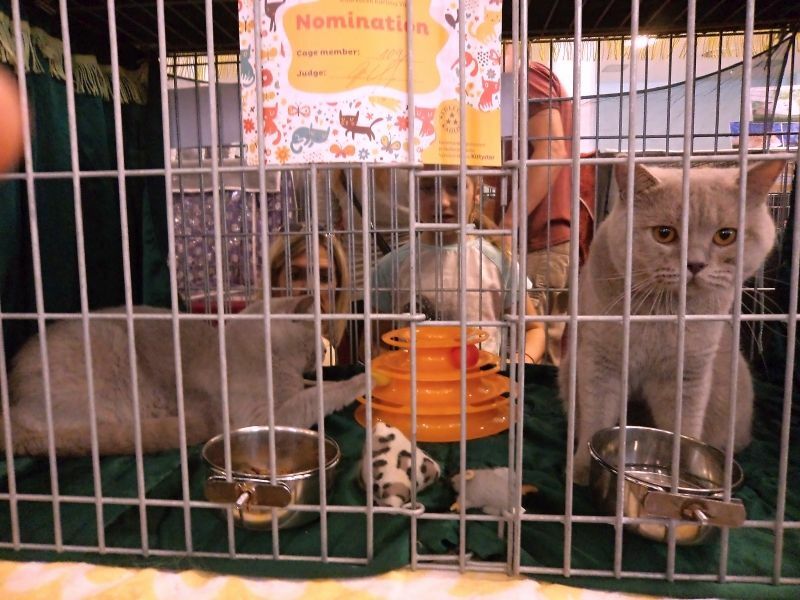 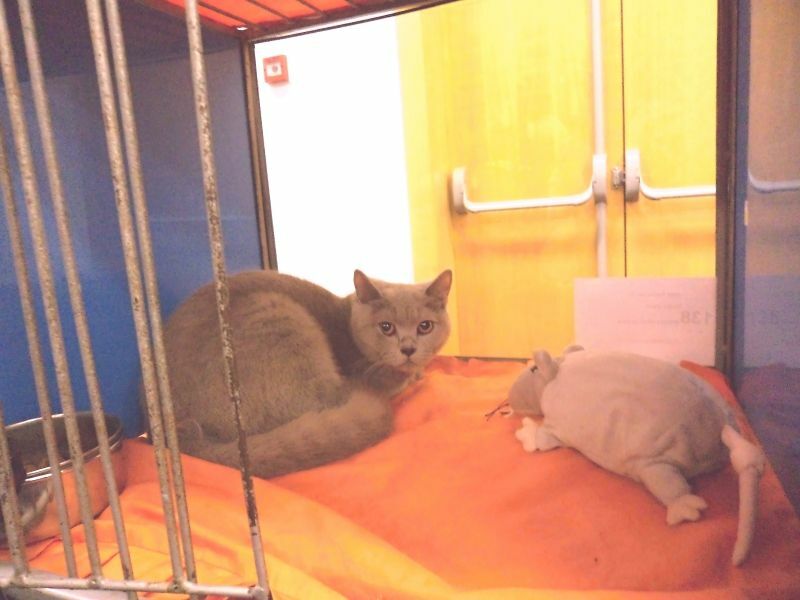 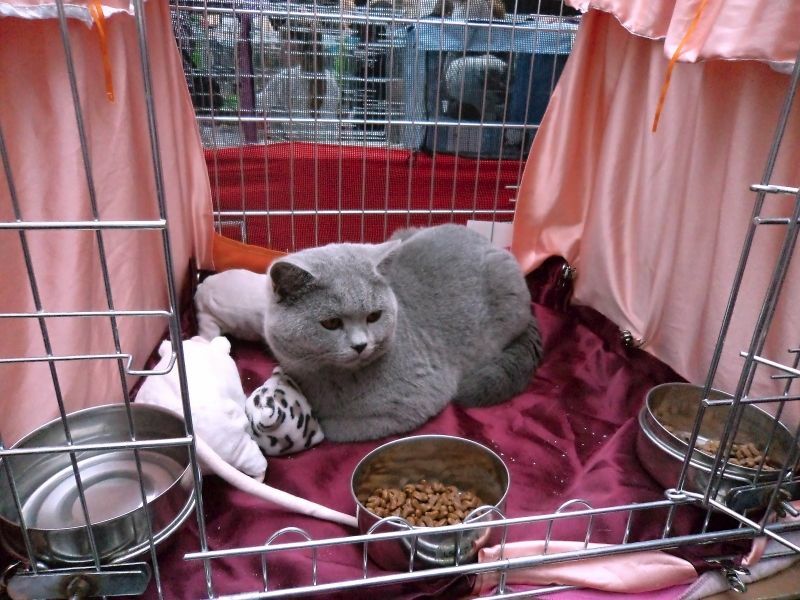 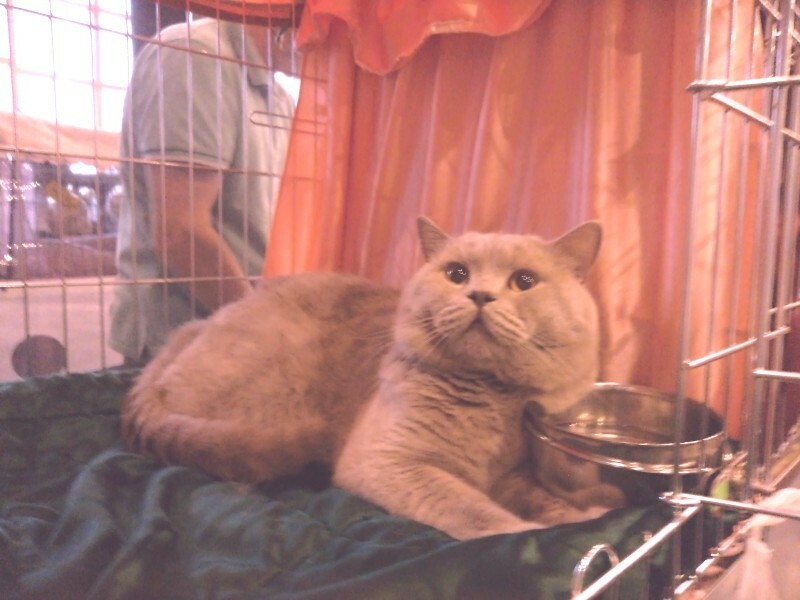 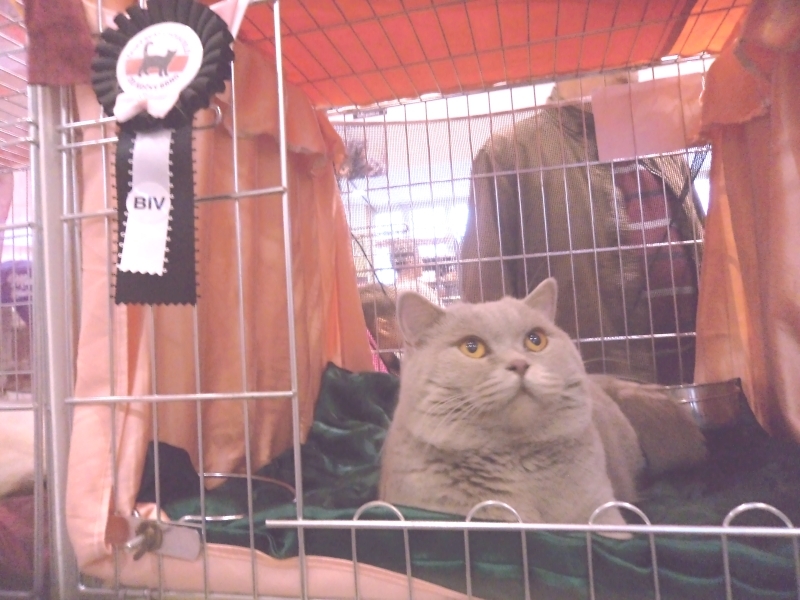 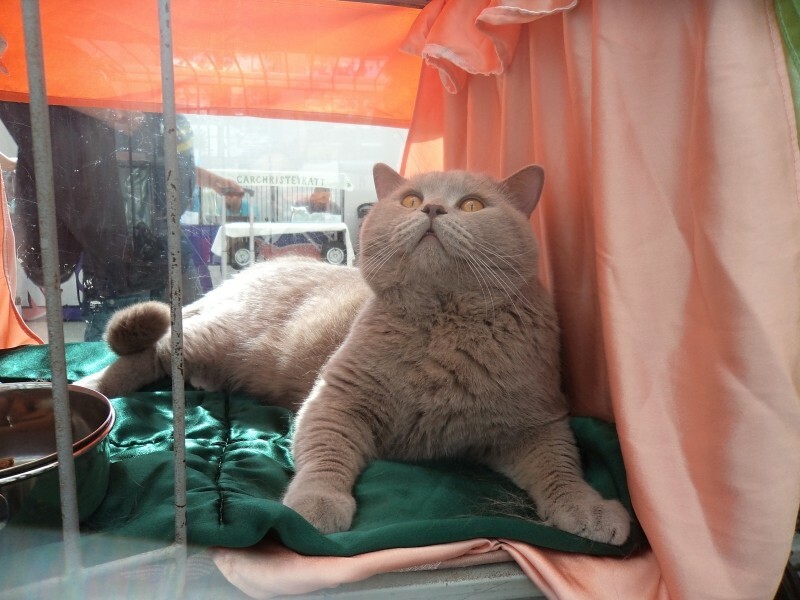 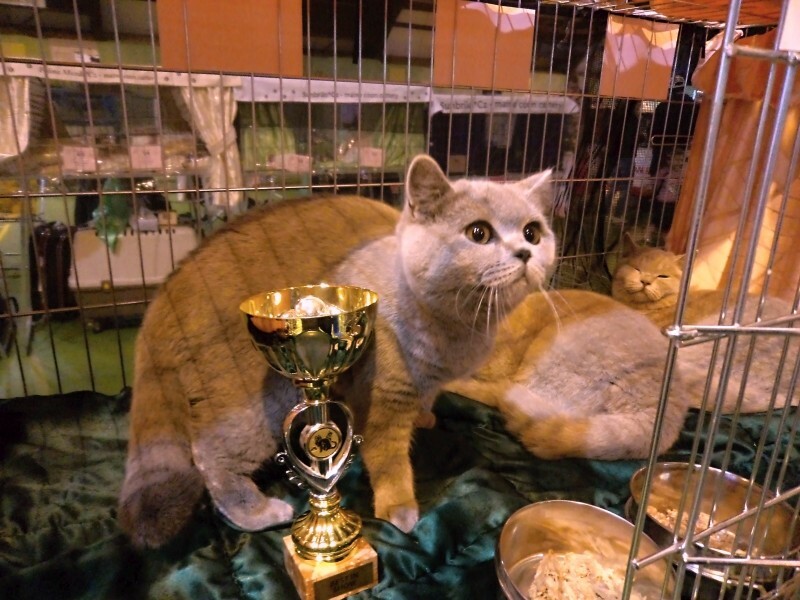 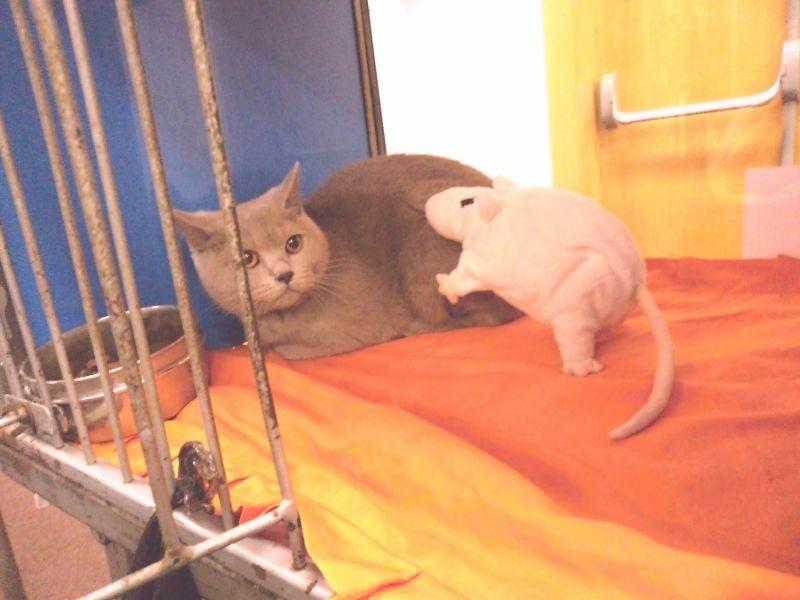 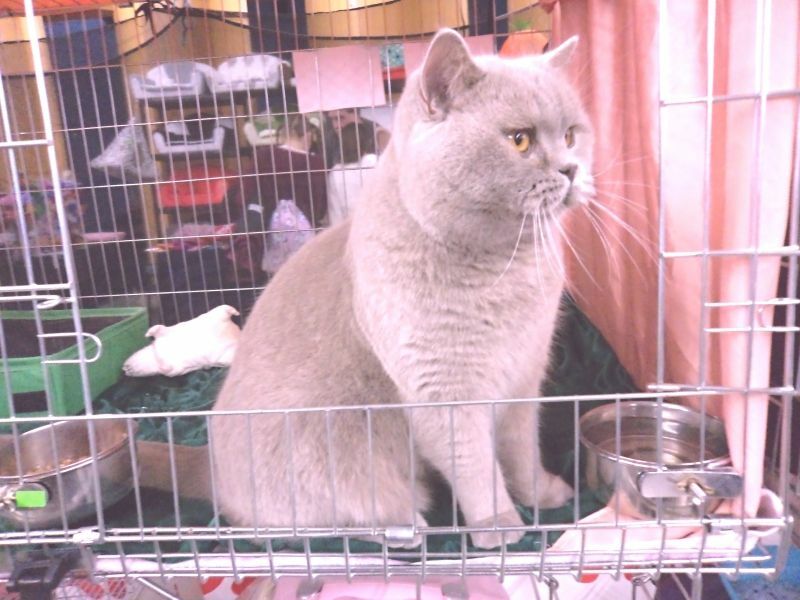 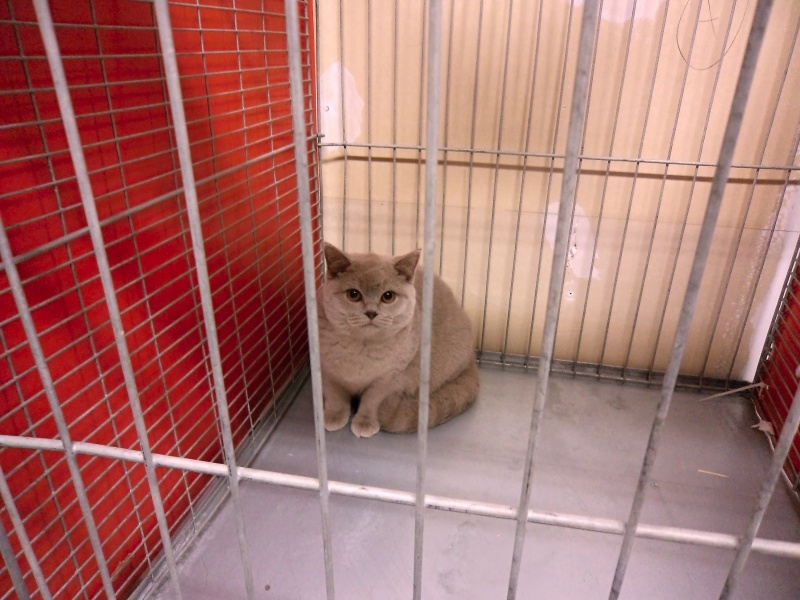 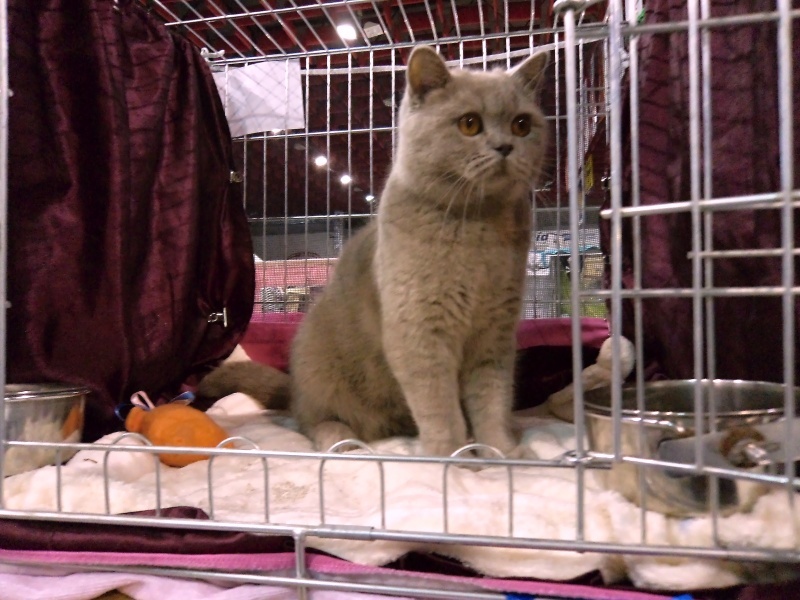 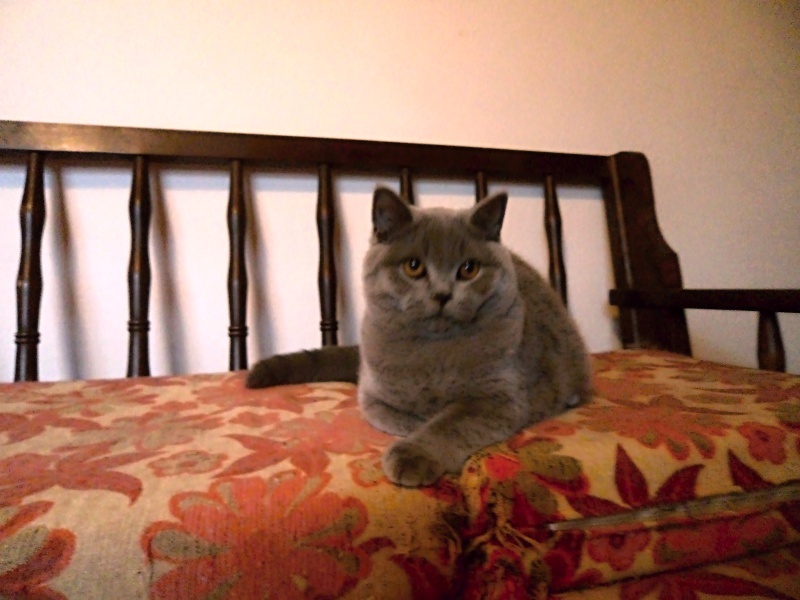 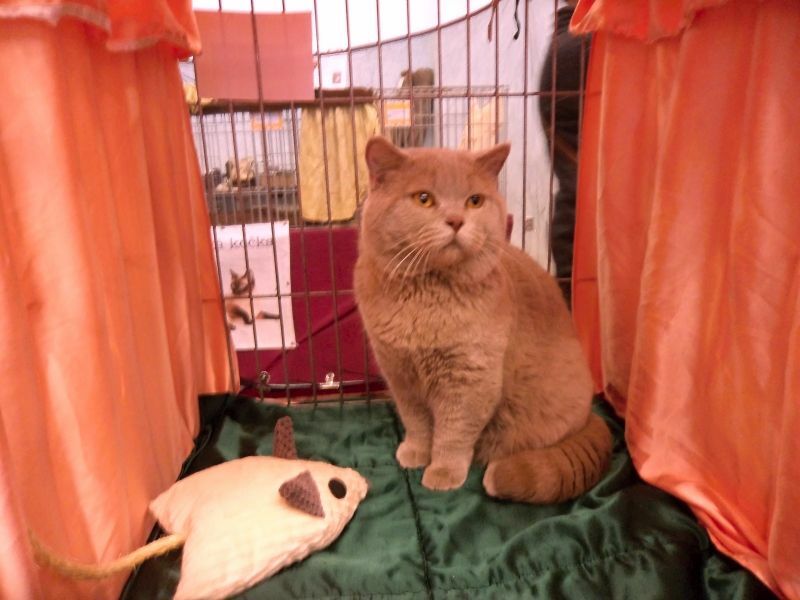 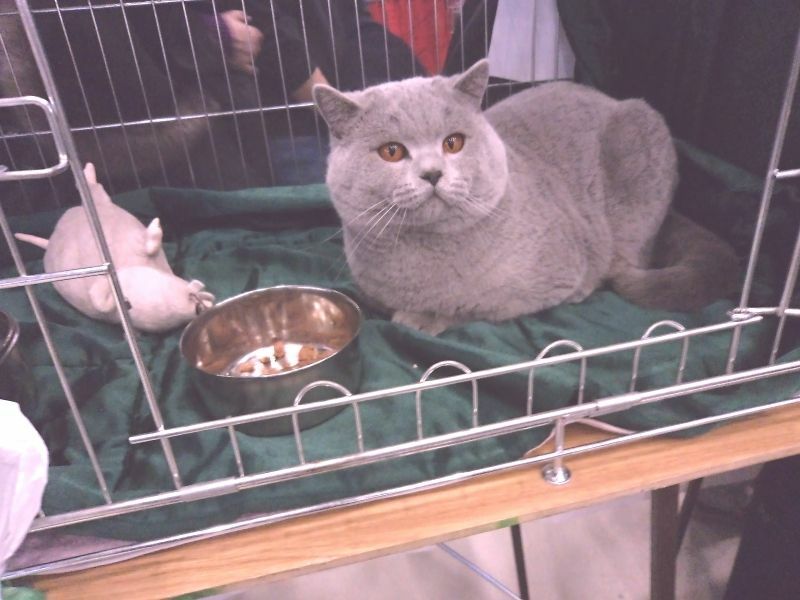 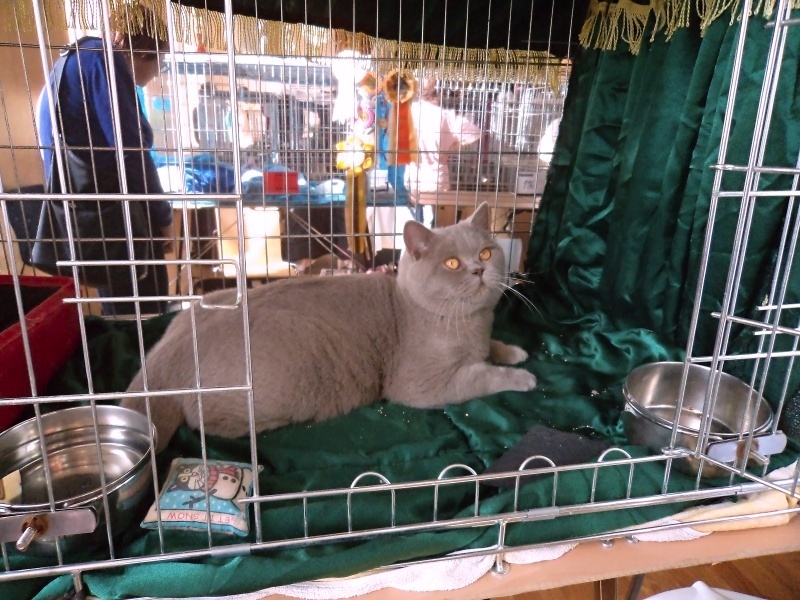 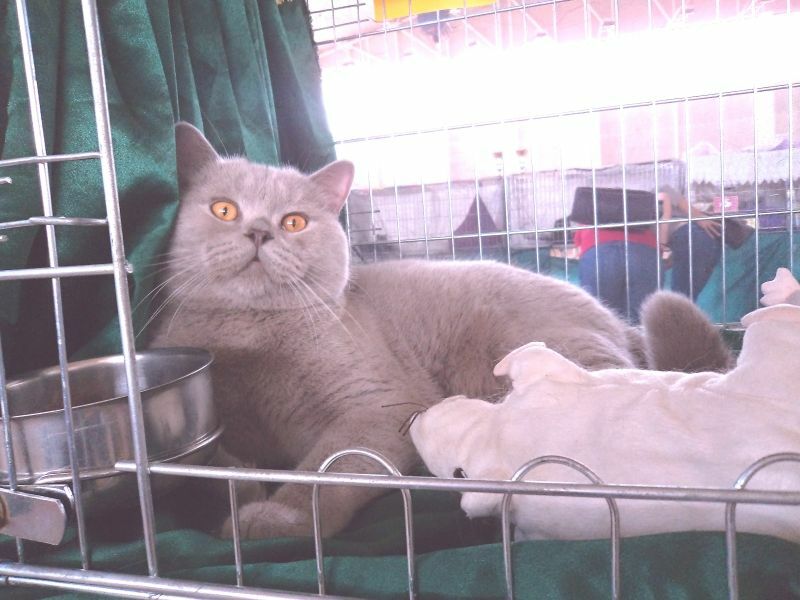 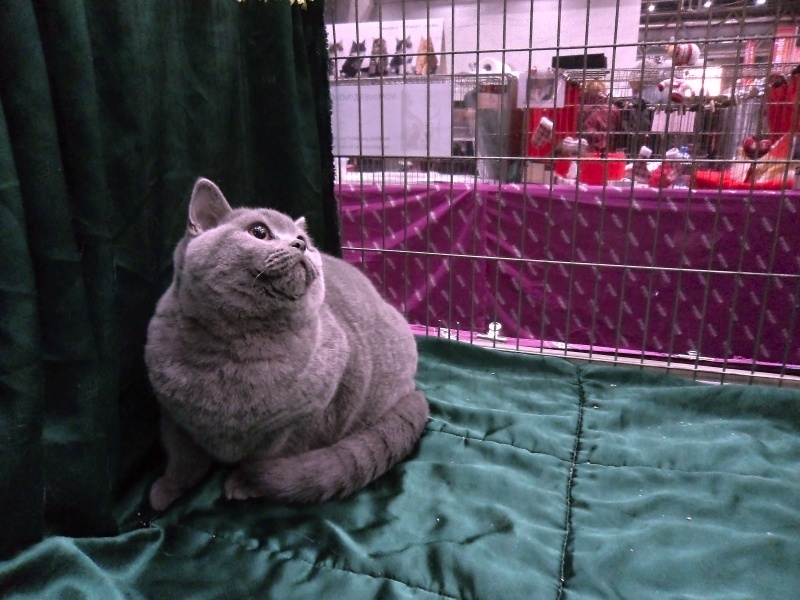 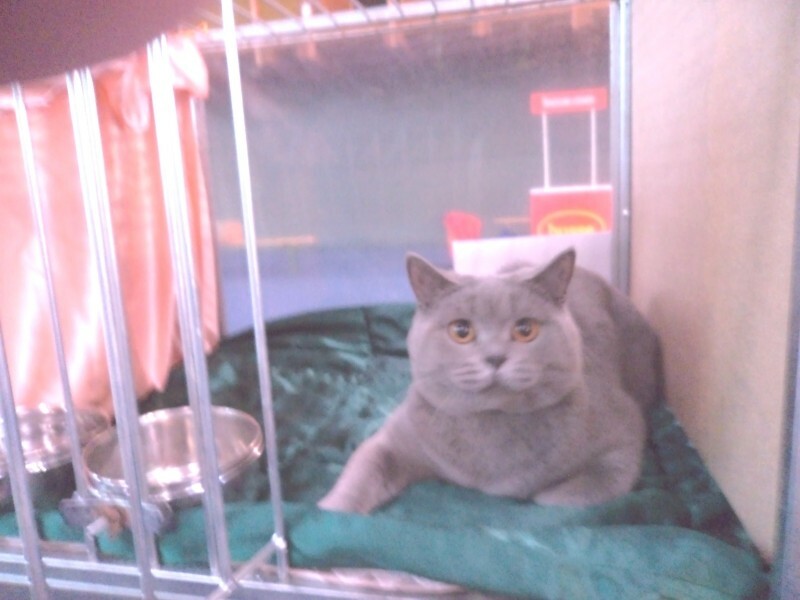 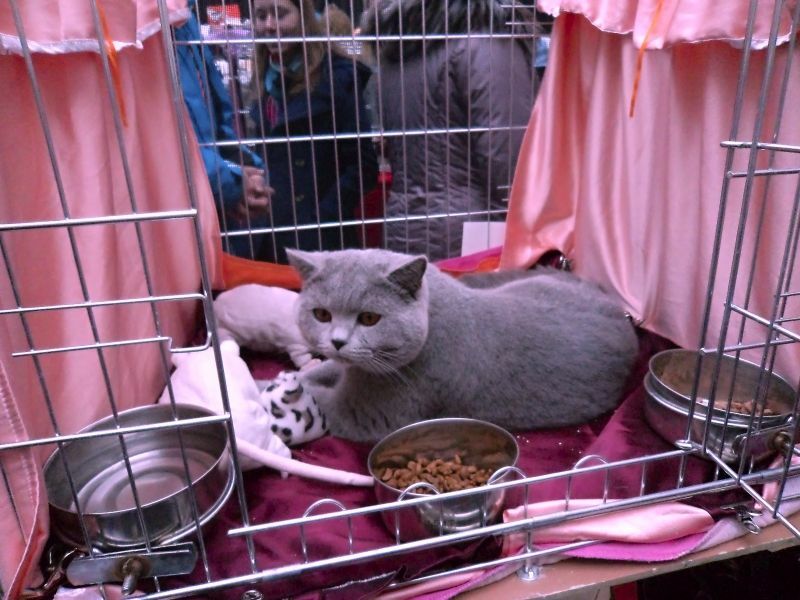 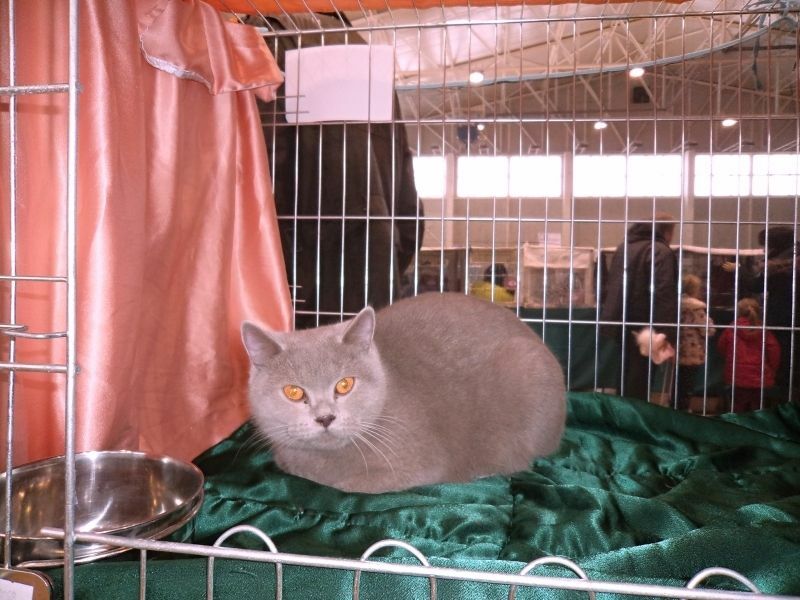 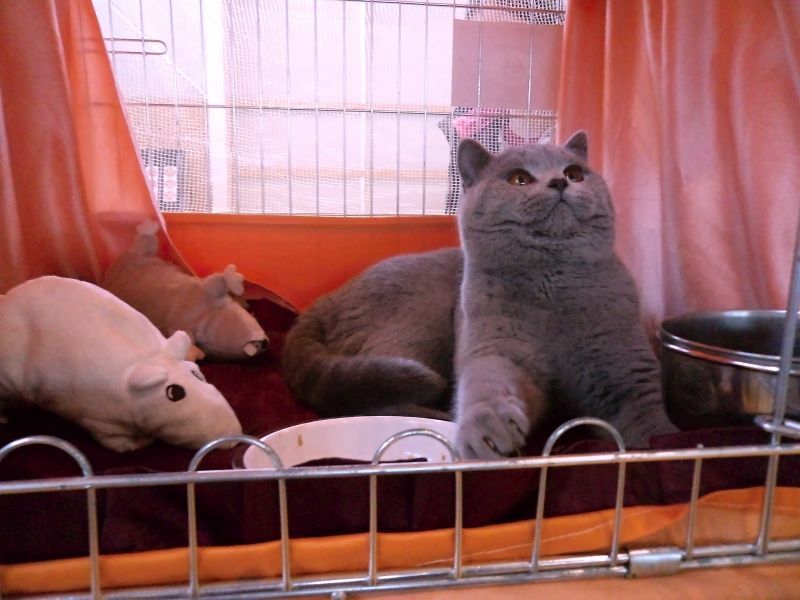 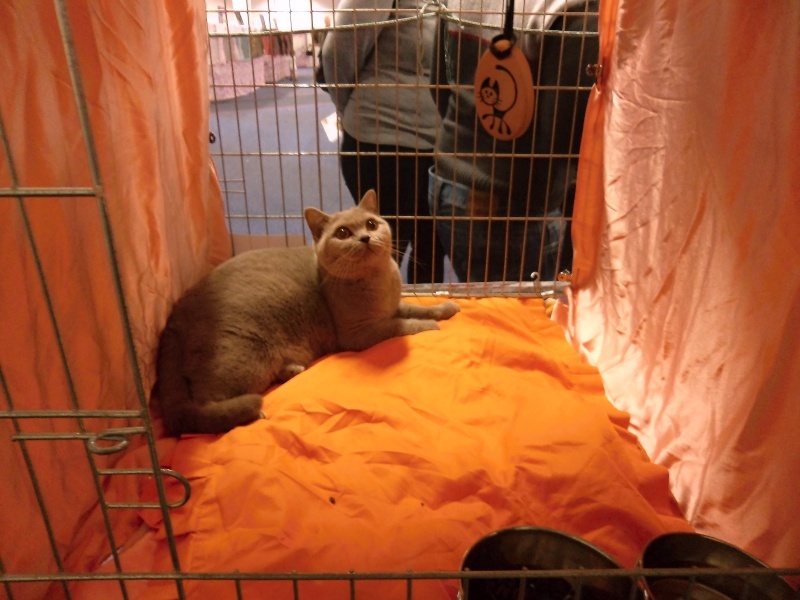 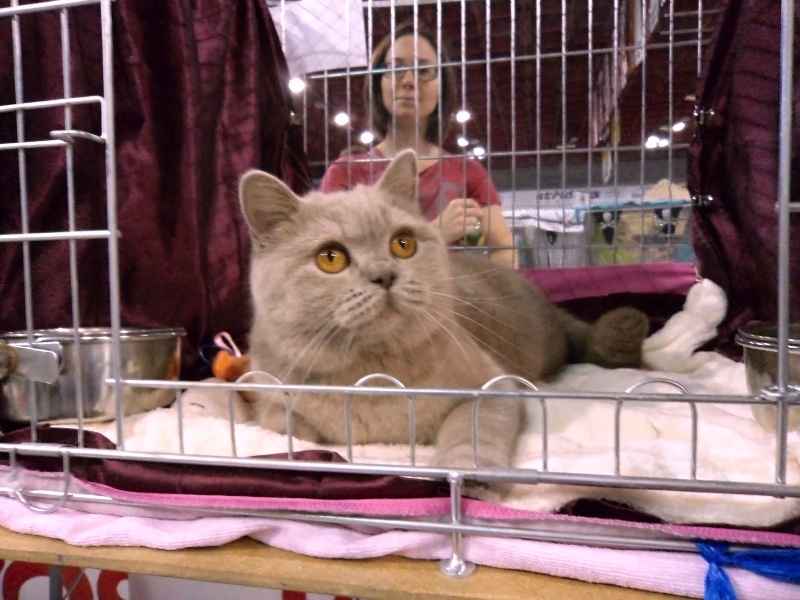 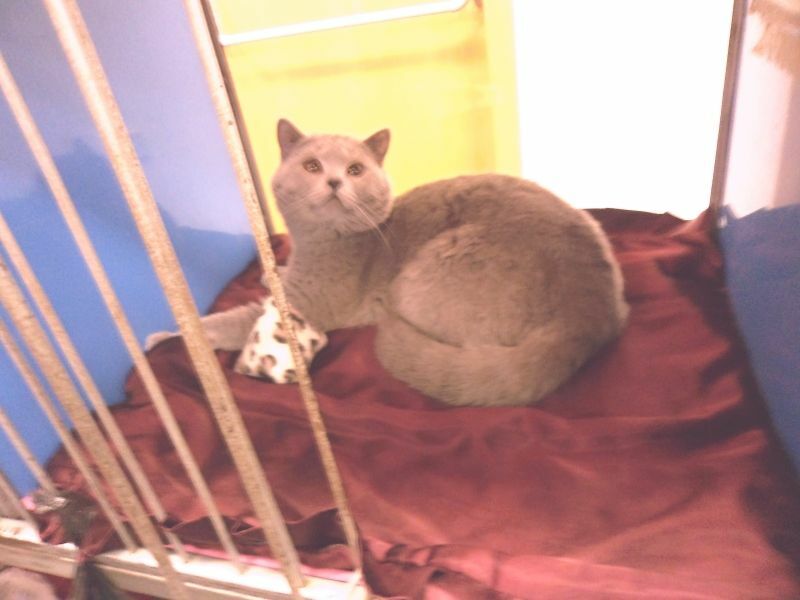 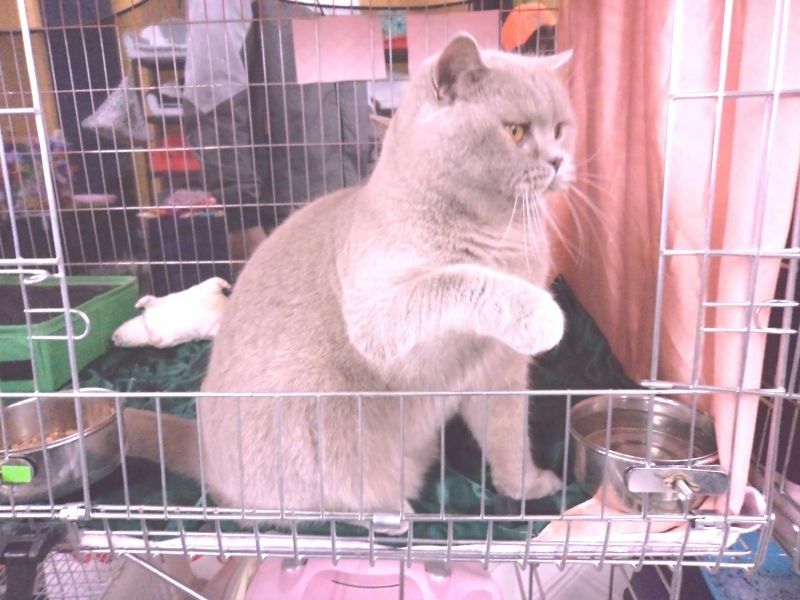 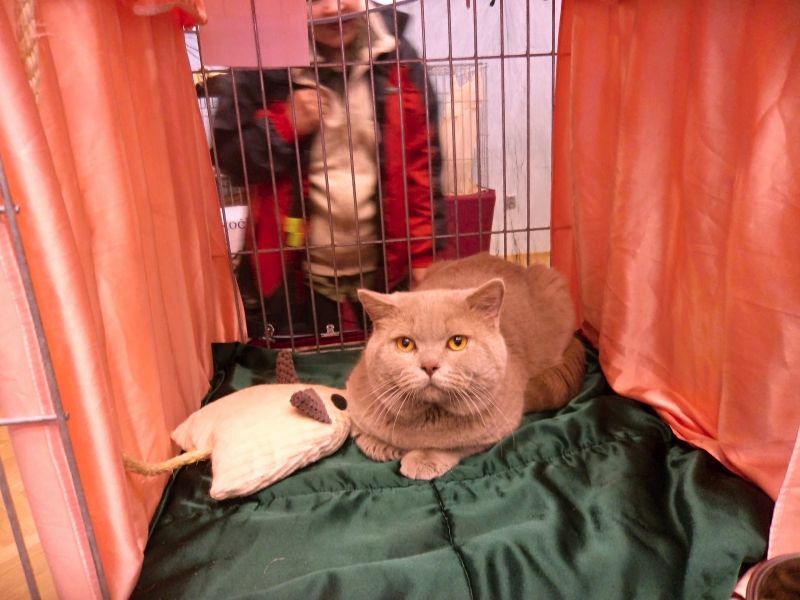 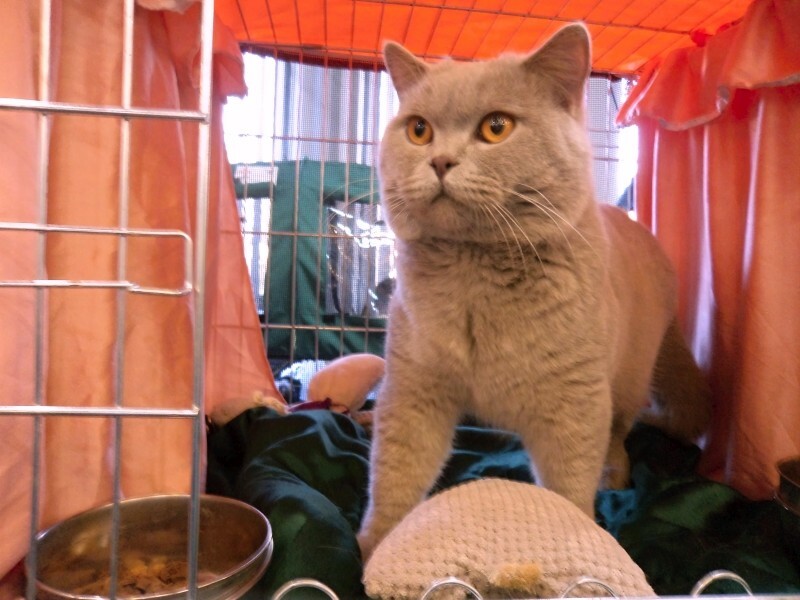 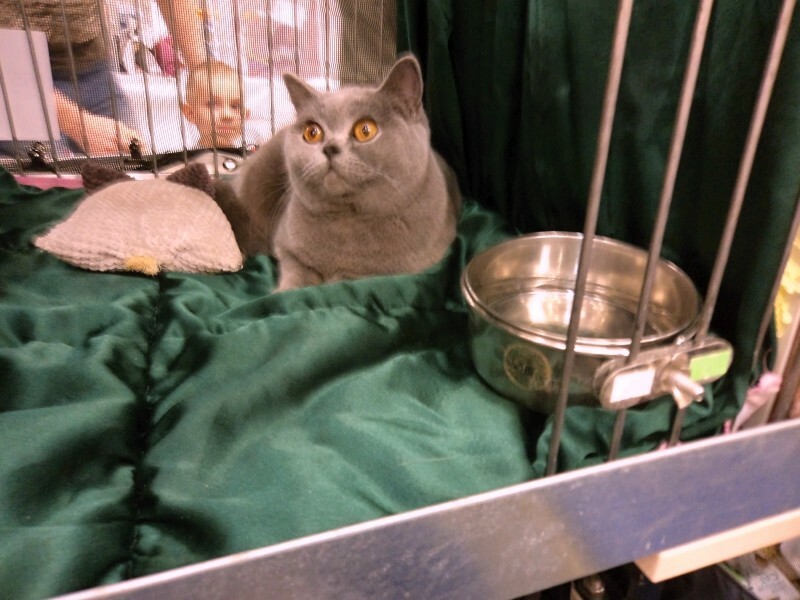 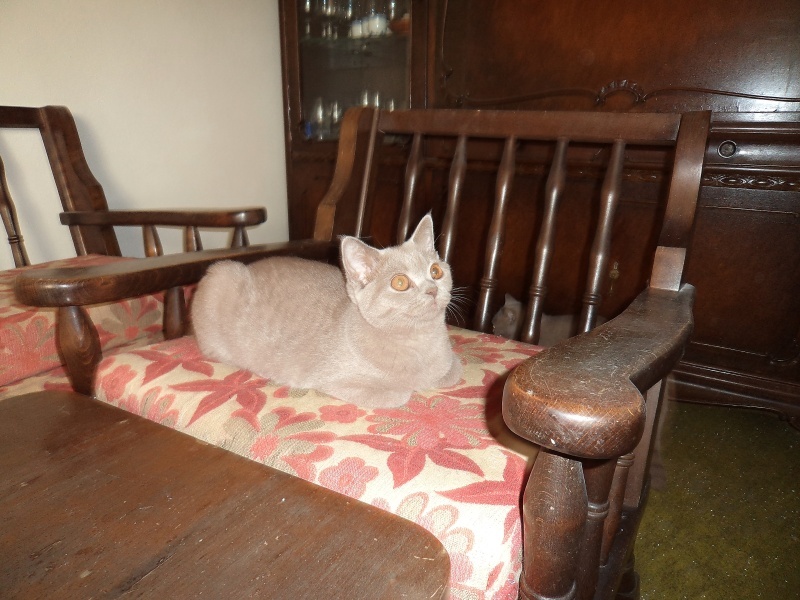 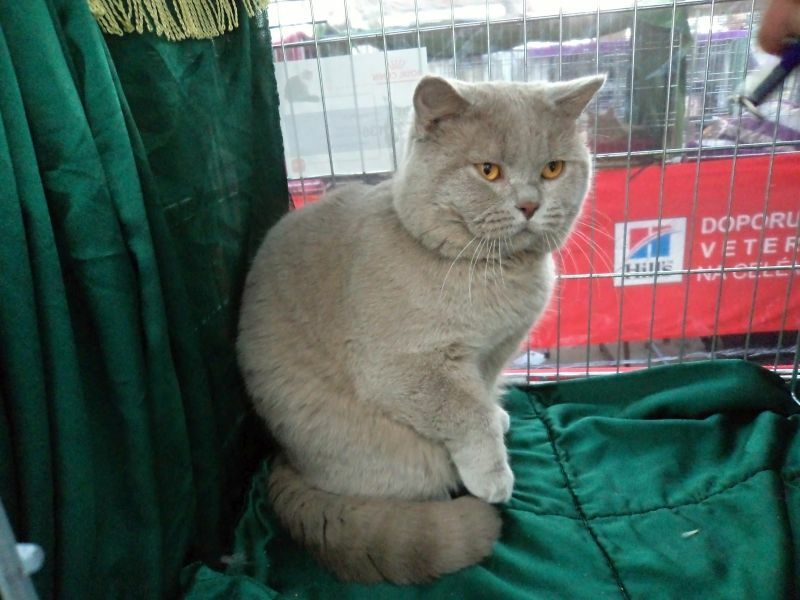 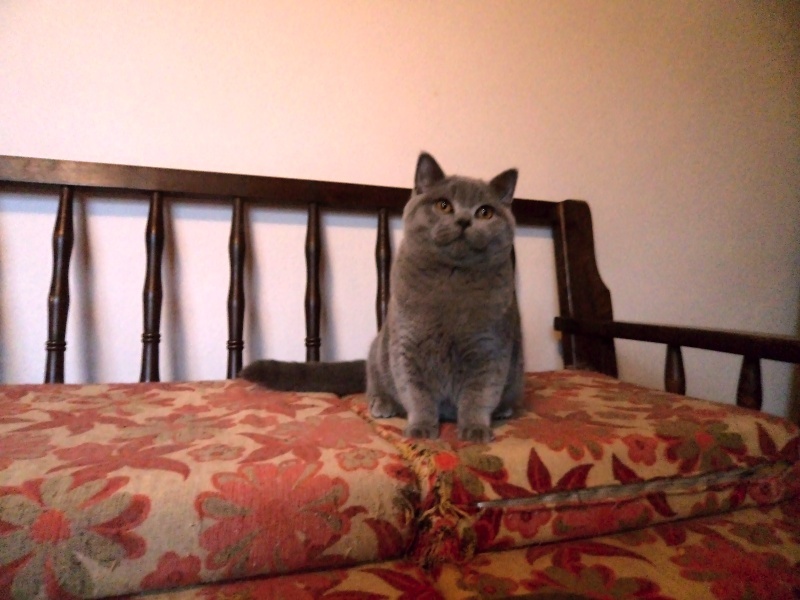 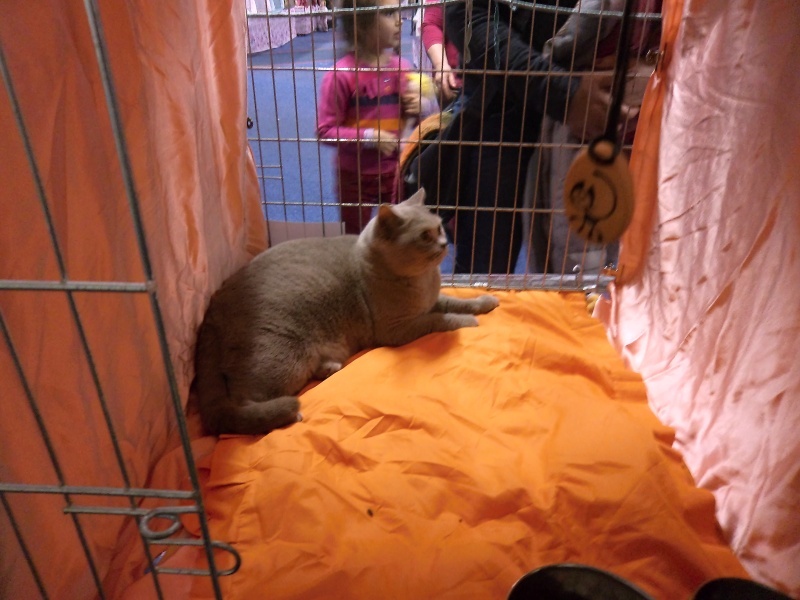 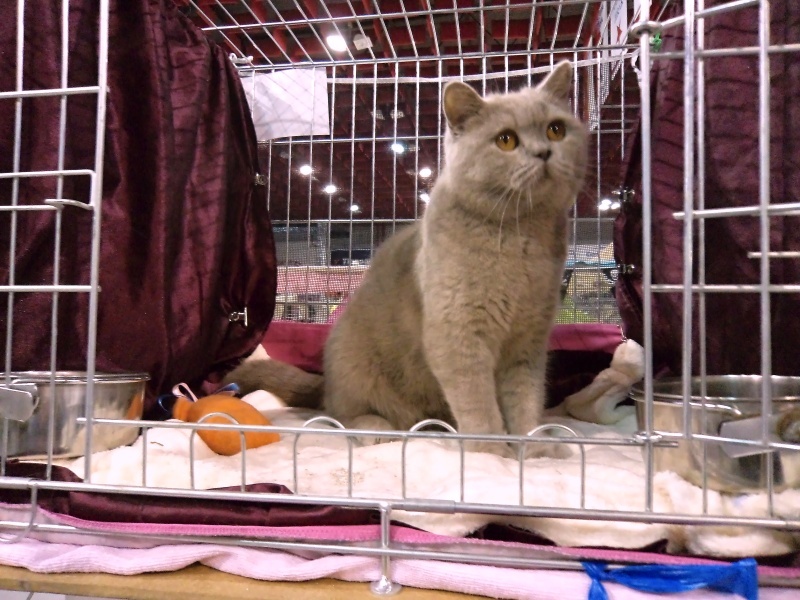 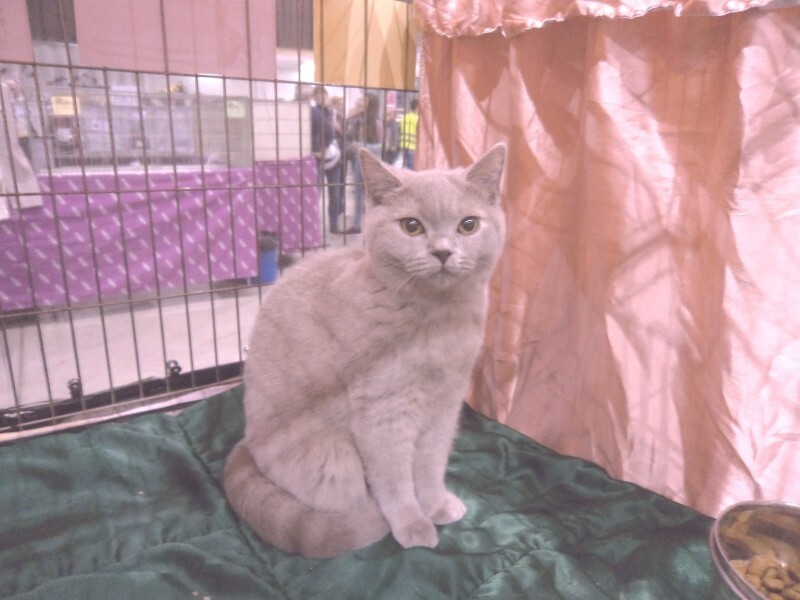 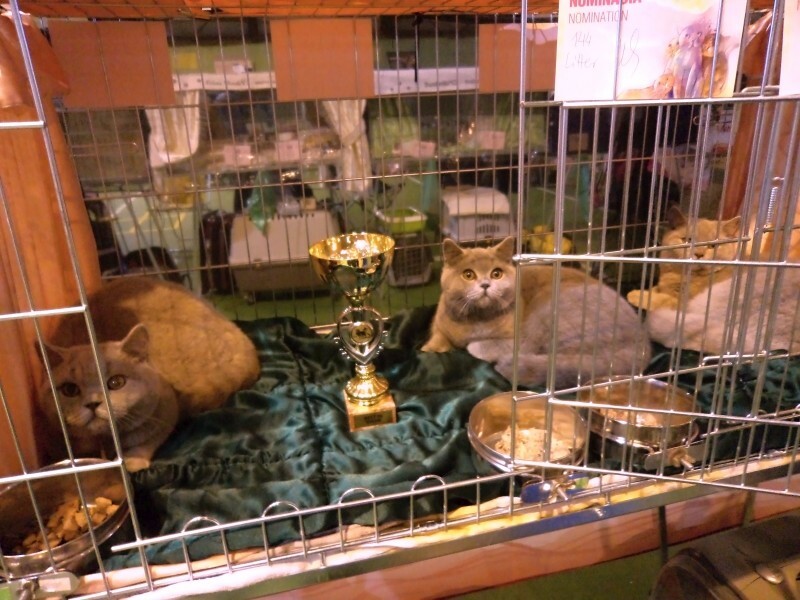 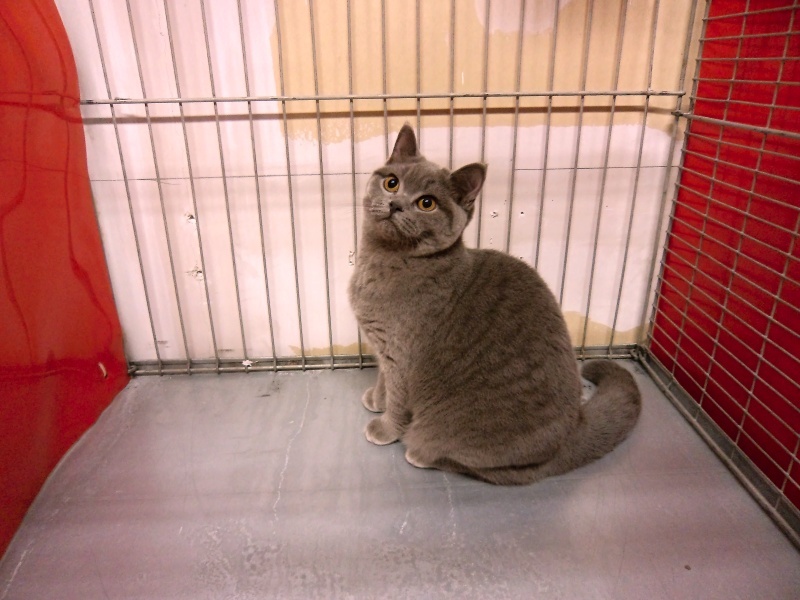 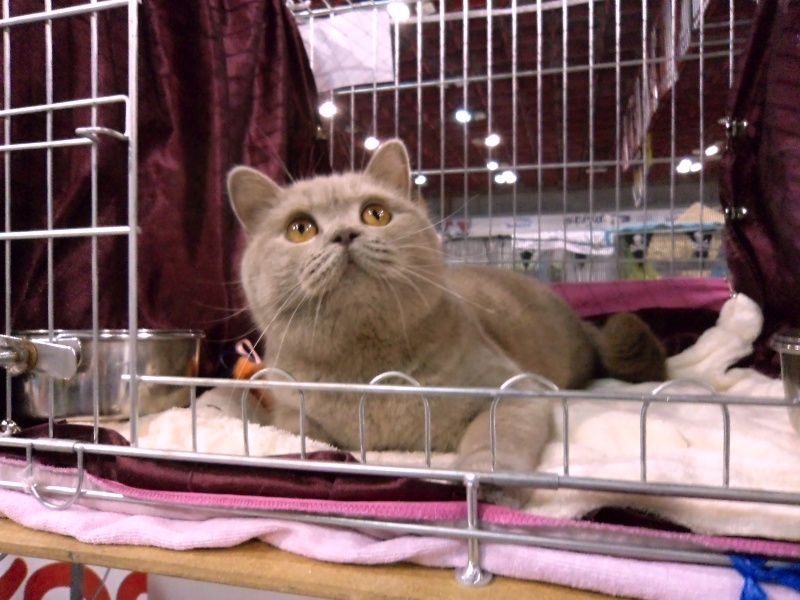 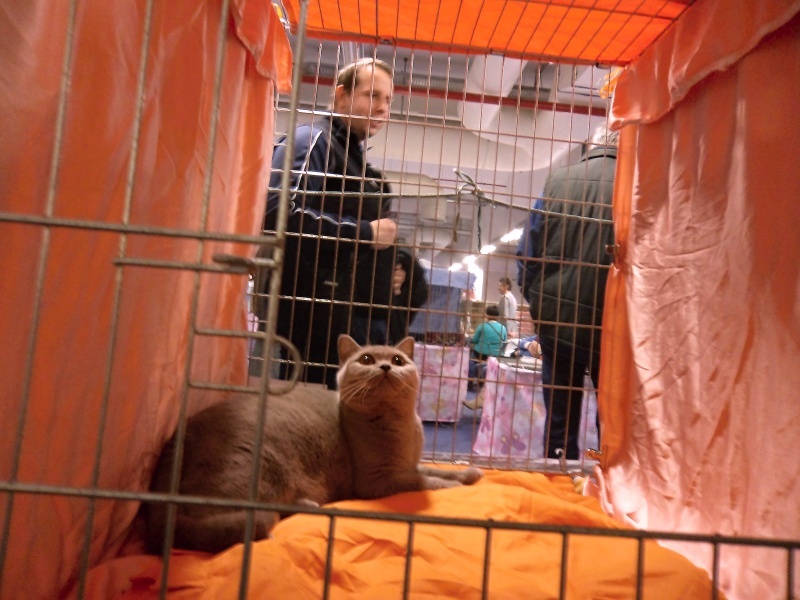 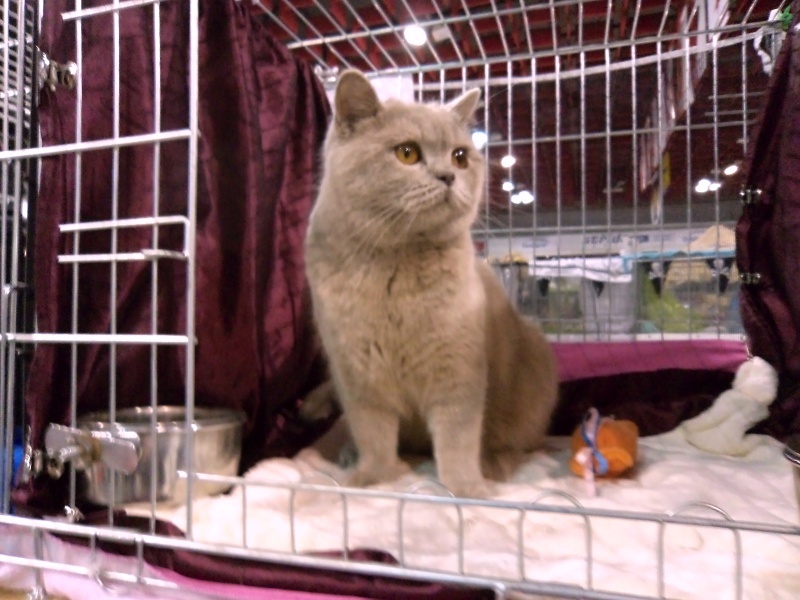 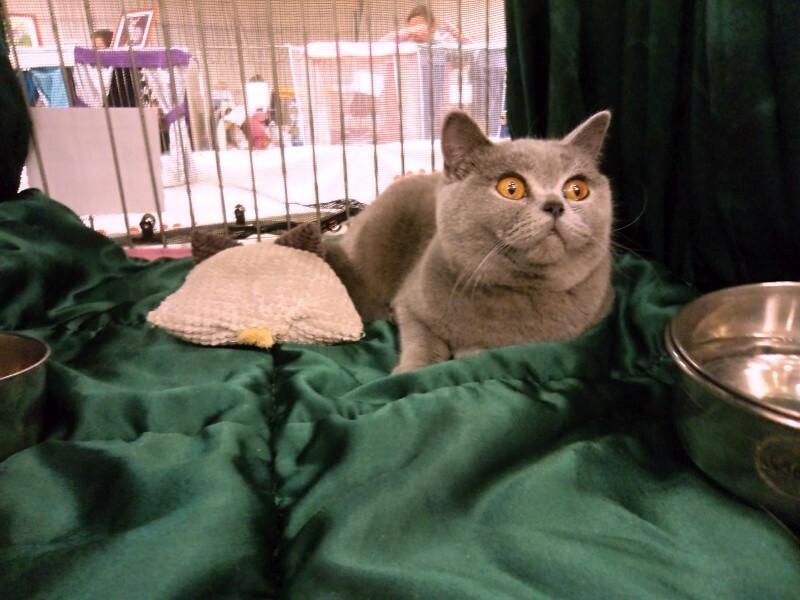 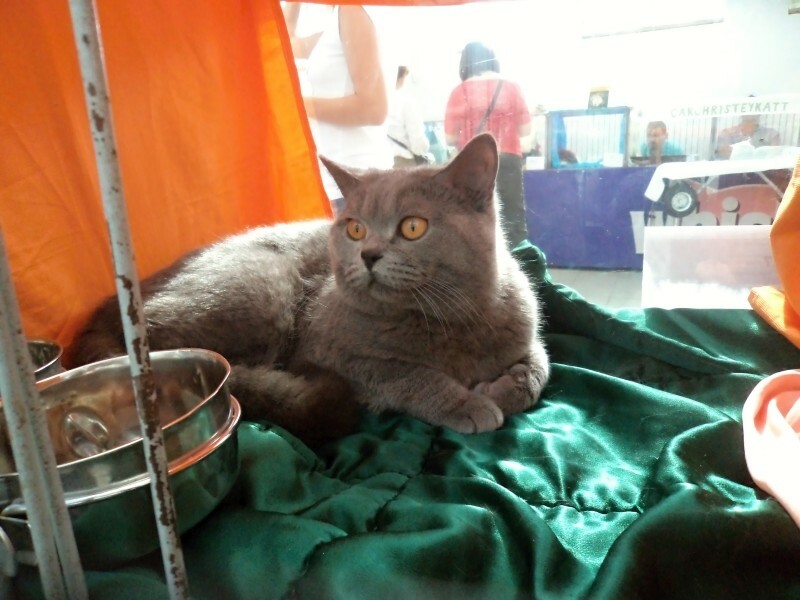 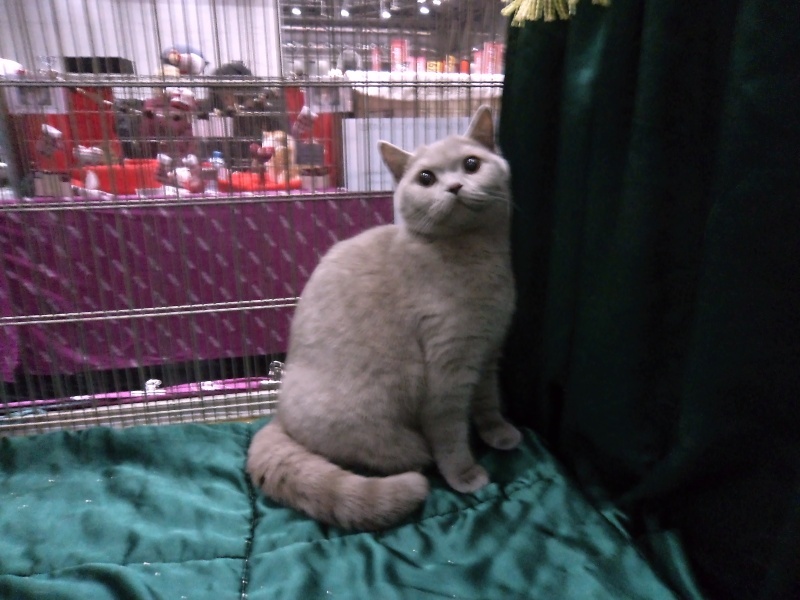 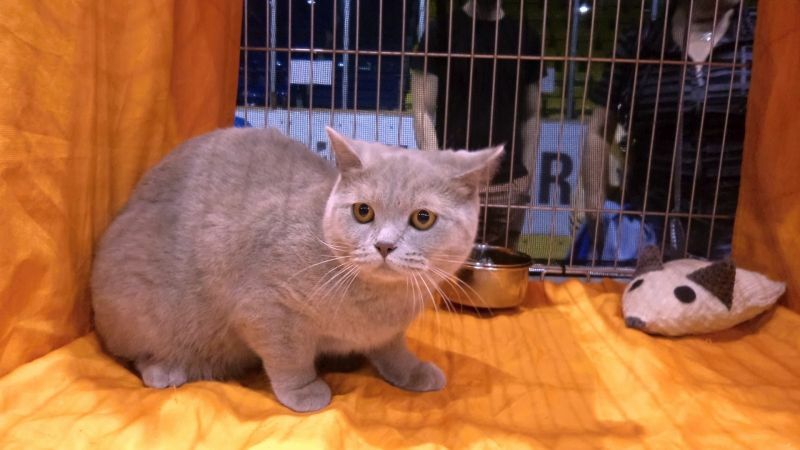 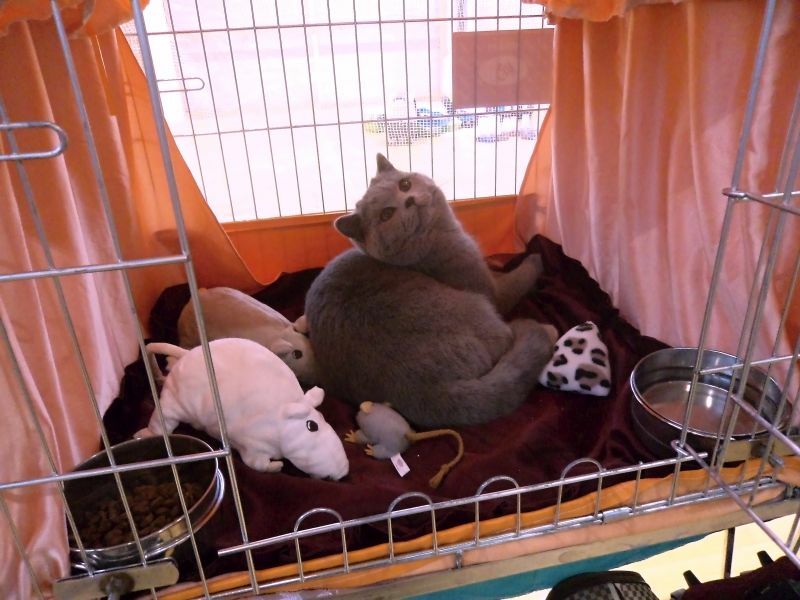 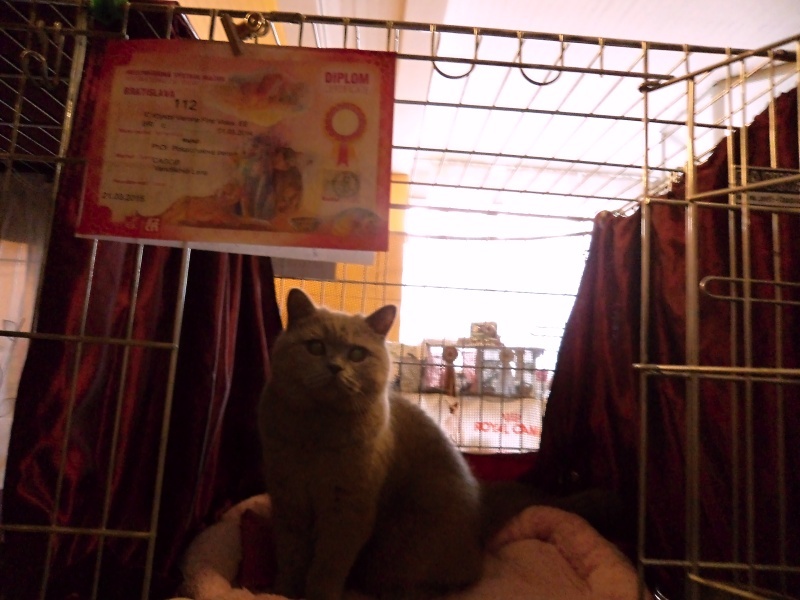 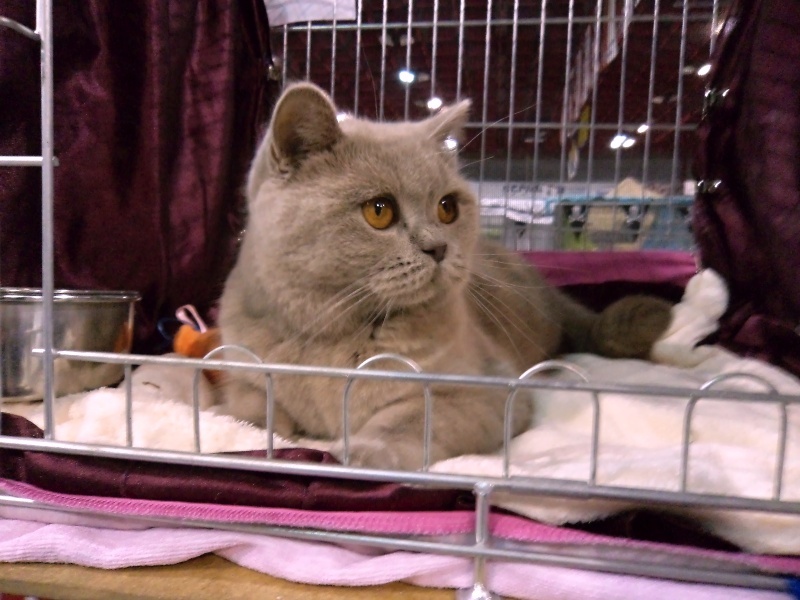 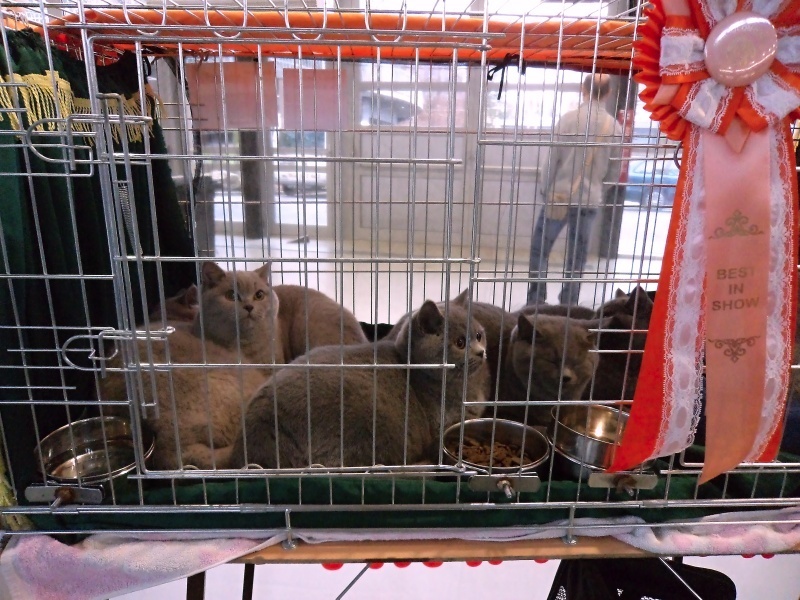 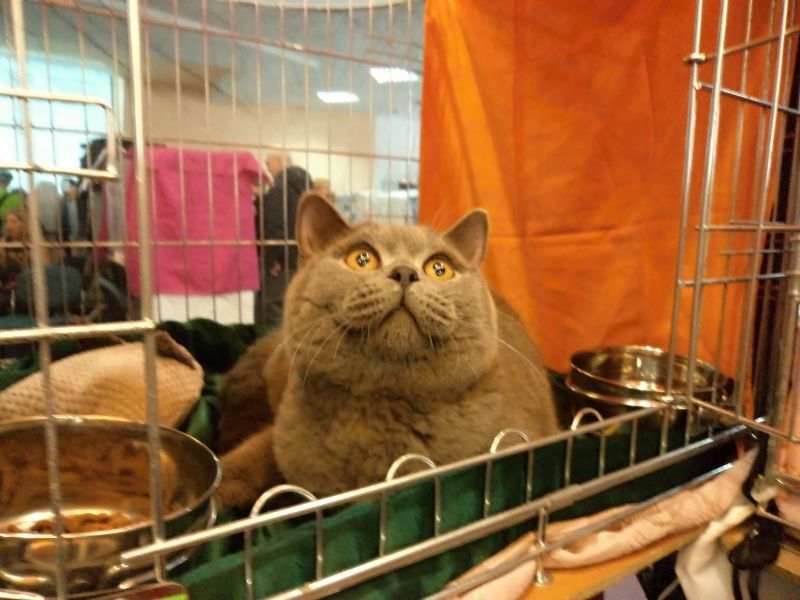 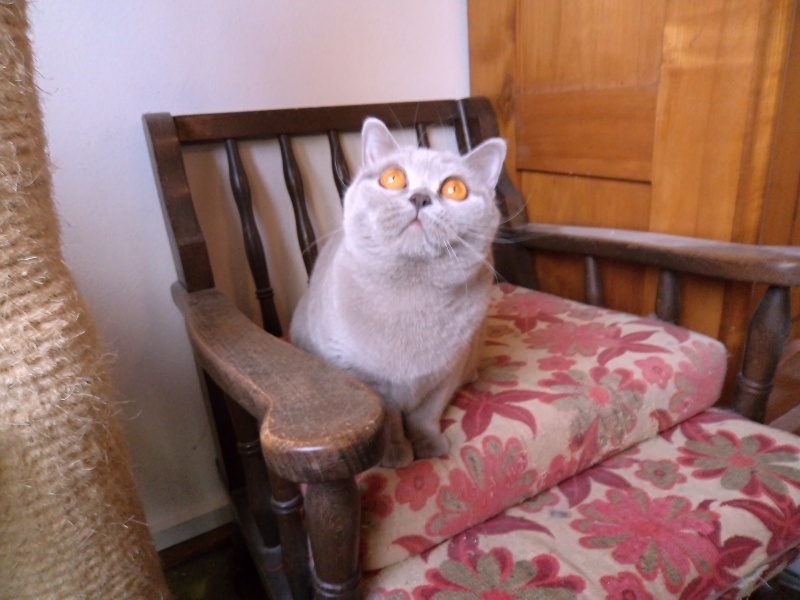 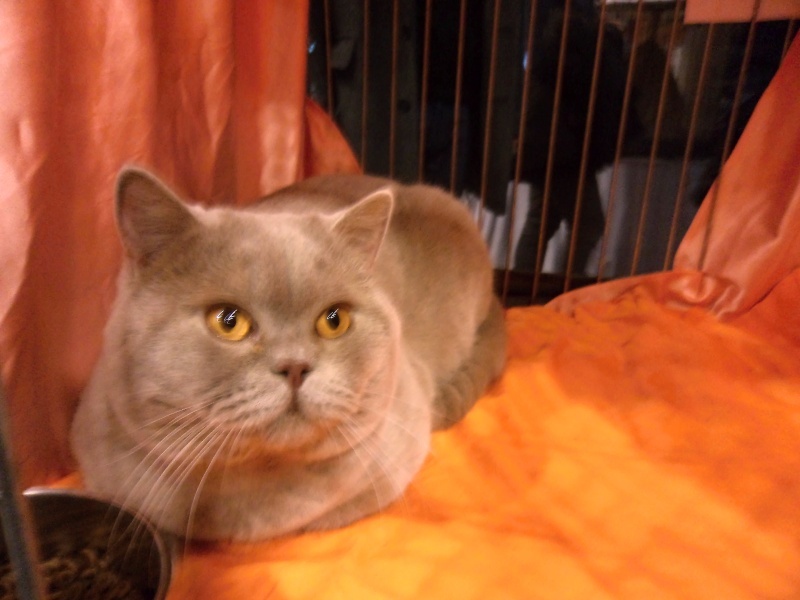 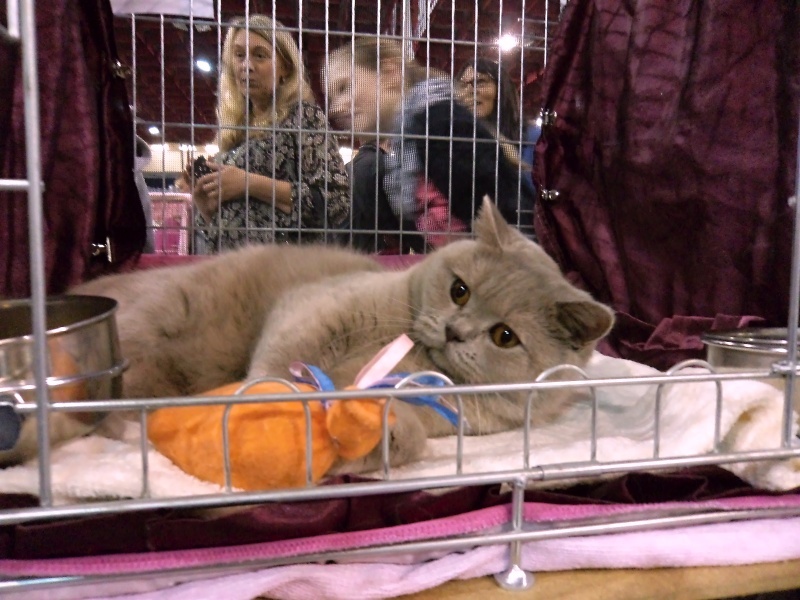 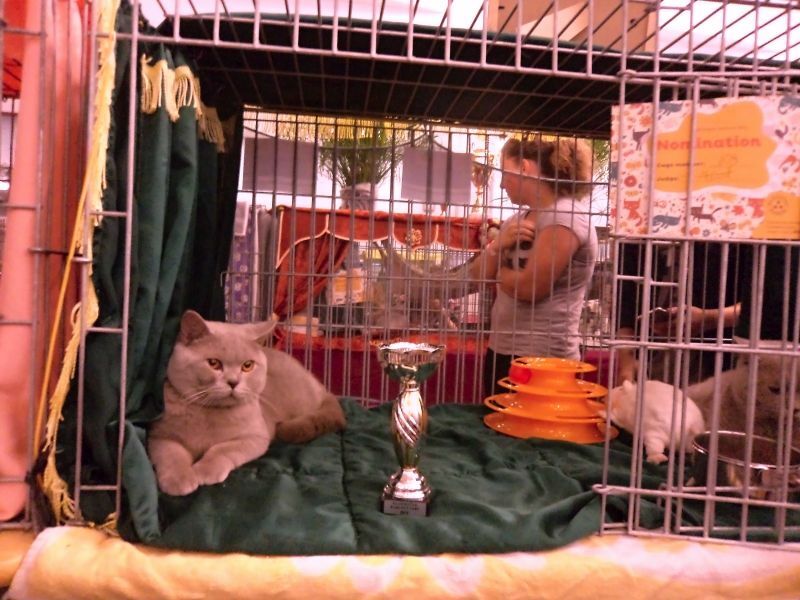 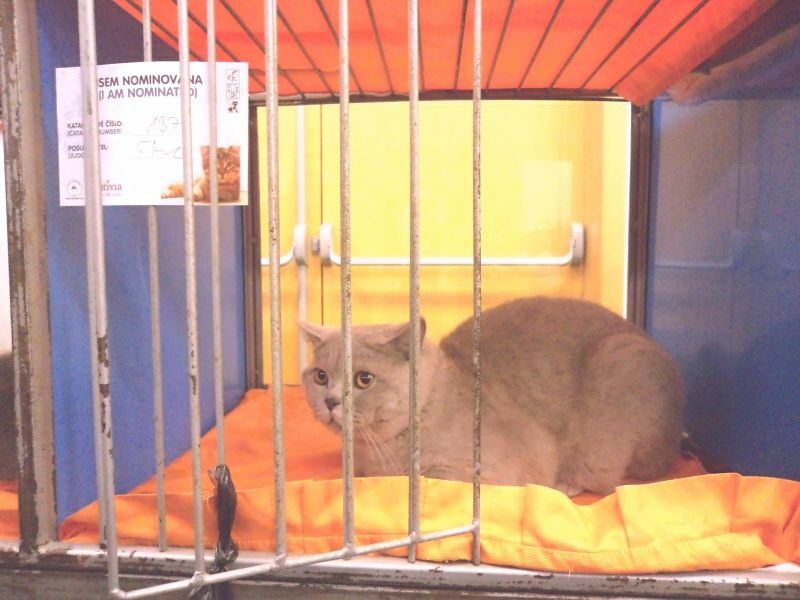 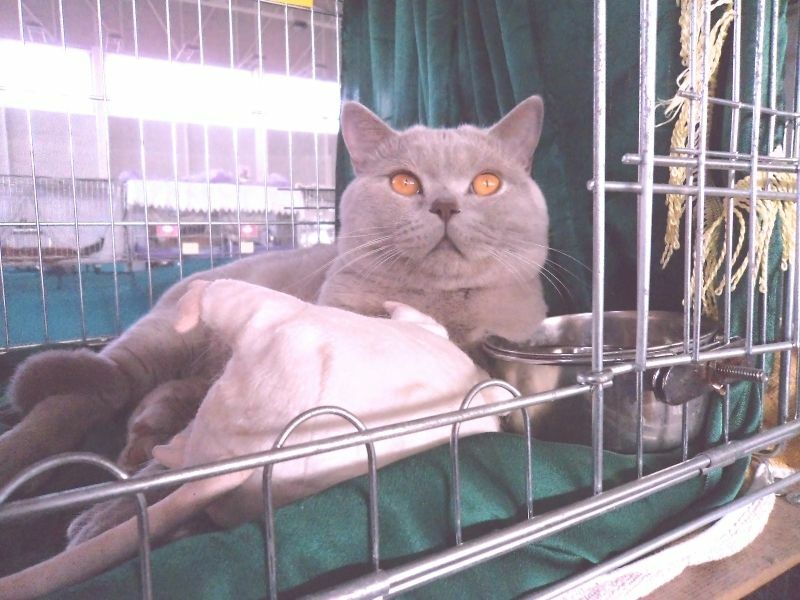 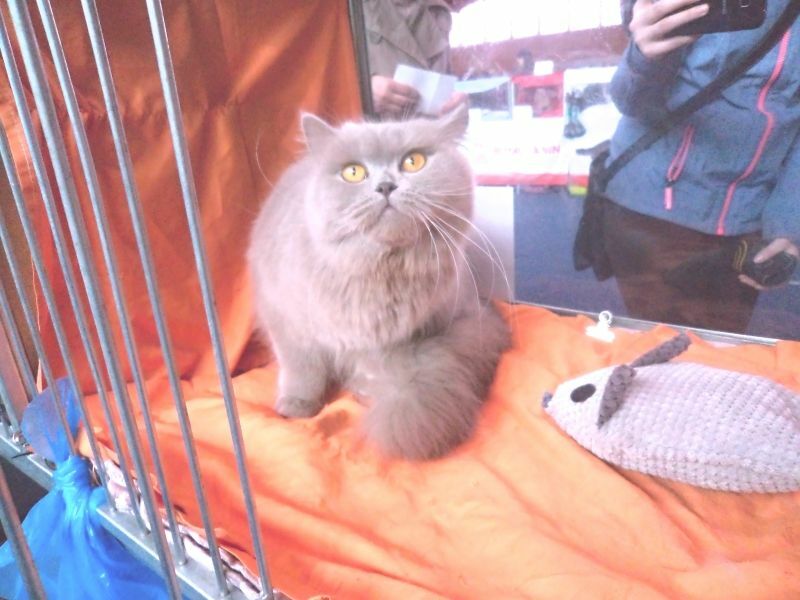 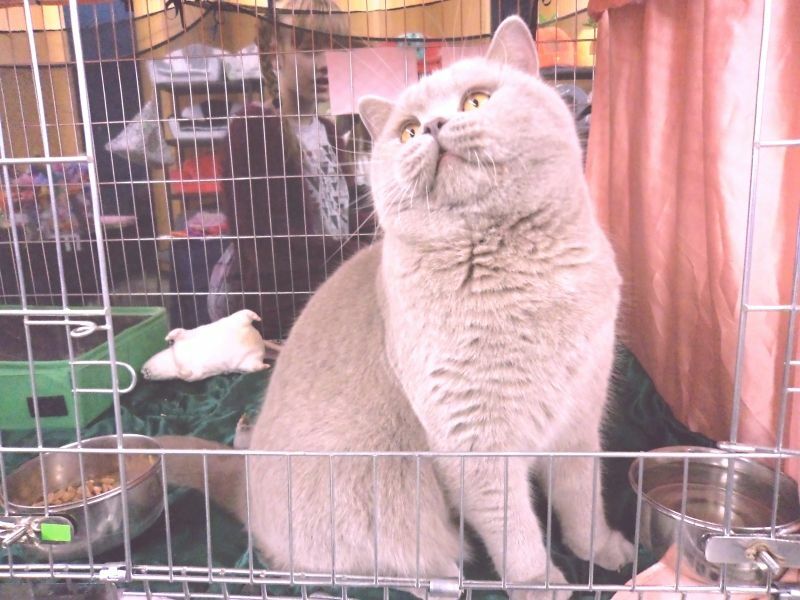 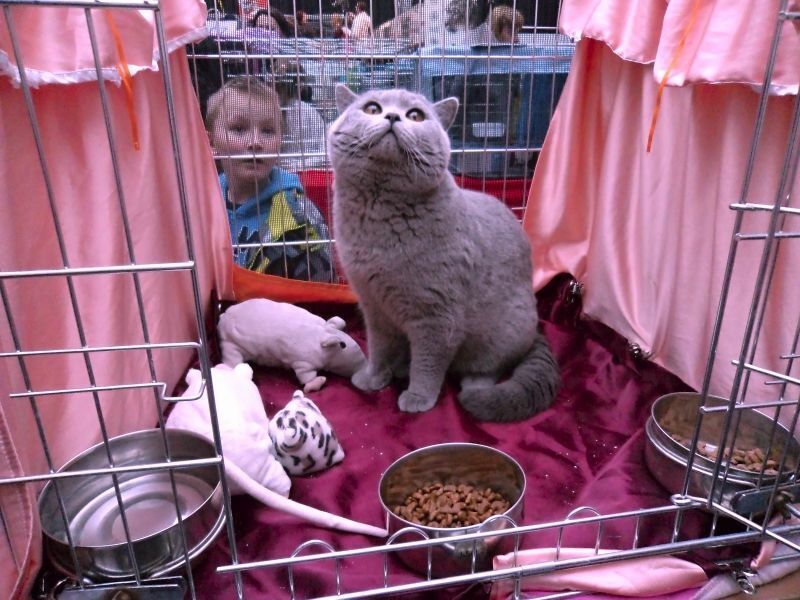 Our British shorthair blue kitten Quiggy Agnus Dei, CZ (BSH a) has got Ex.1 + NOM on Saturday and Ex.1 + BIS on Sunday. 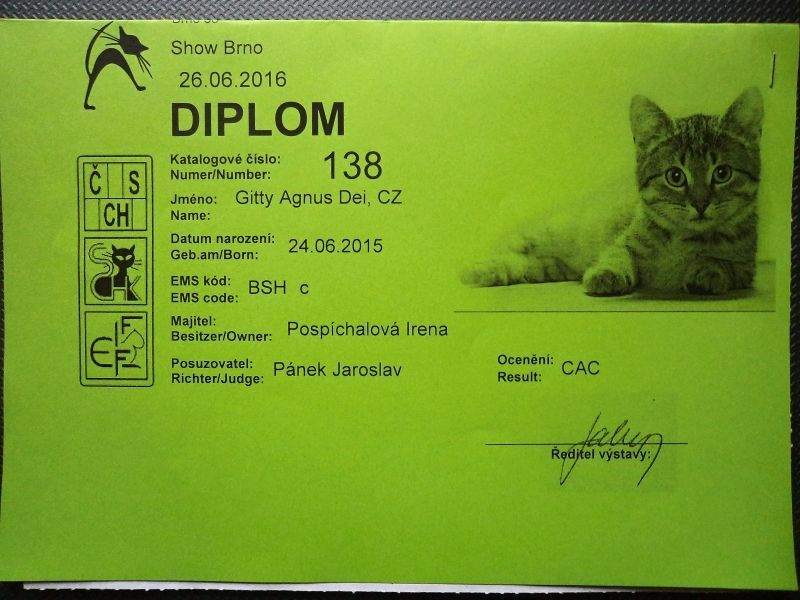 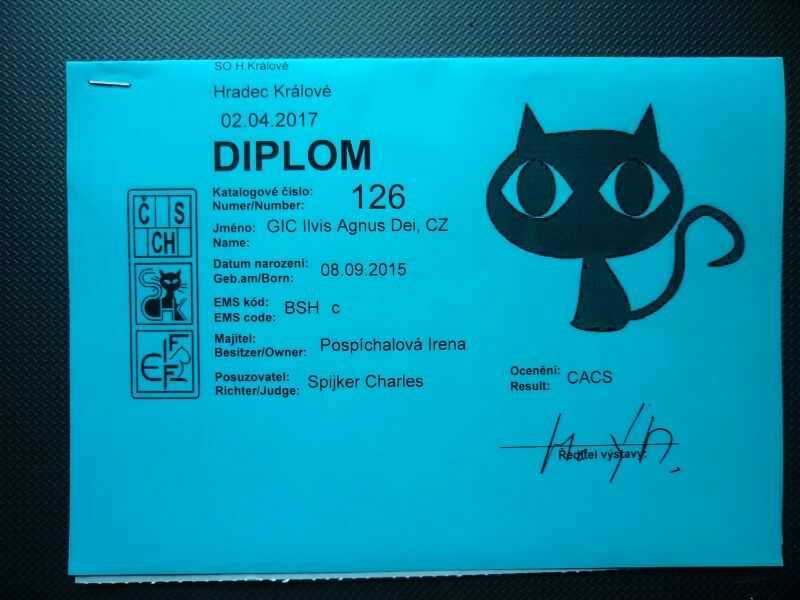 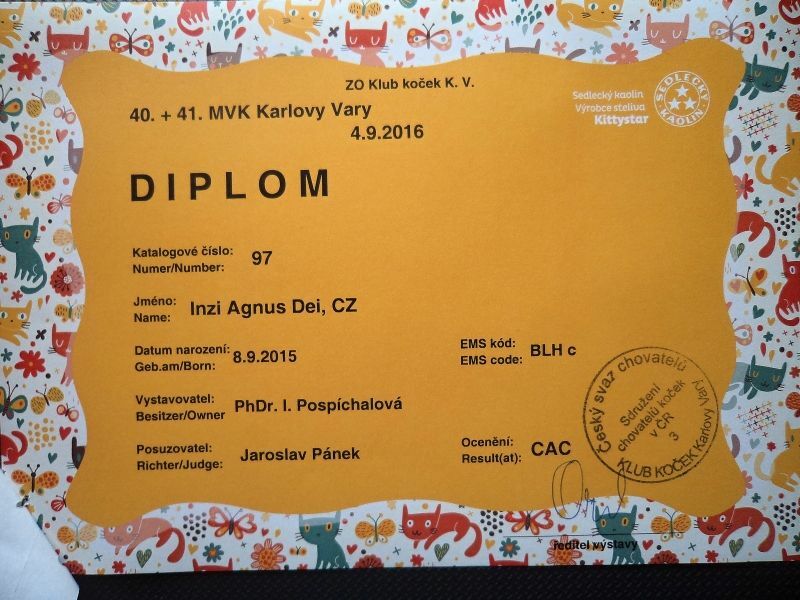 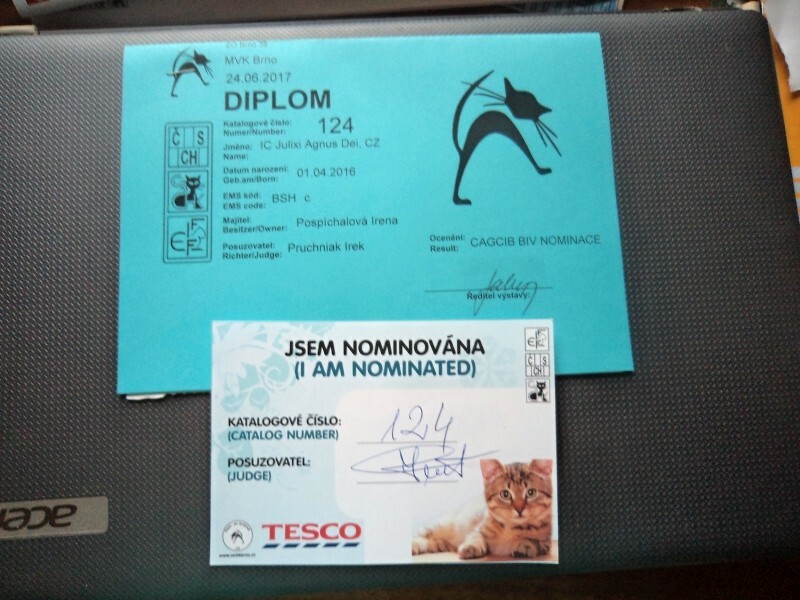 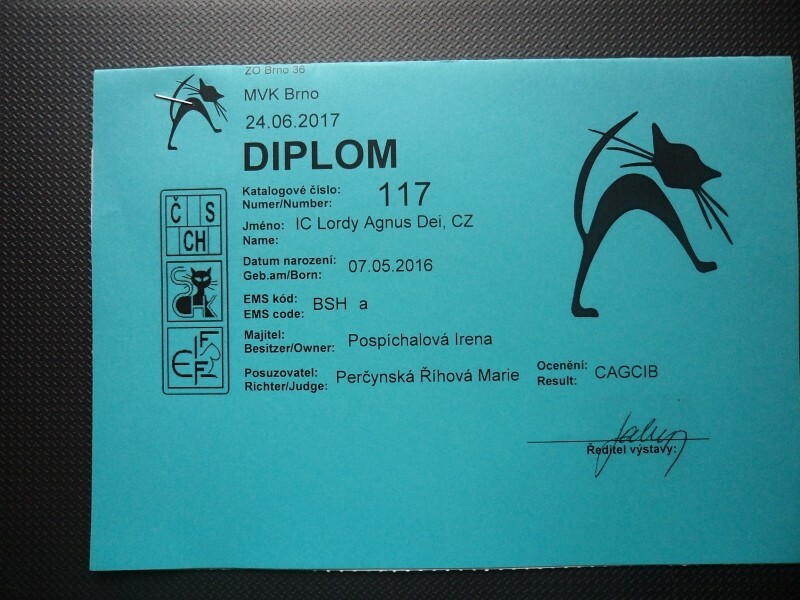 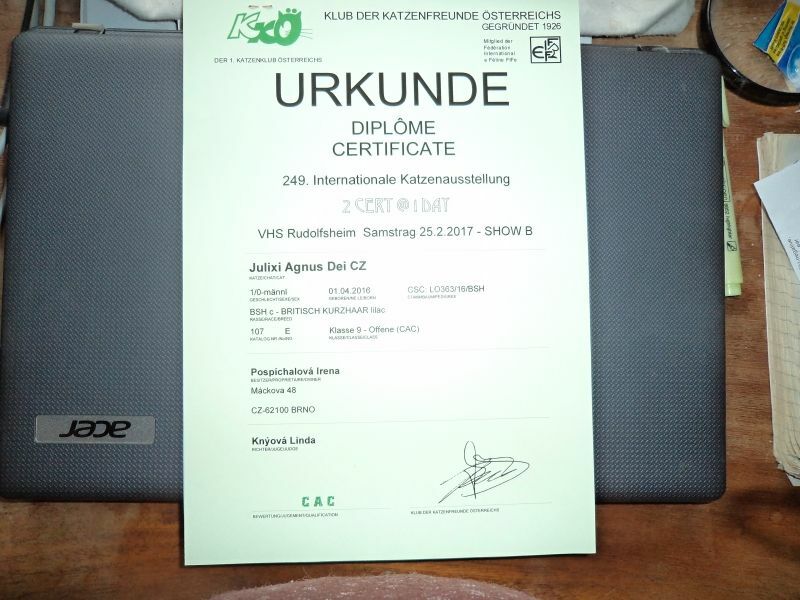 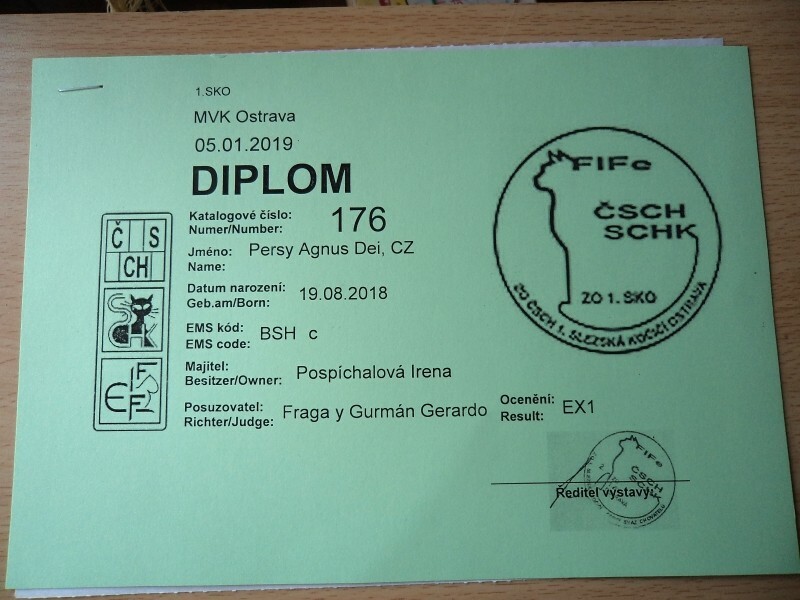 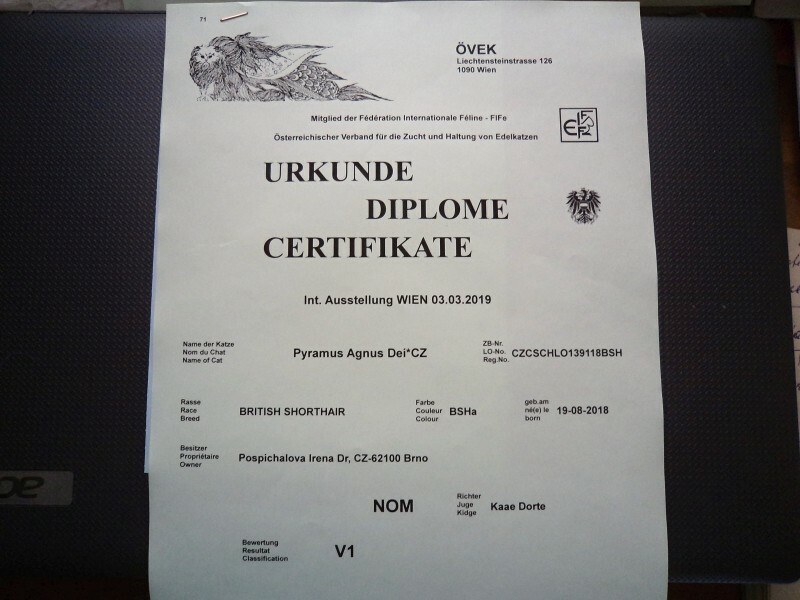 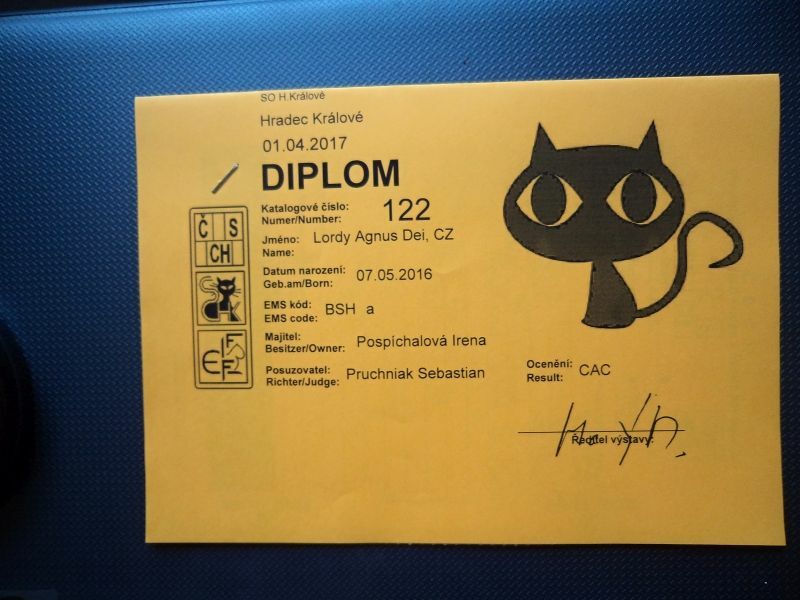 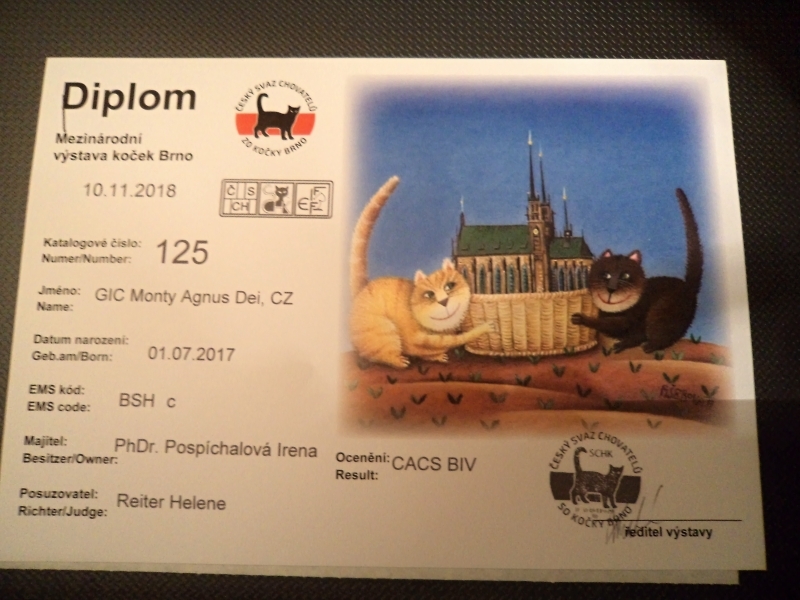 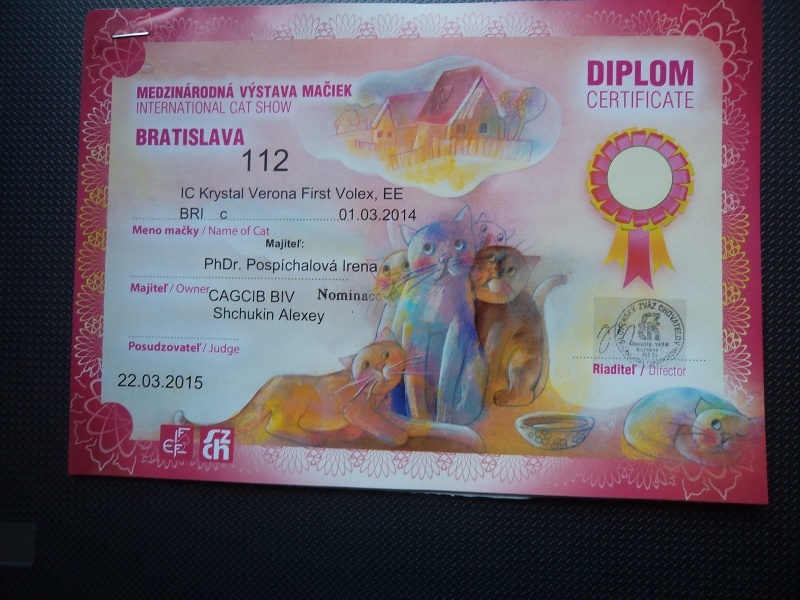 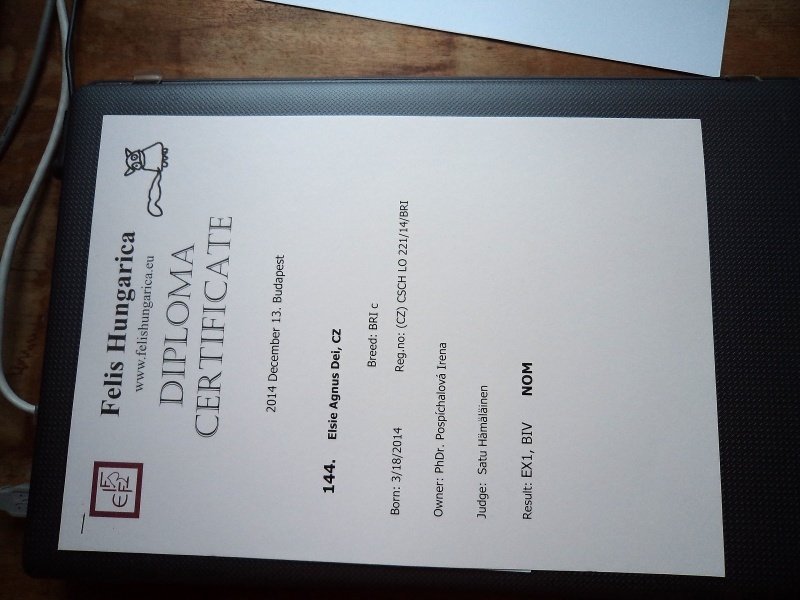 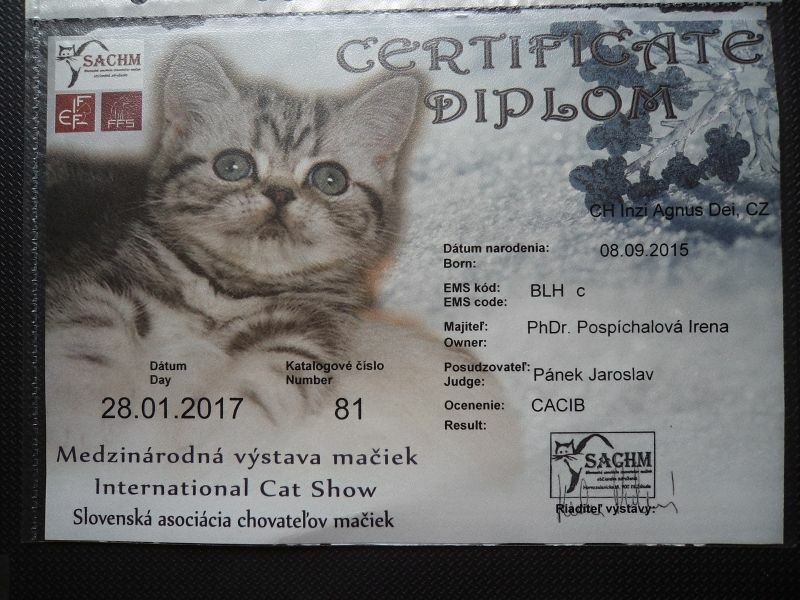 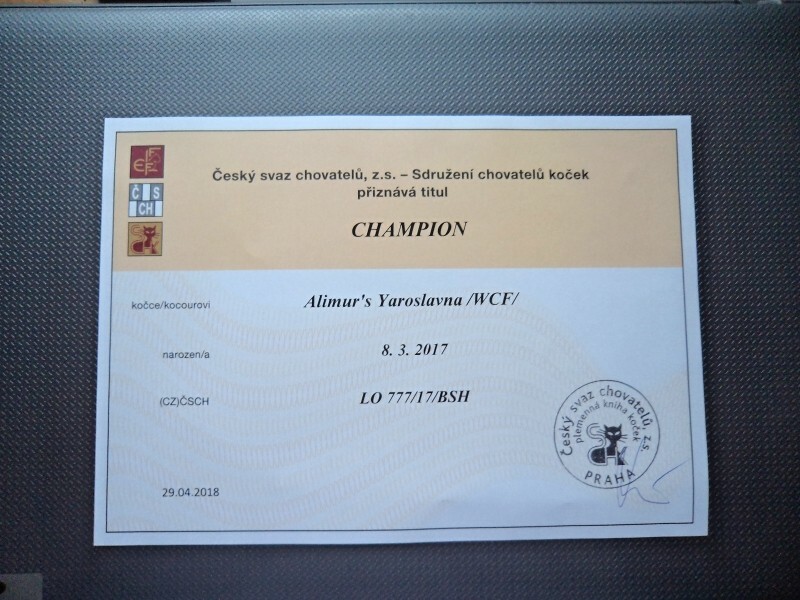 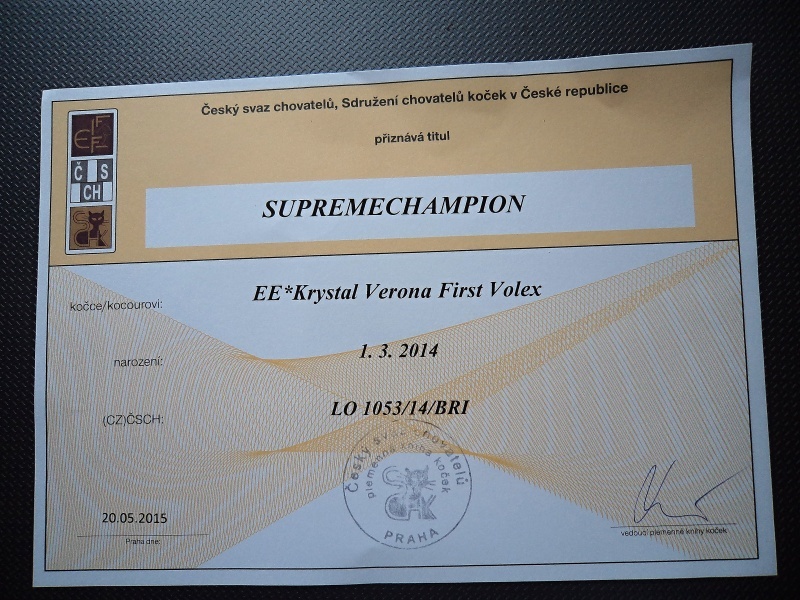 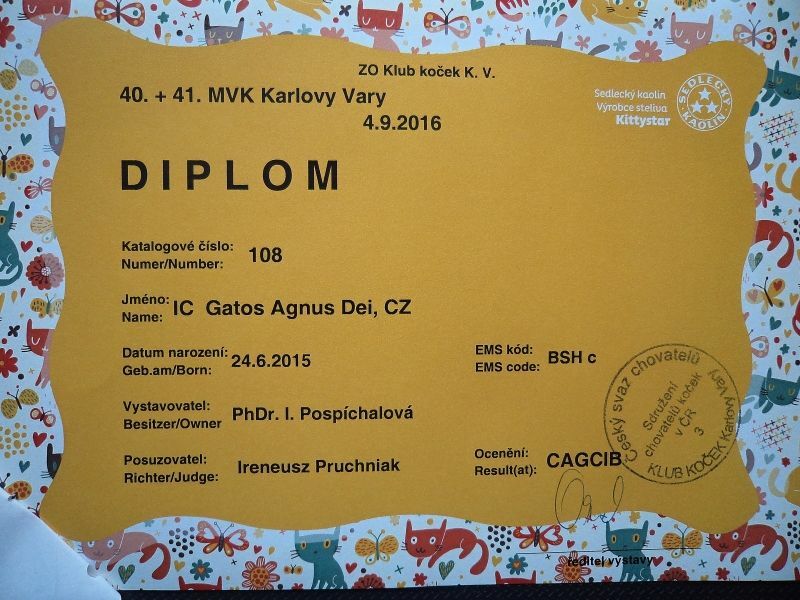 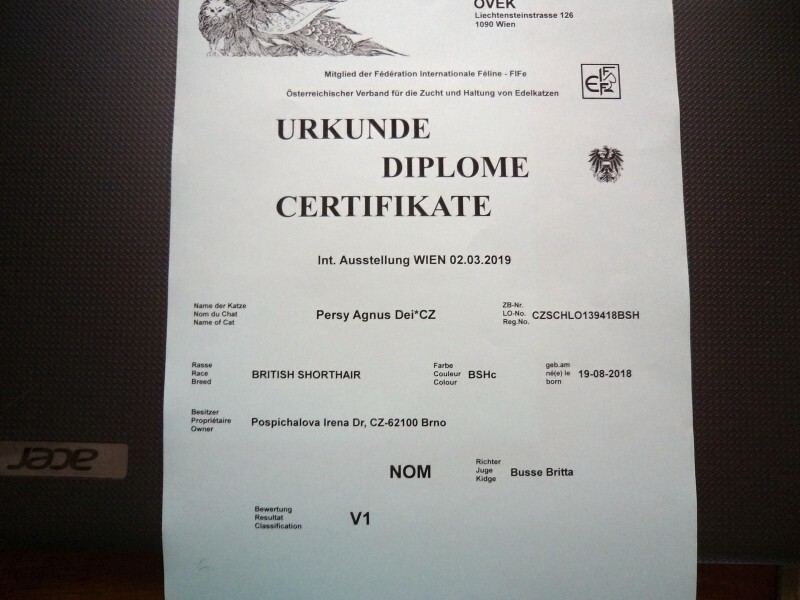 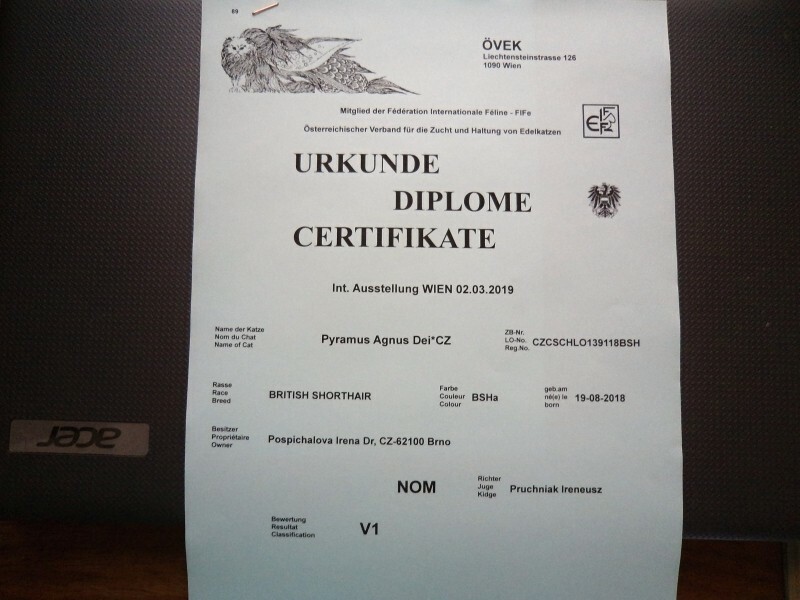 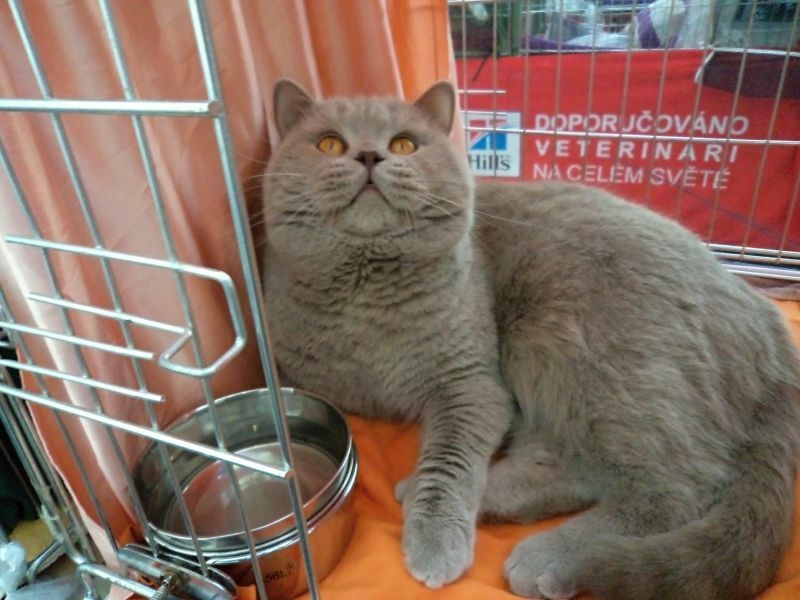 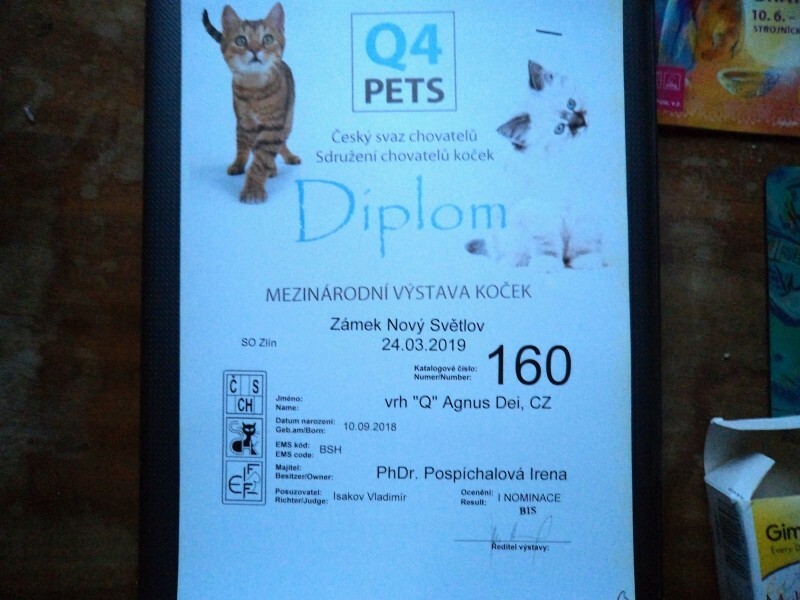 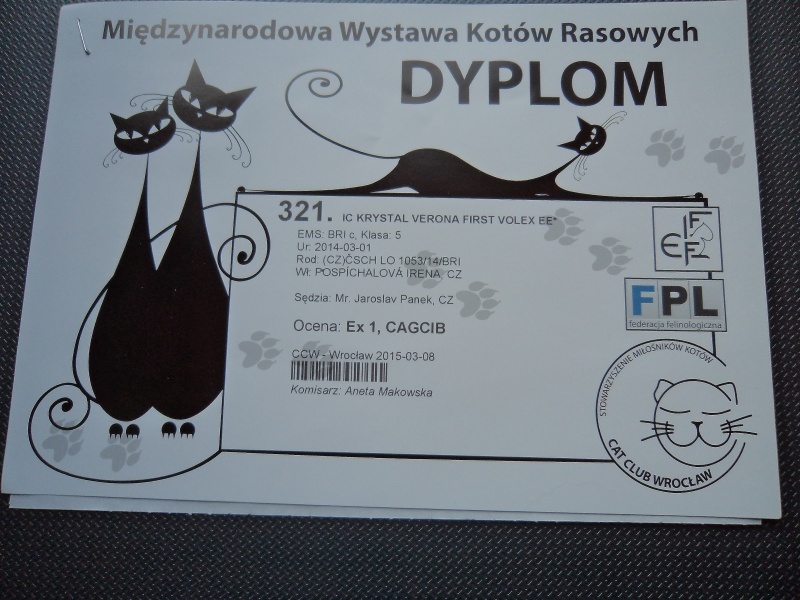 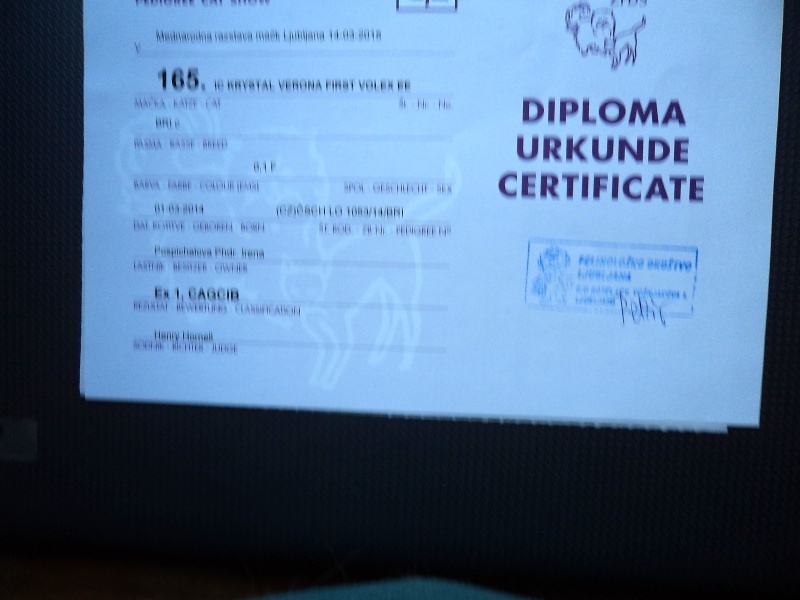 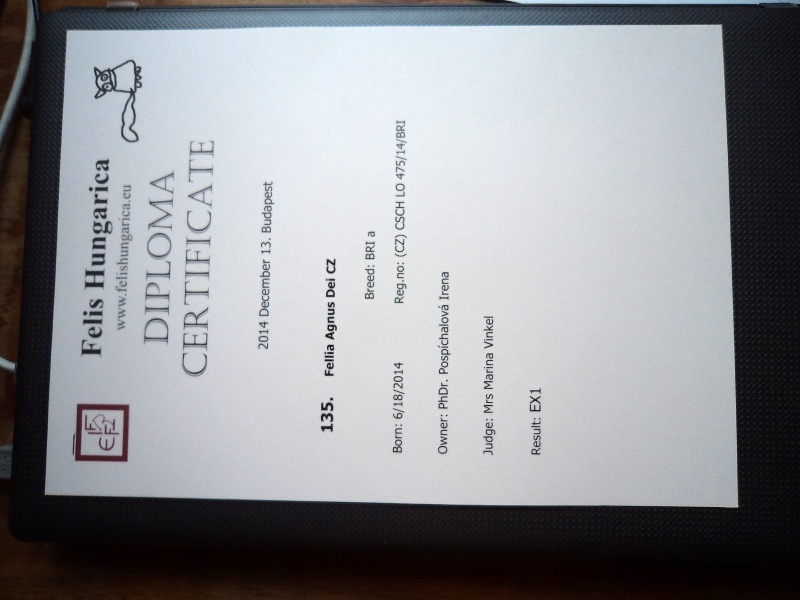 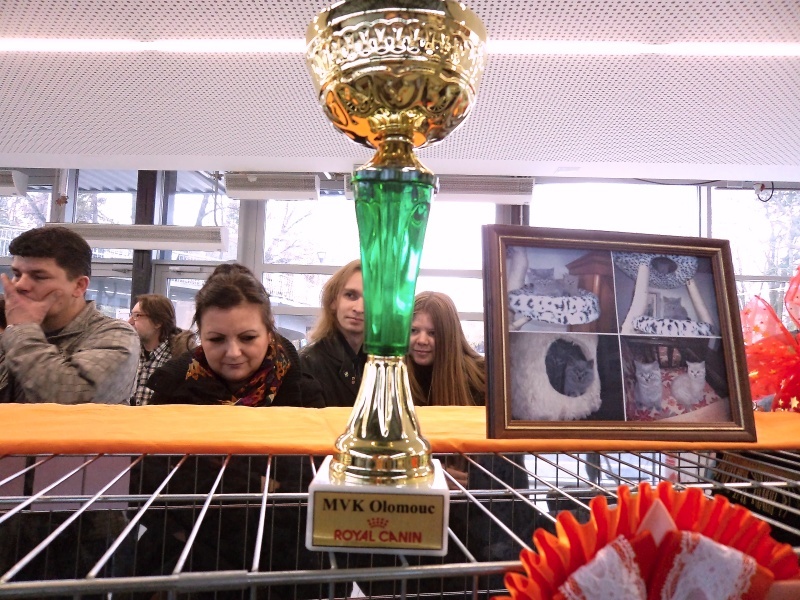 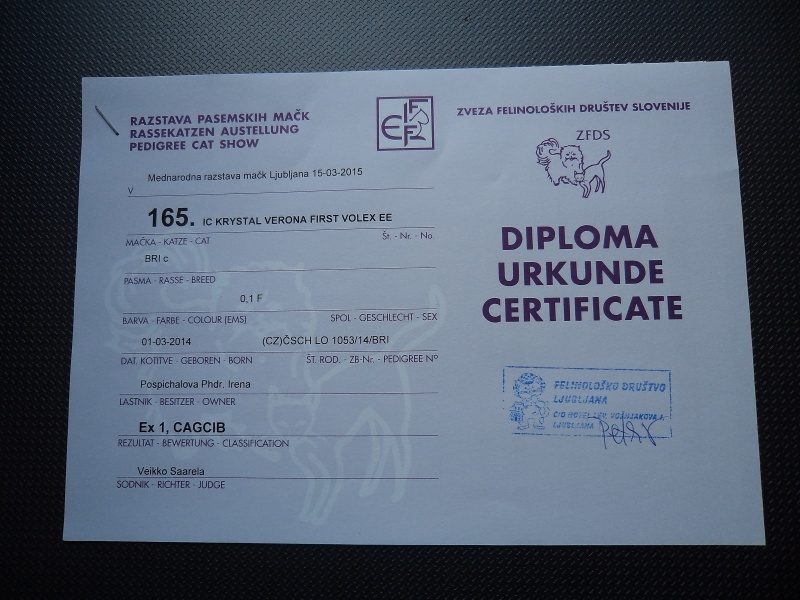 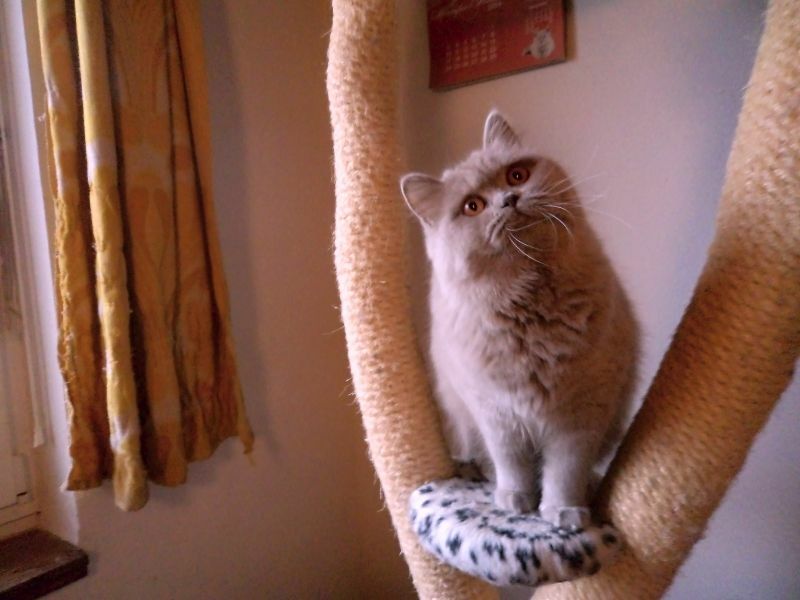 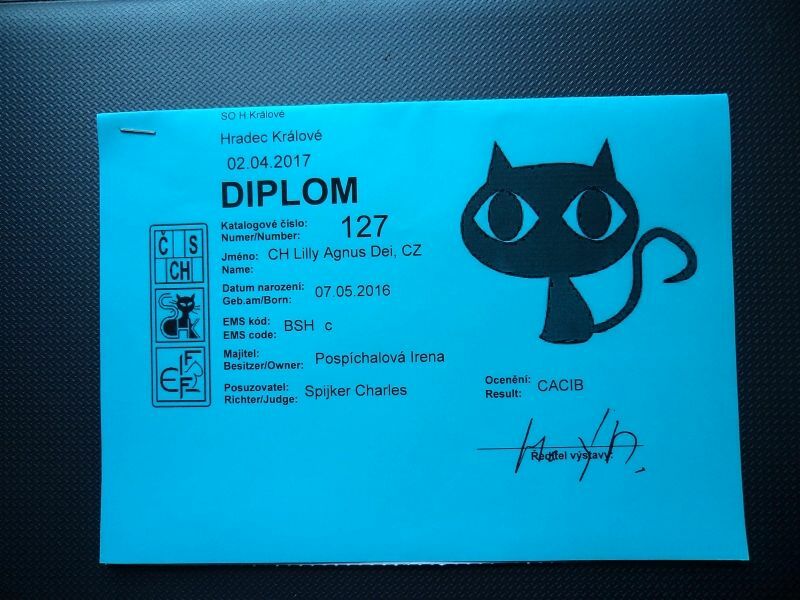 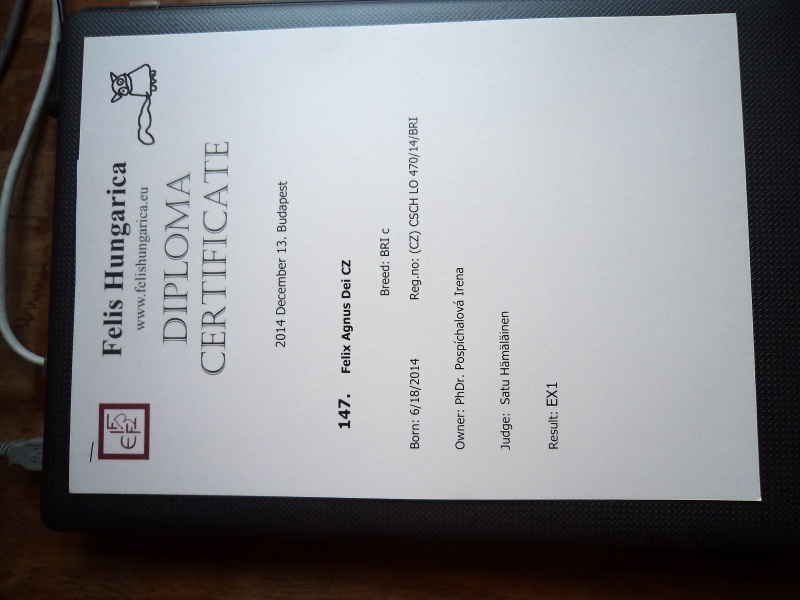 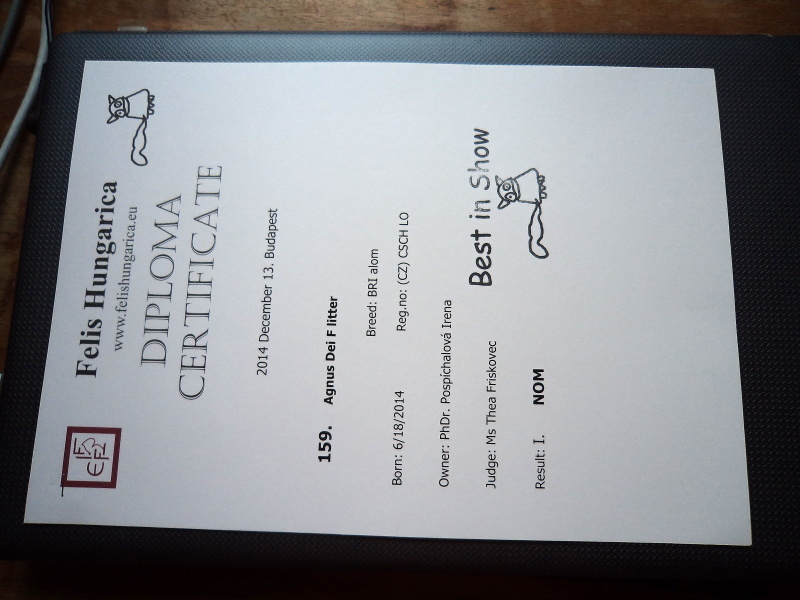 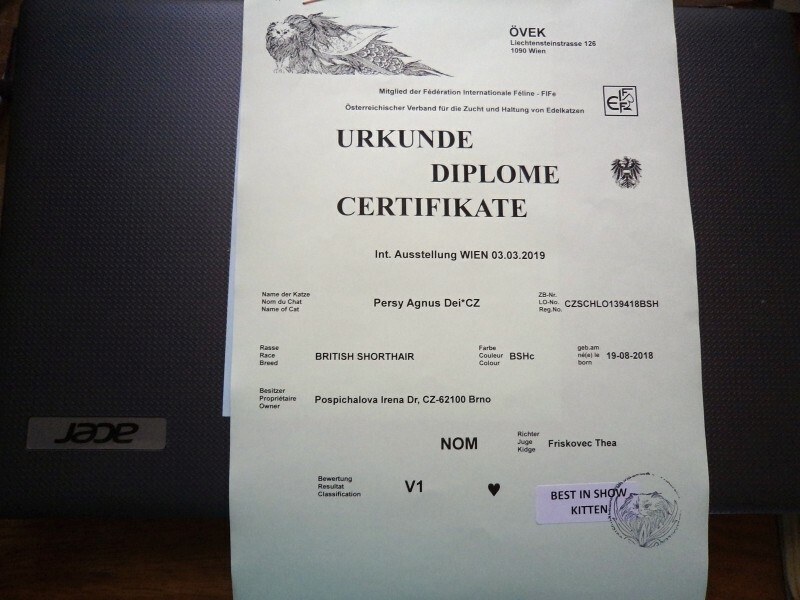 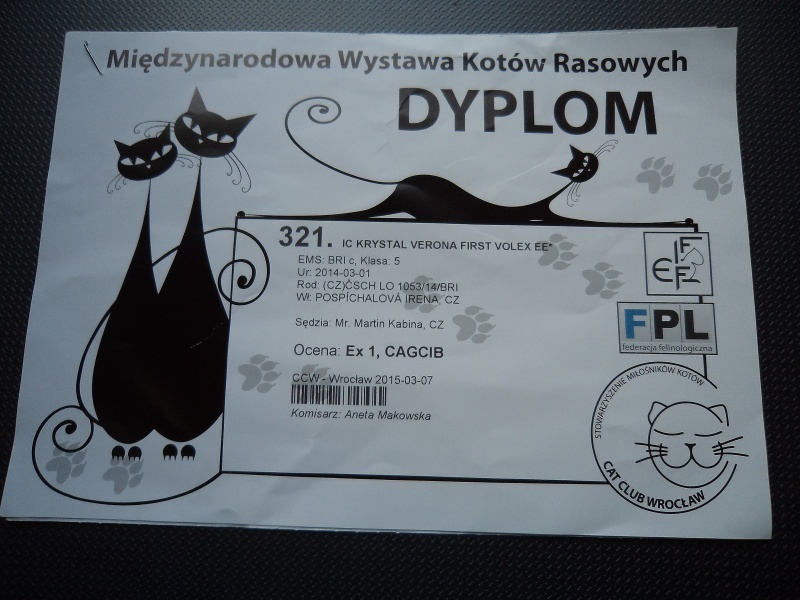 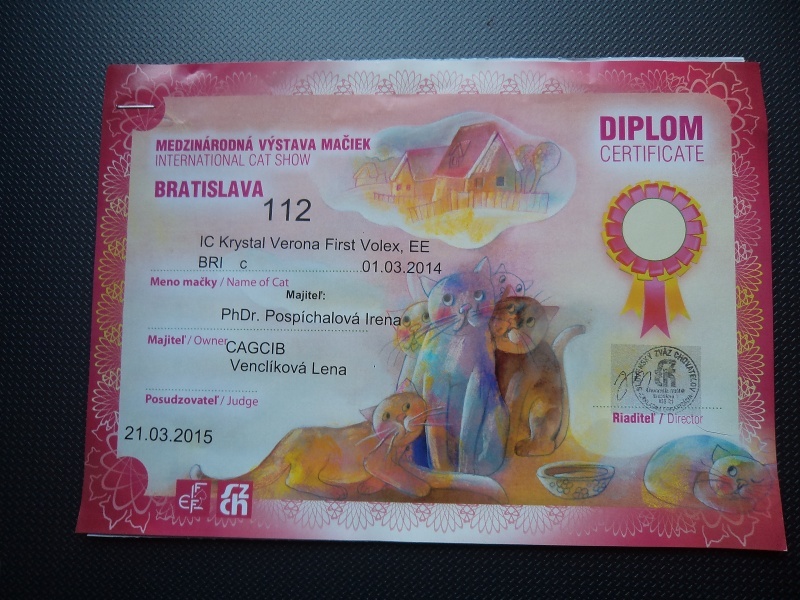 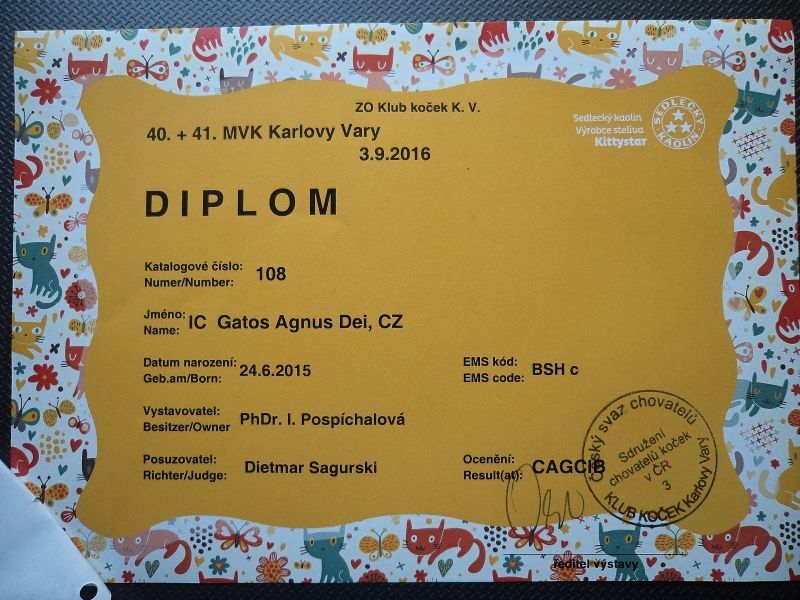 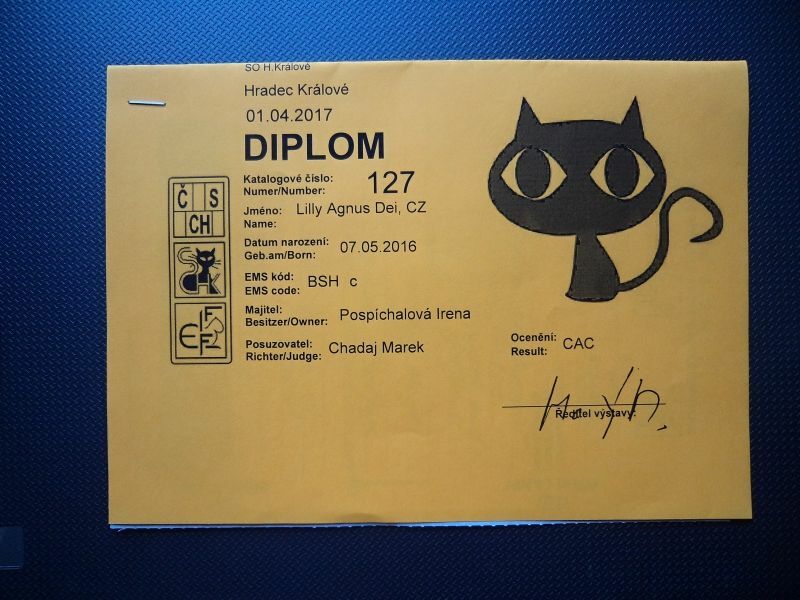 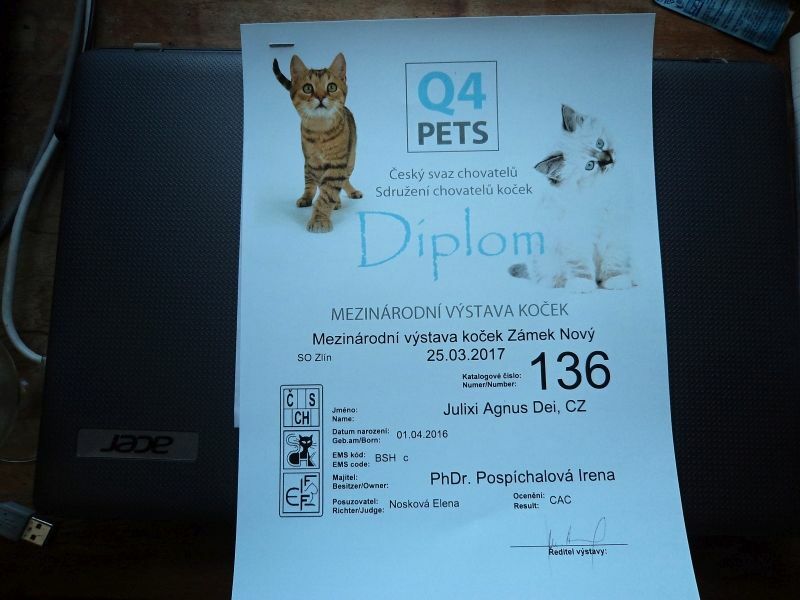 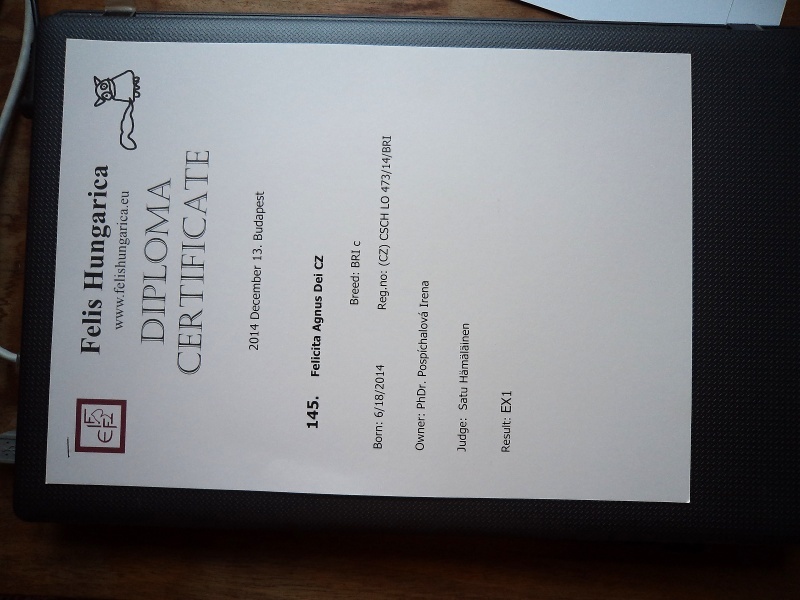 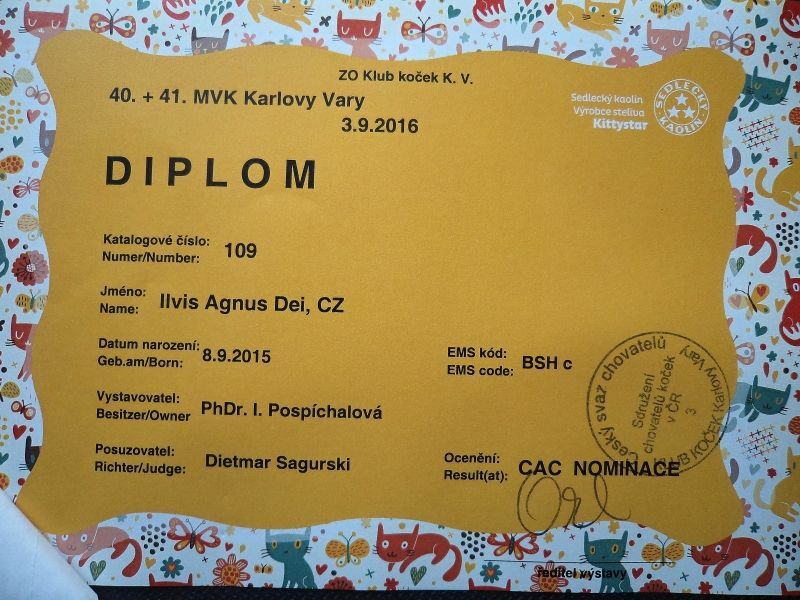 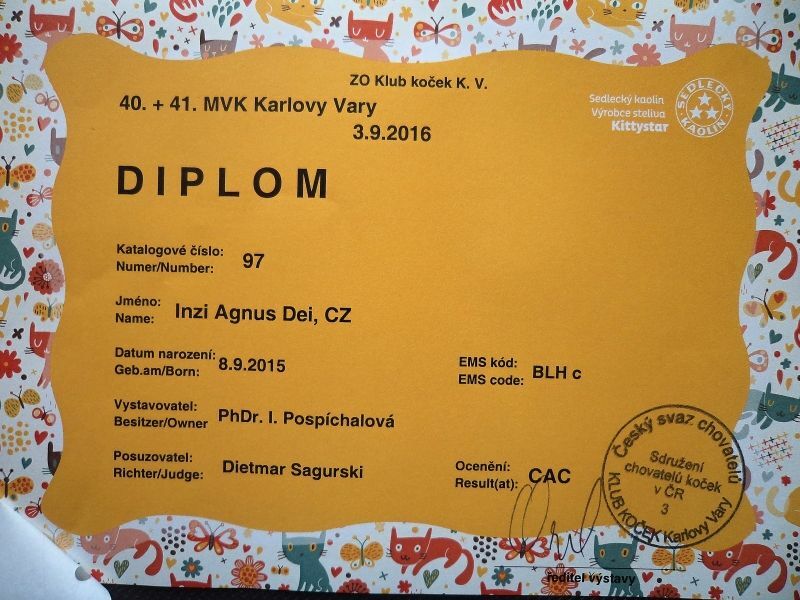 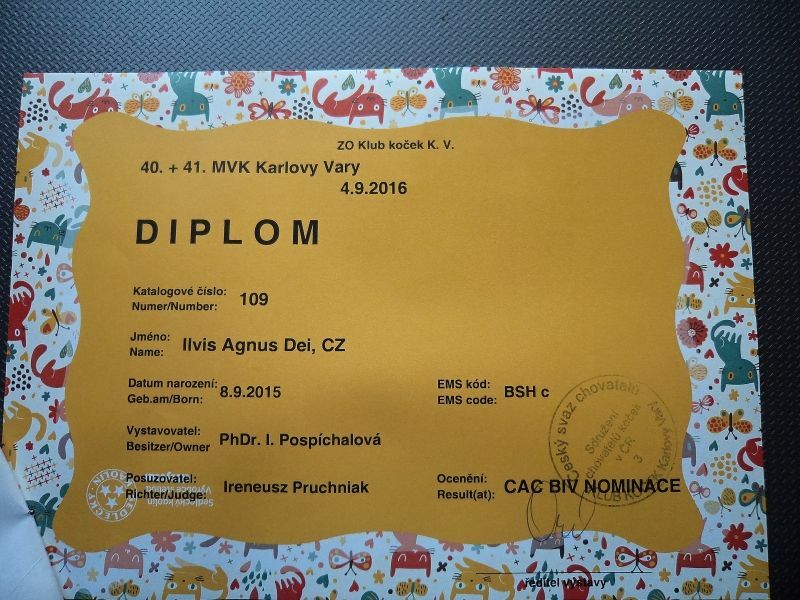 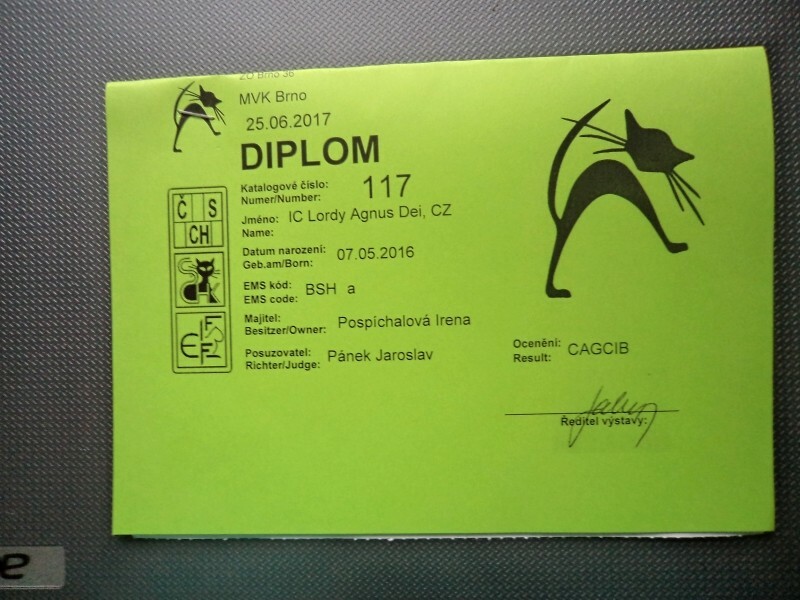 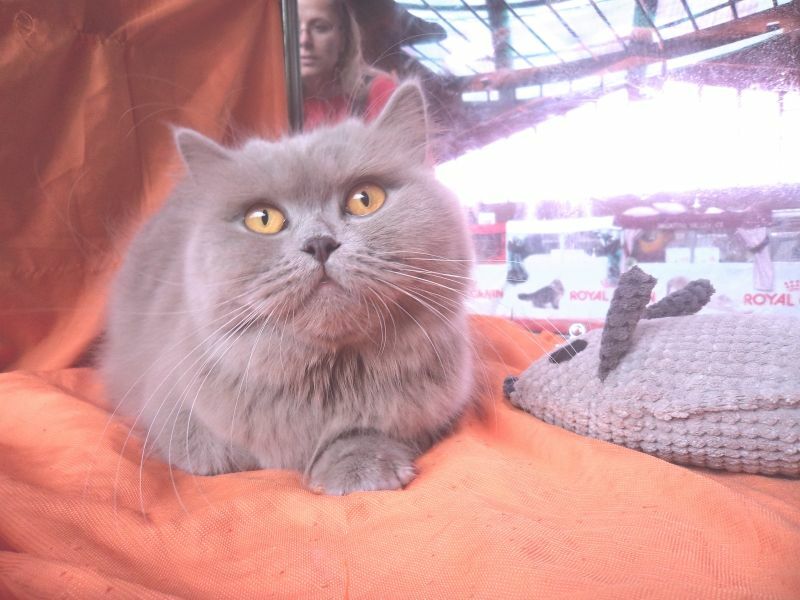 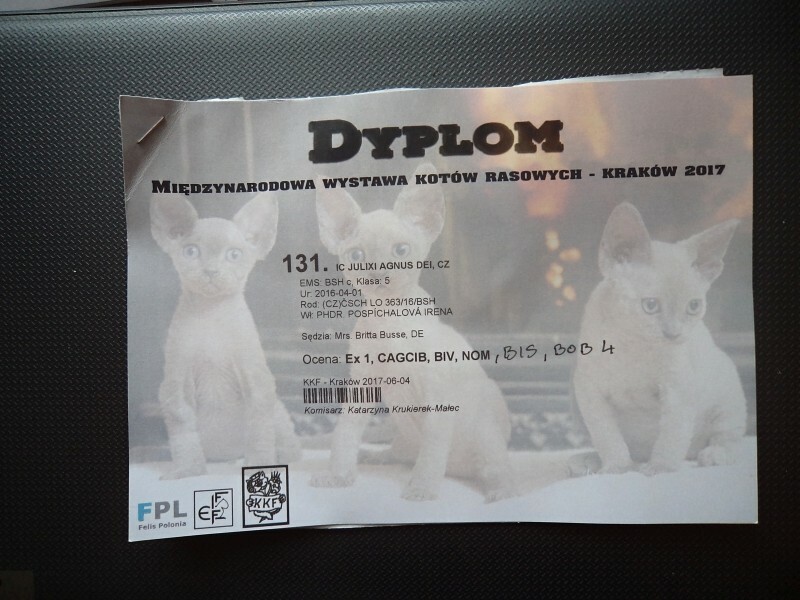 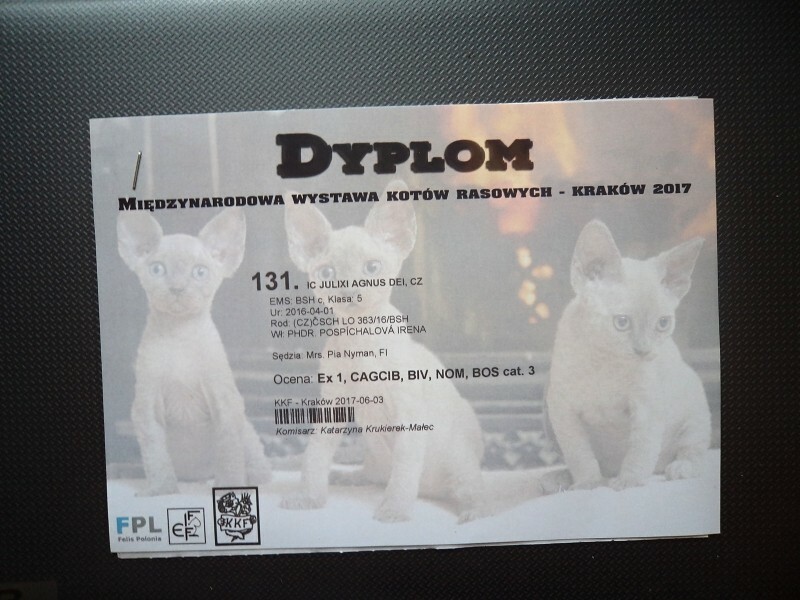 Our British shorthair blue kitten Pyramus Agnus Dei, CZ (BSH a) has got two diplomas Ex.1 + NOM on both days. 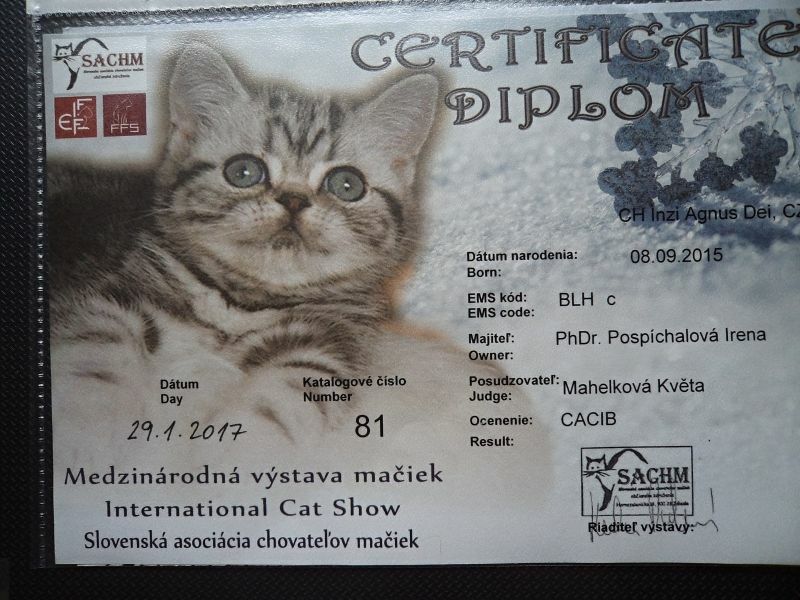 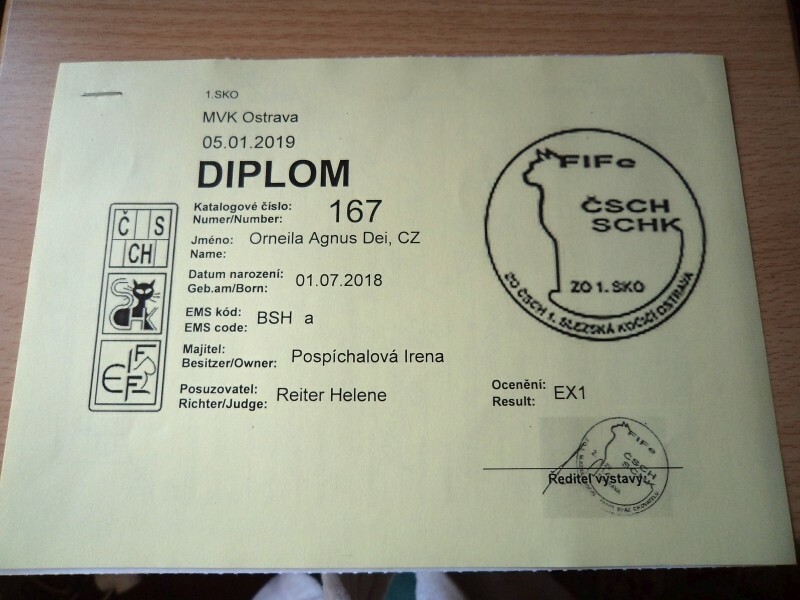 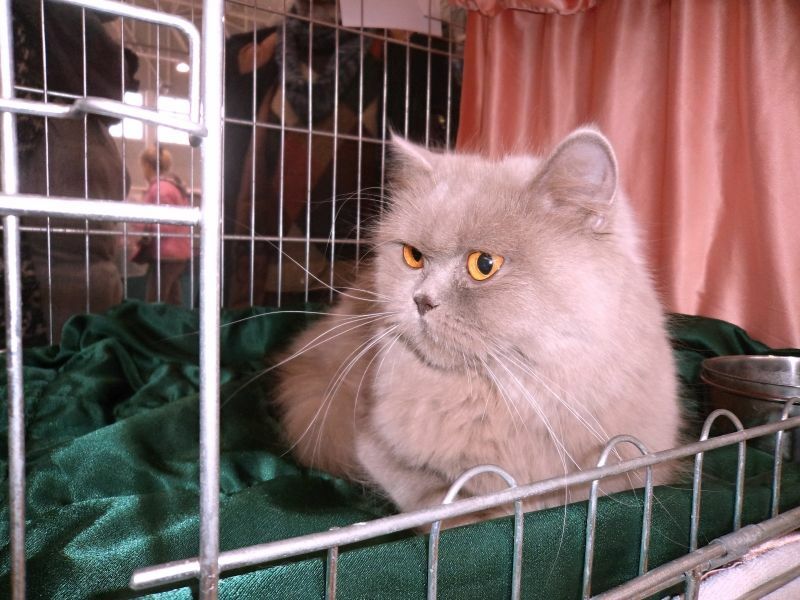 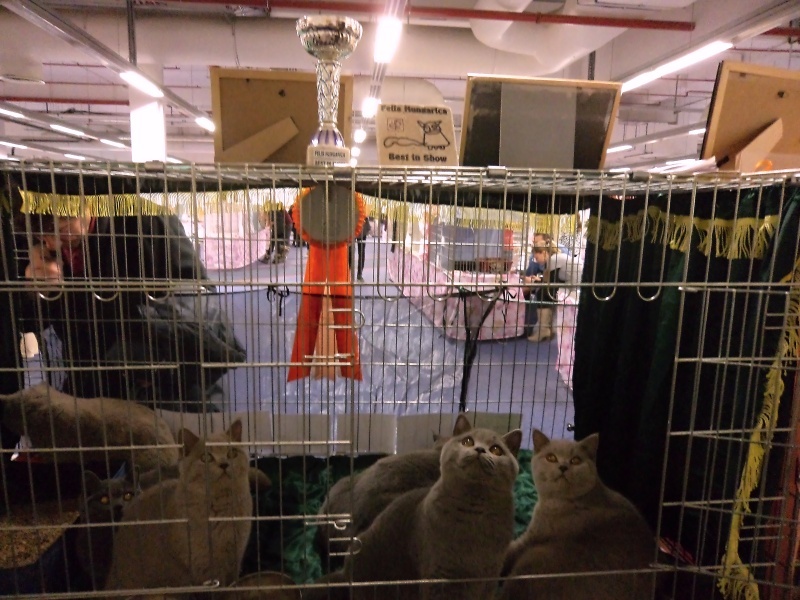 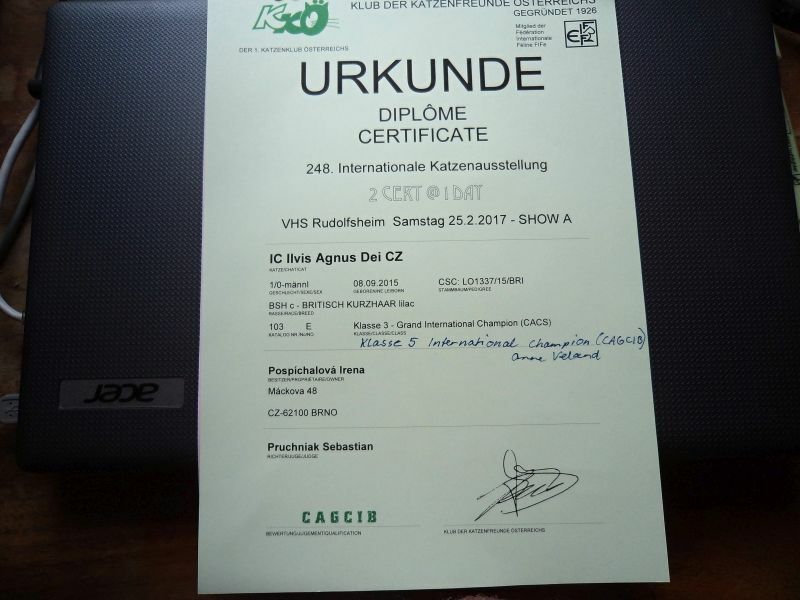 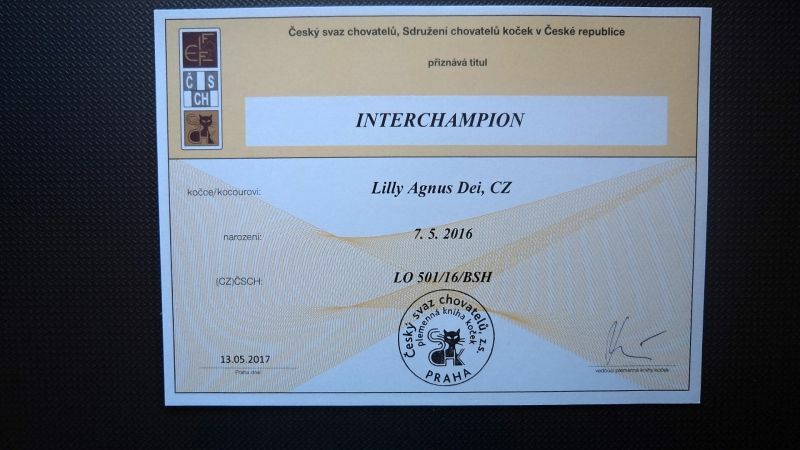 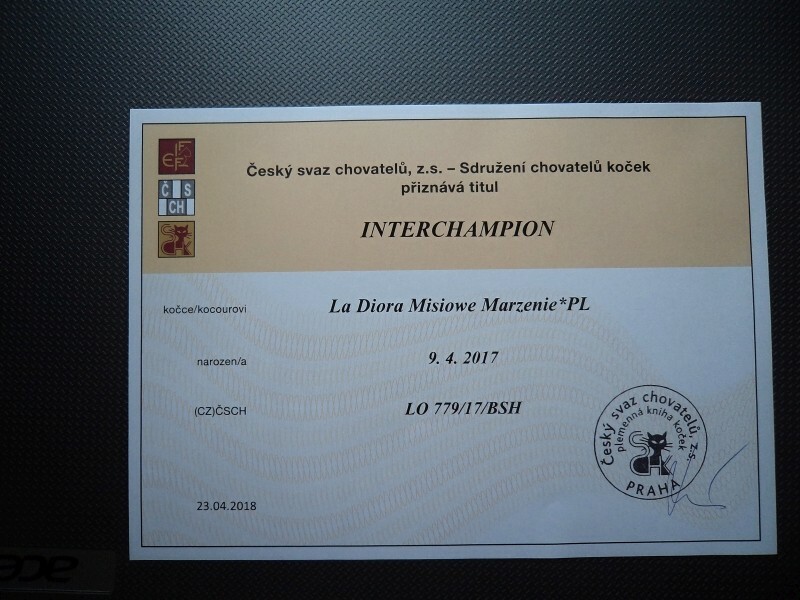 Our British shorthair lilac kitten Persy Agnus Dei, CZ (BSH c) has got the diploma Ex.1 + NOM on Saturday and Ex.1 + BIS on Sunday. 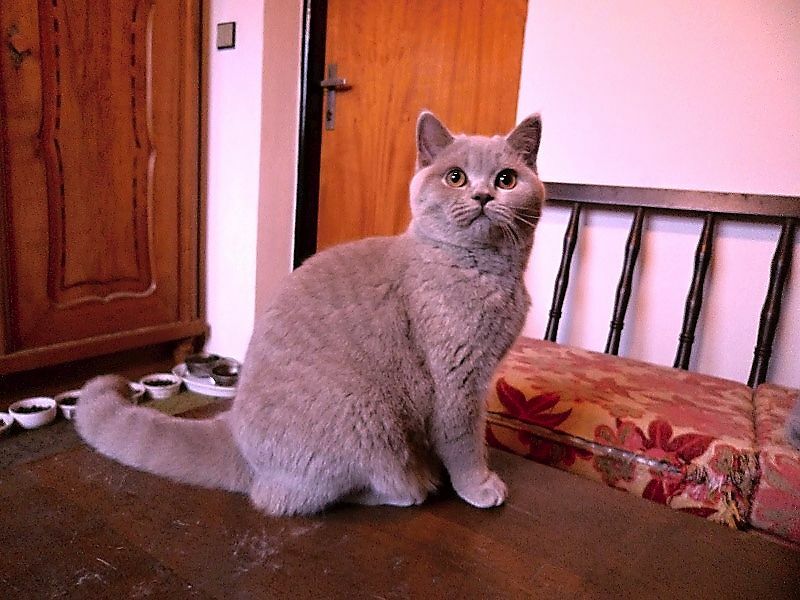 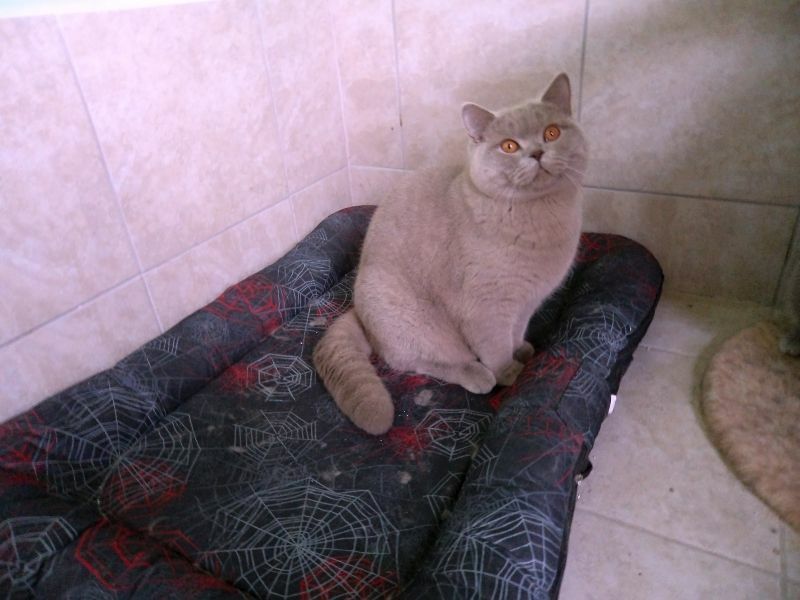 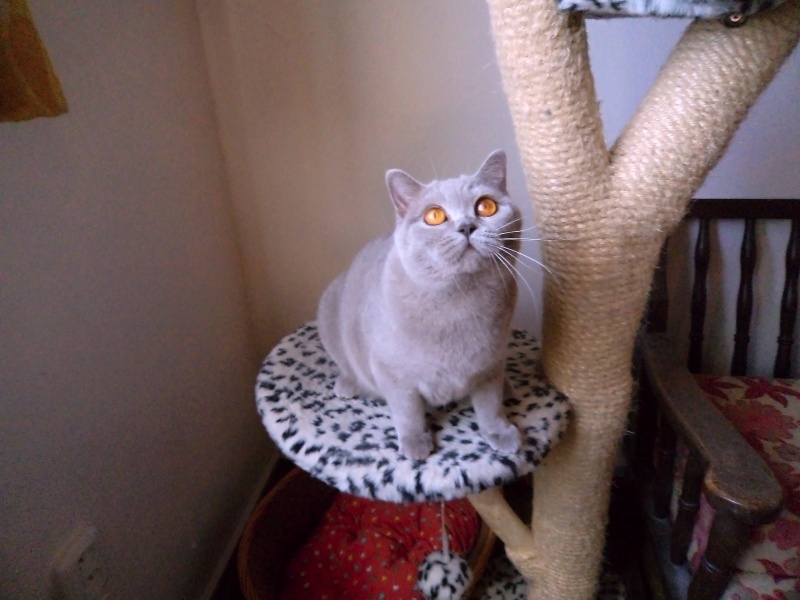 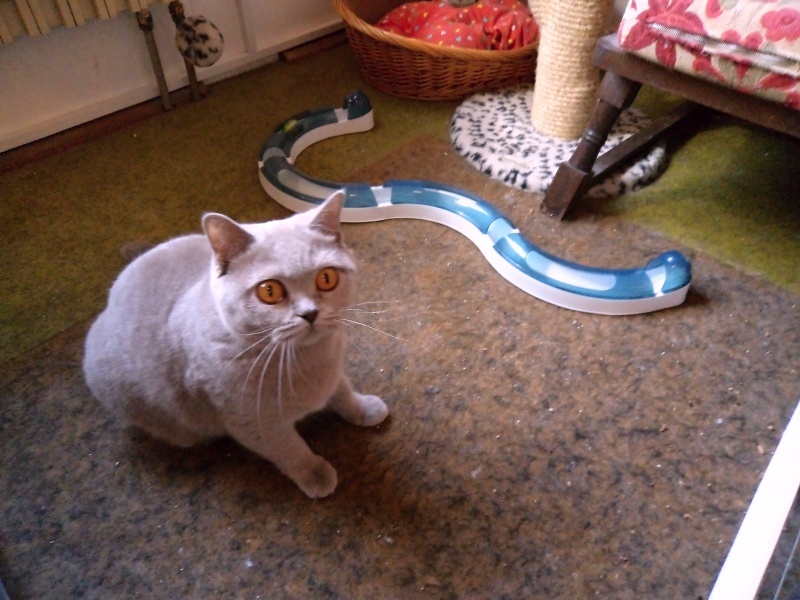 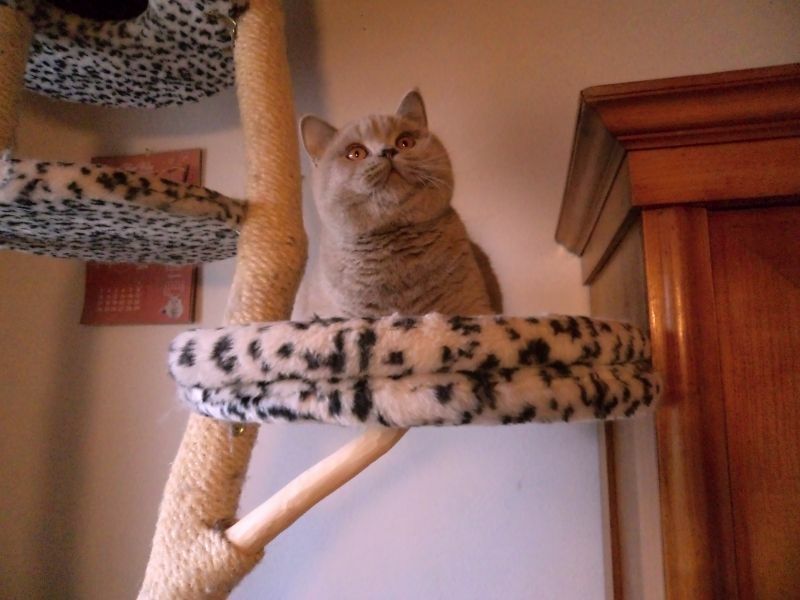 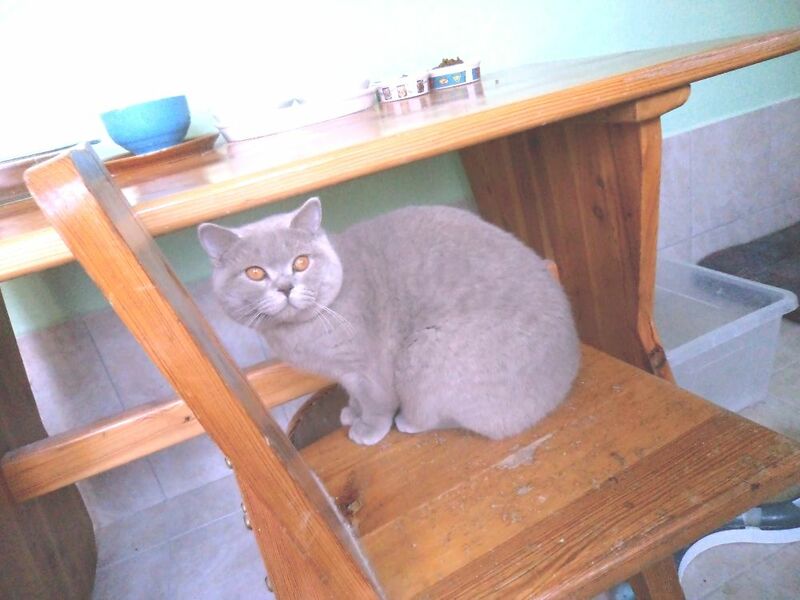 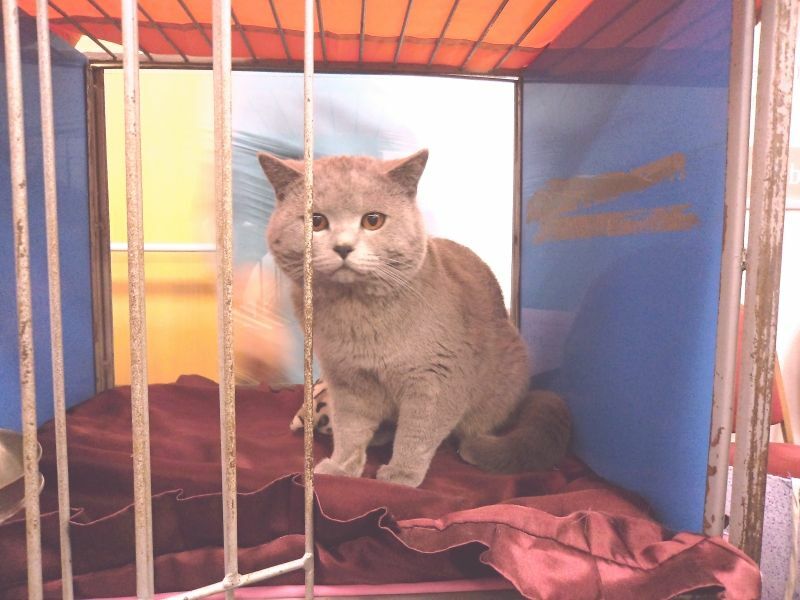 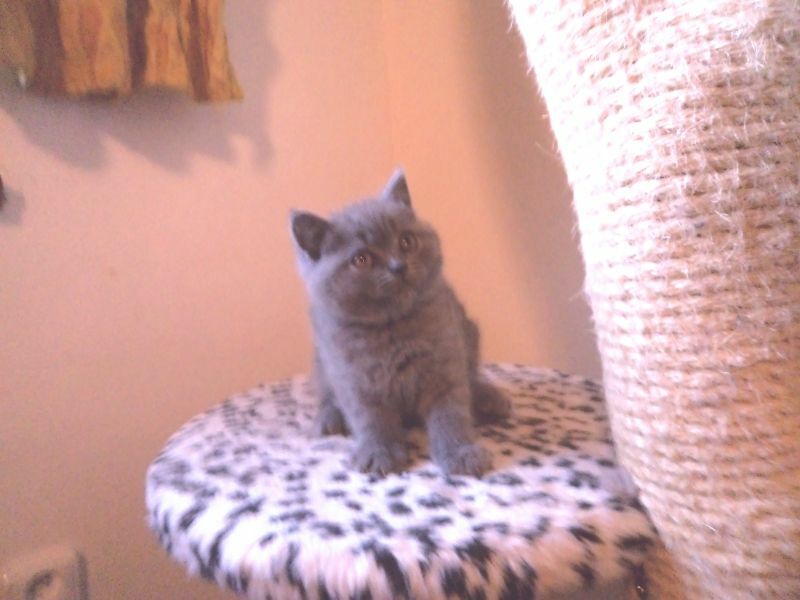 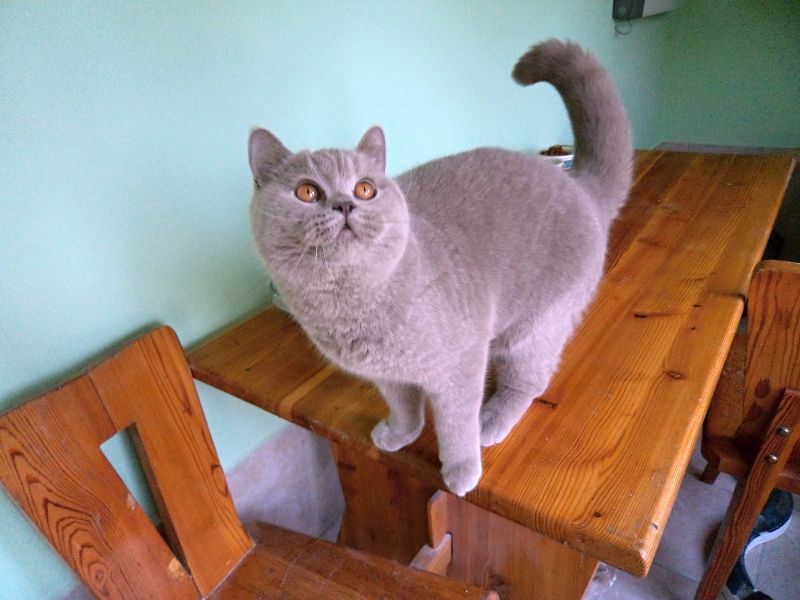 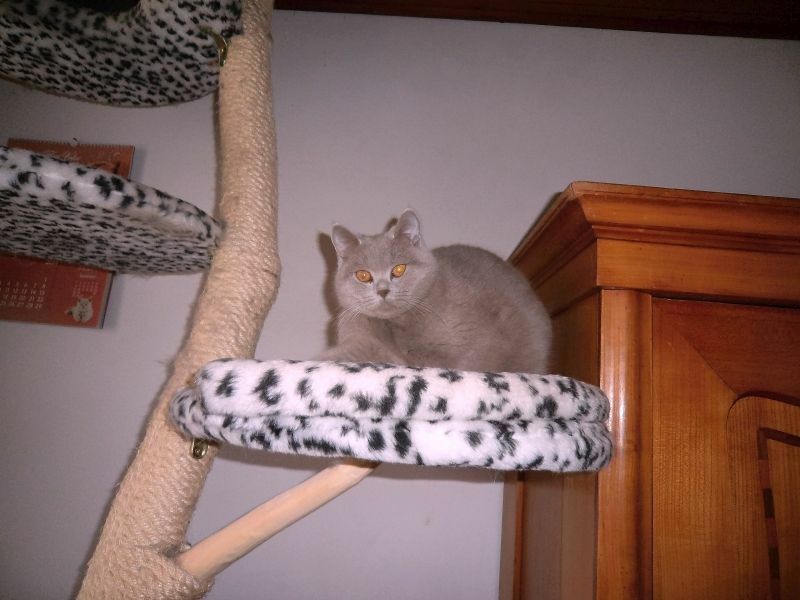 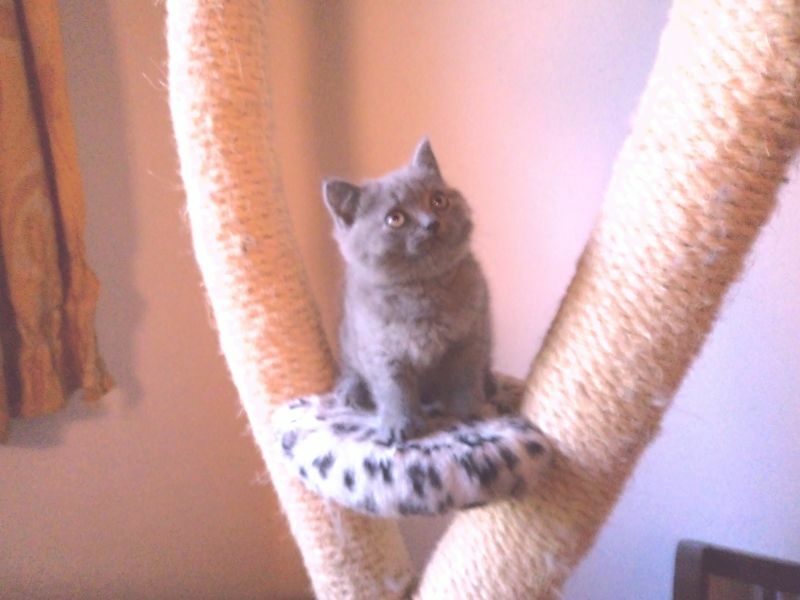 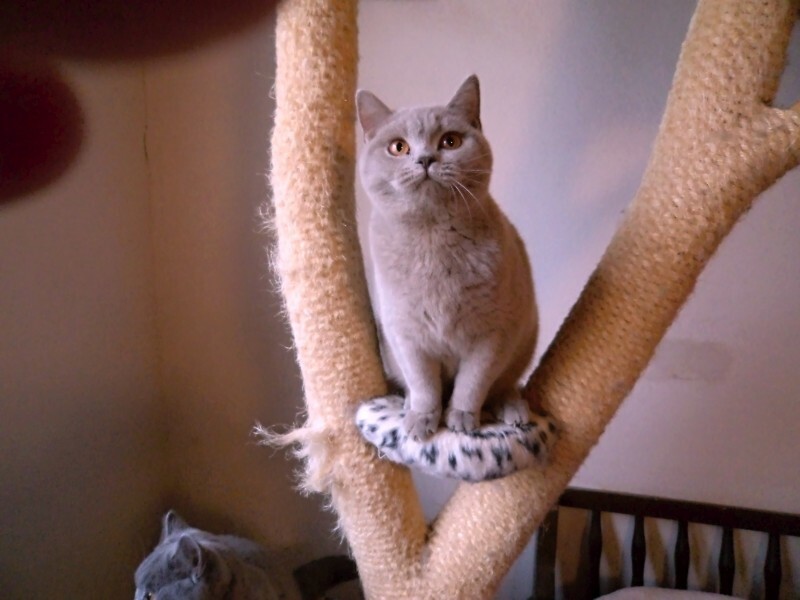 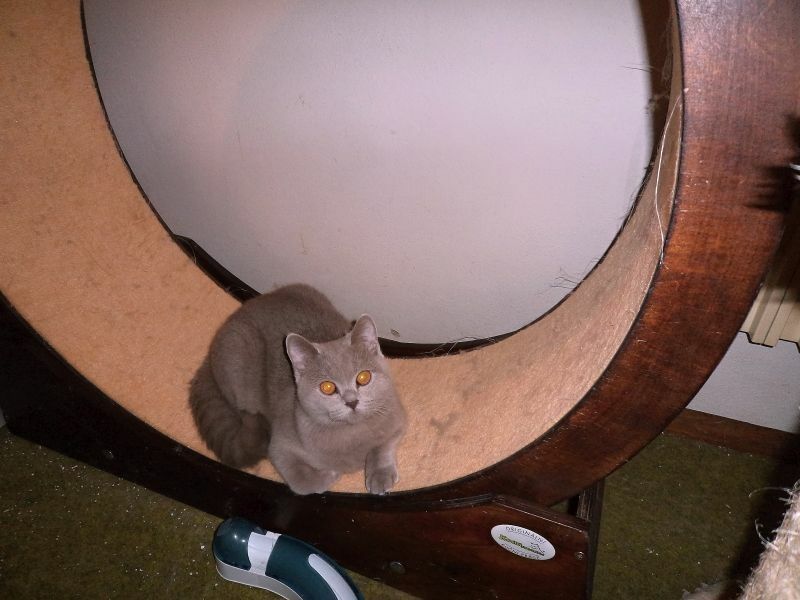 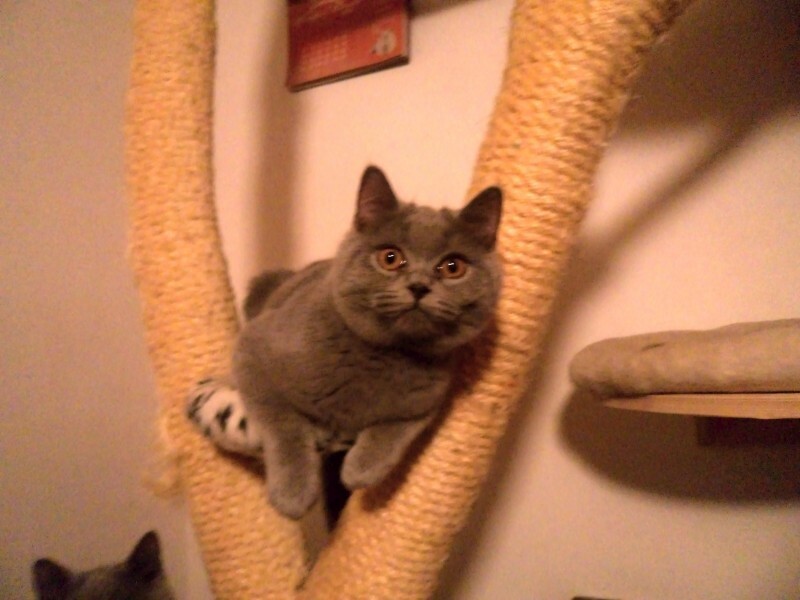 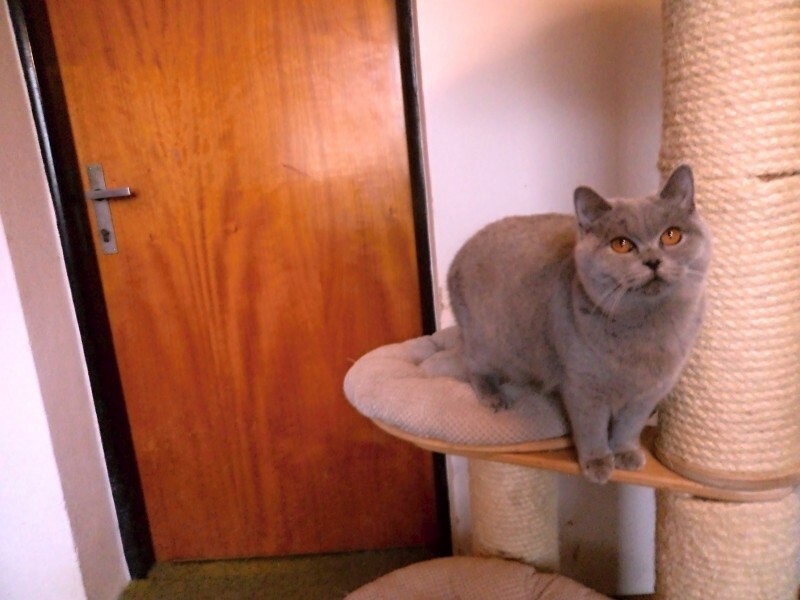 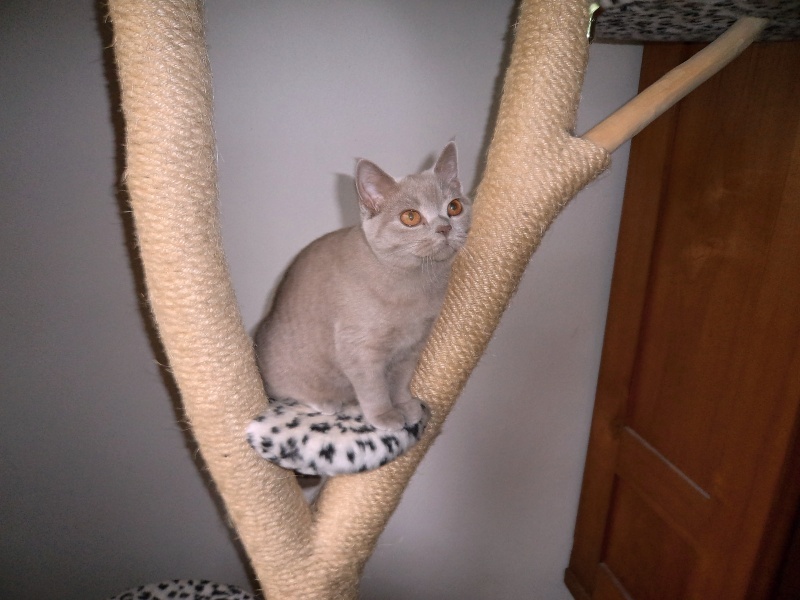 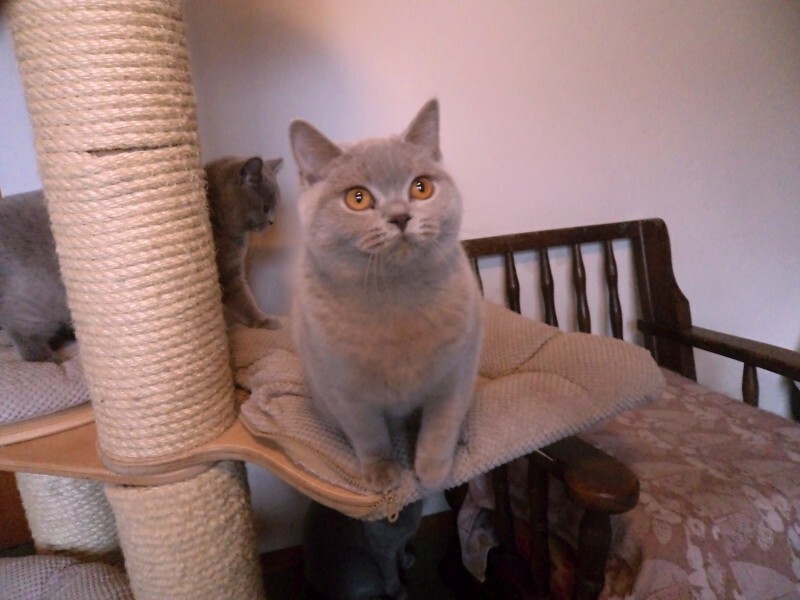 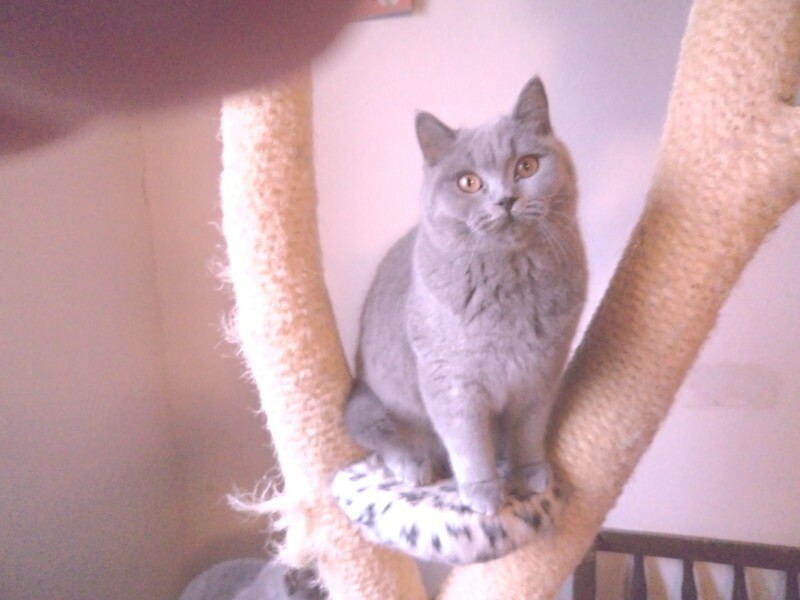 Our British shorthair blue kitten Orneila Agnus Dei, CZ (BSH a) has got Ex.1. 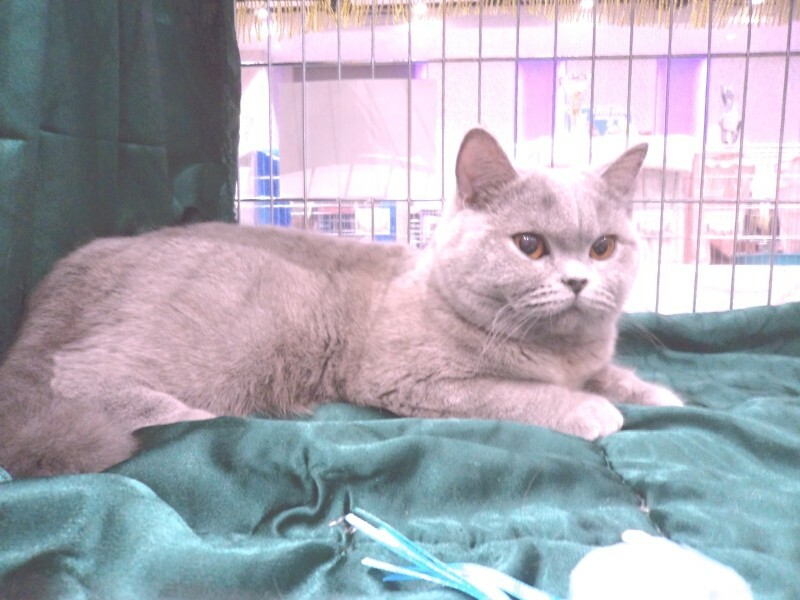 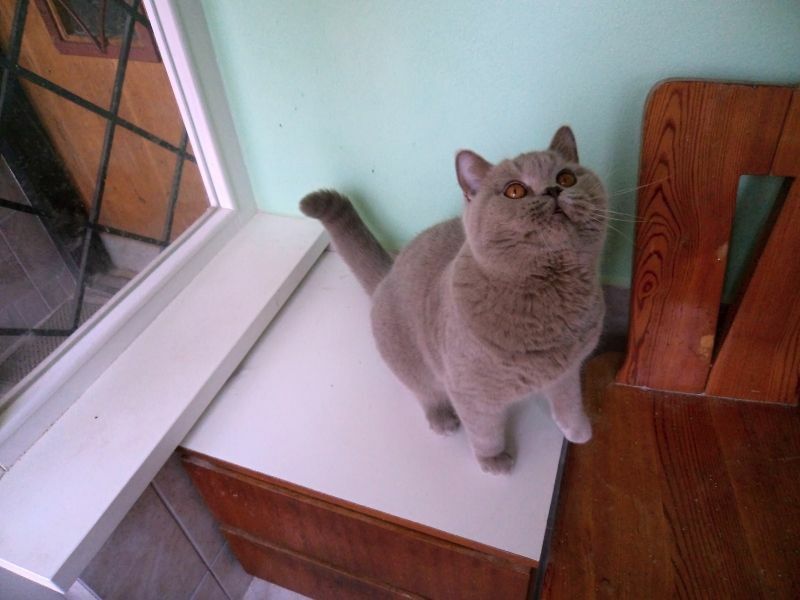 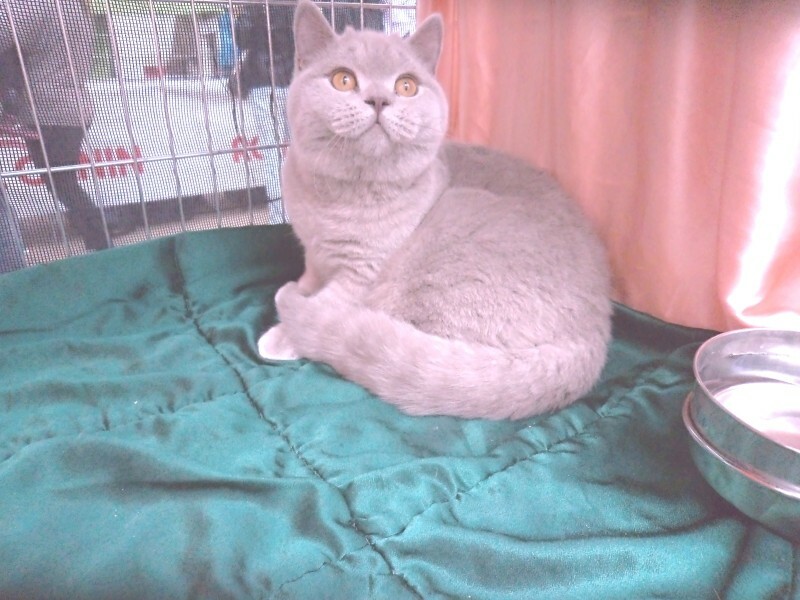 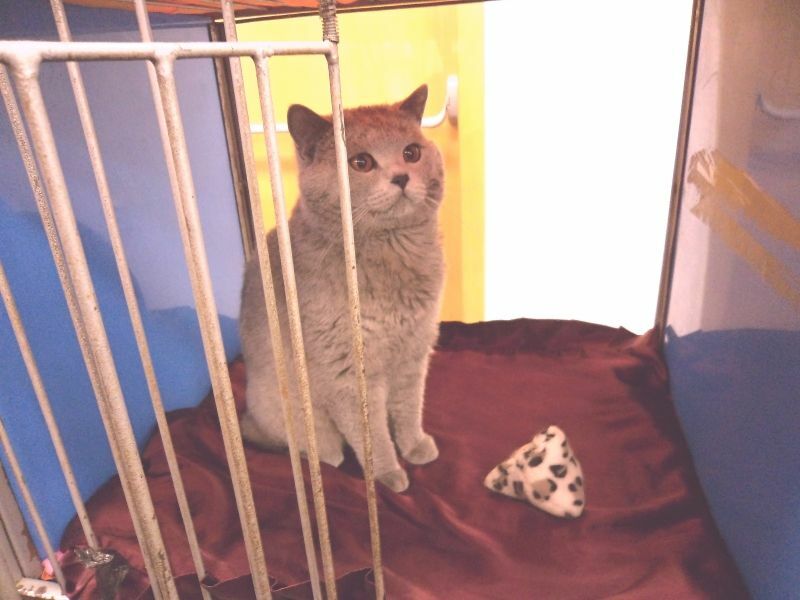 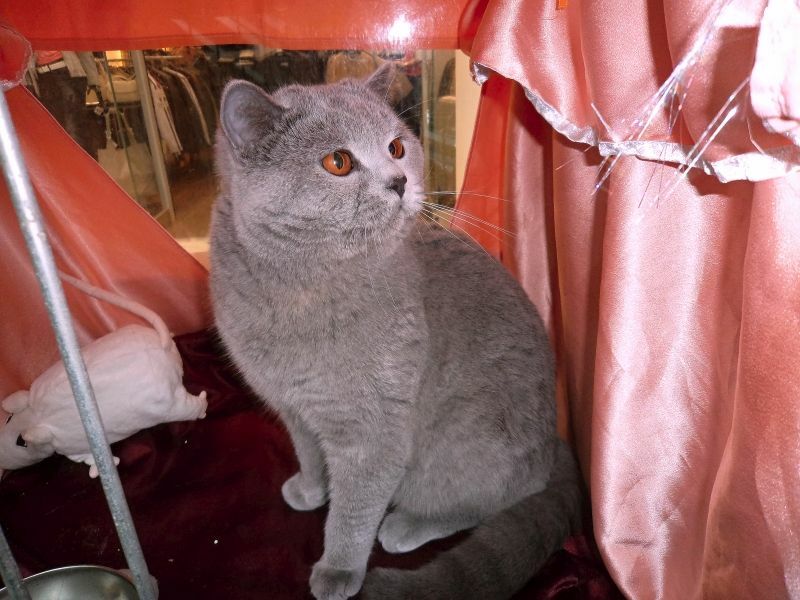 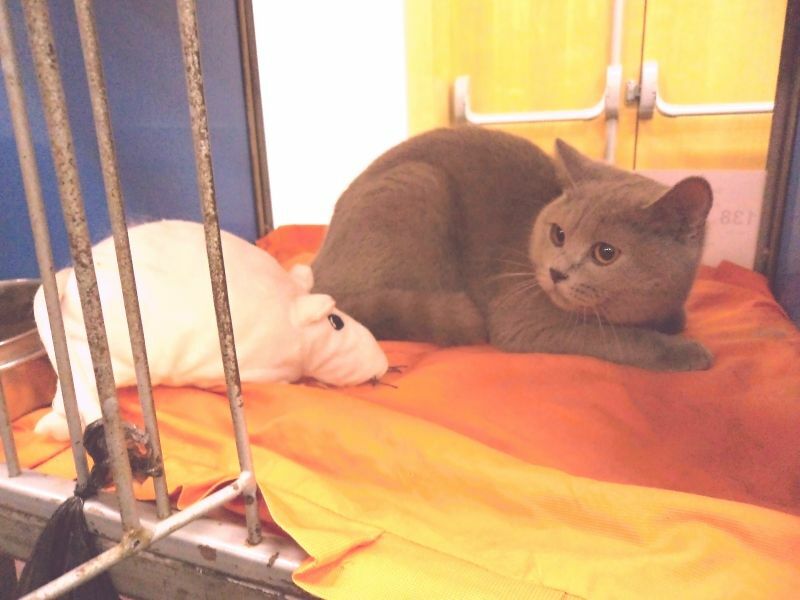 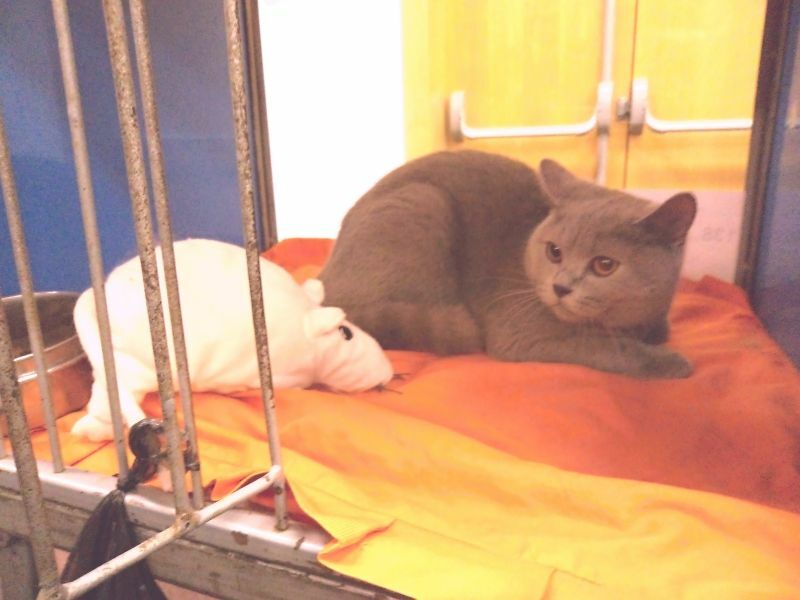 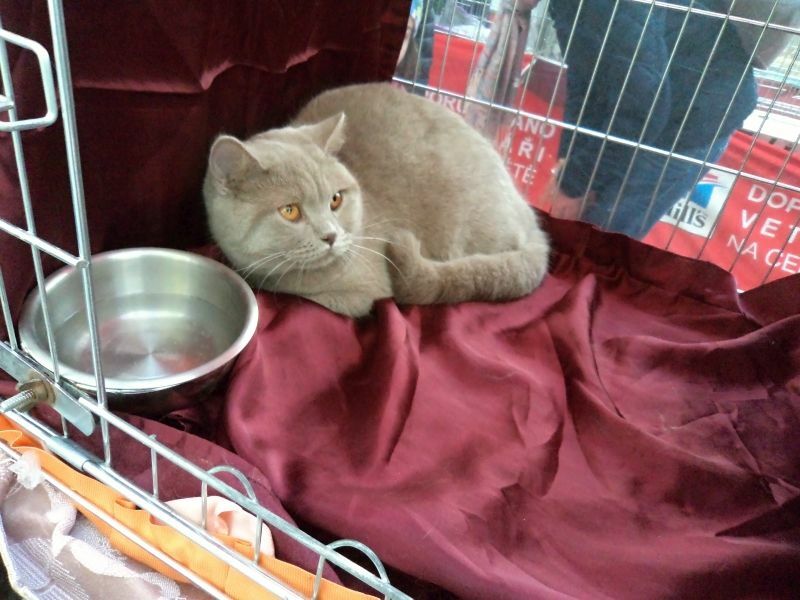 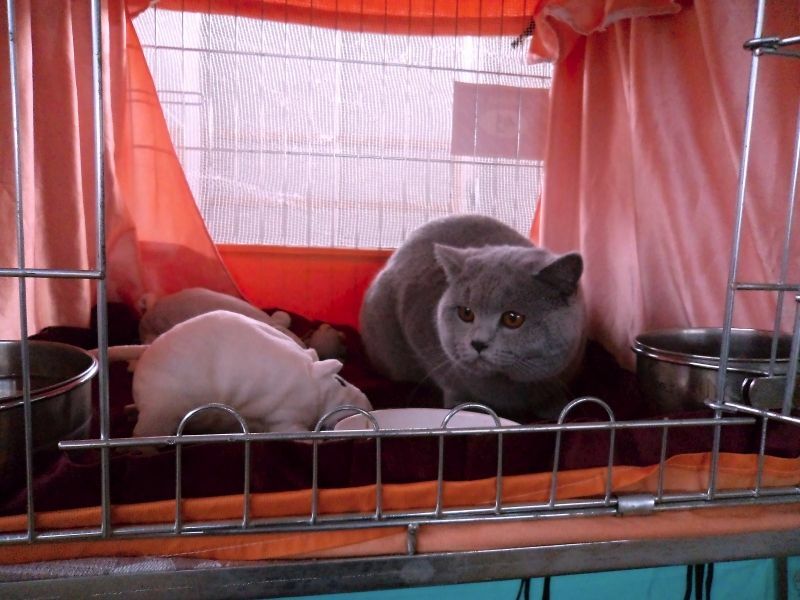 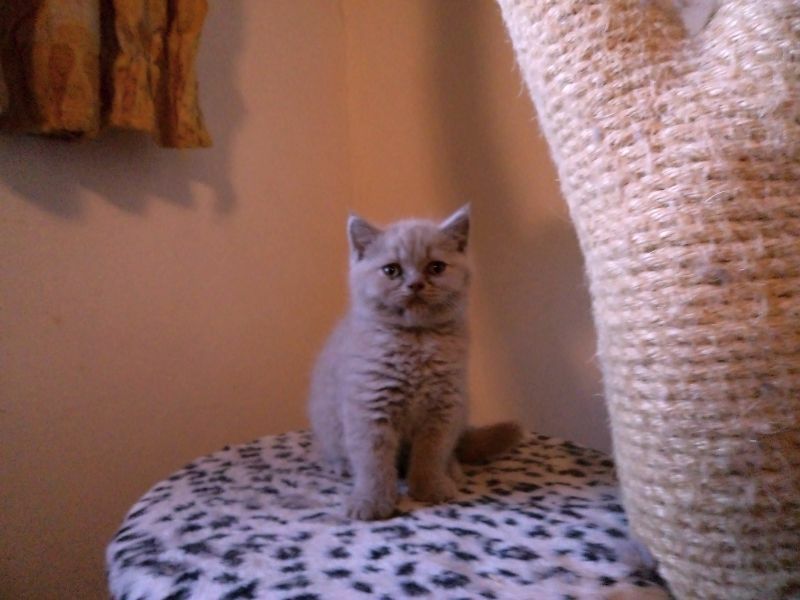 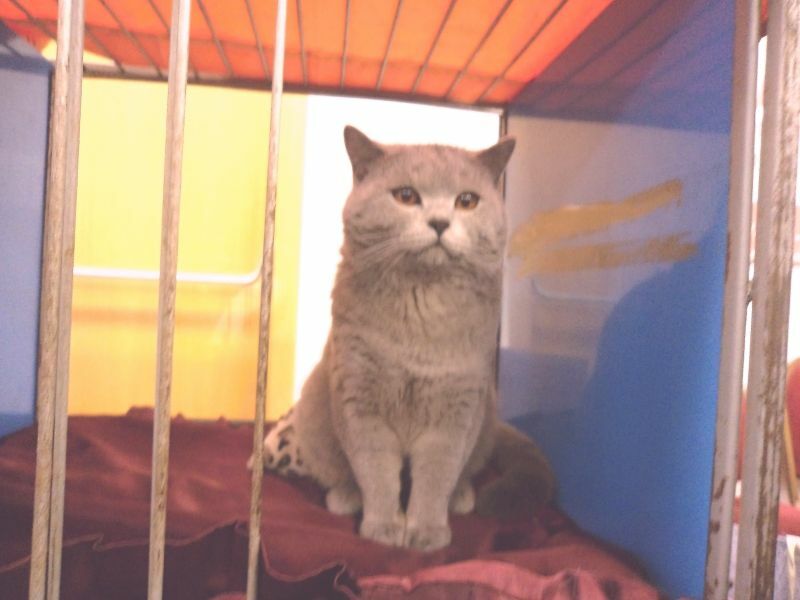 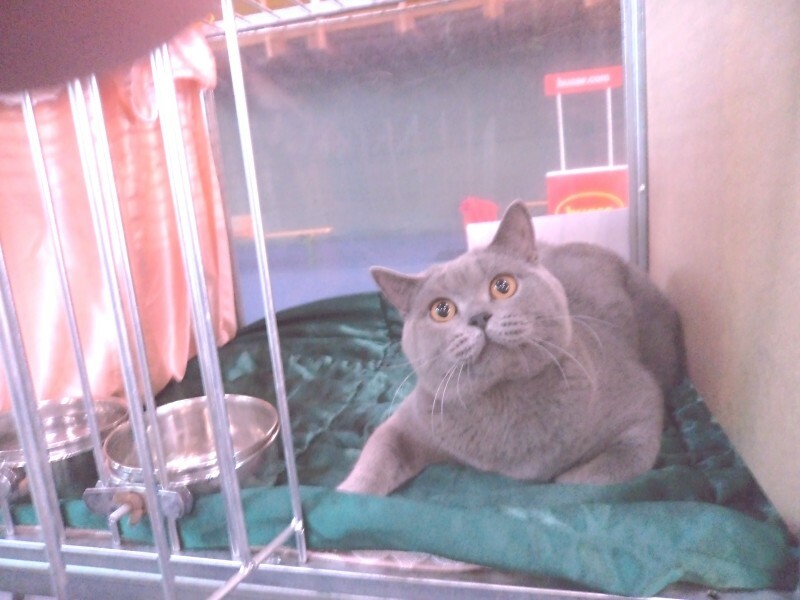 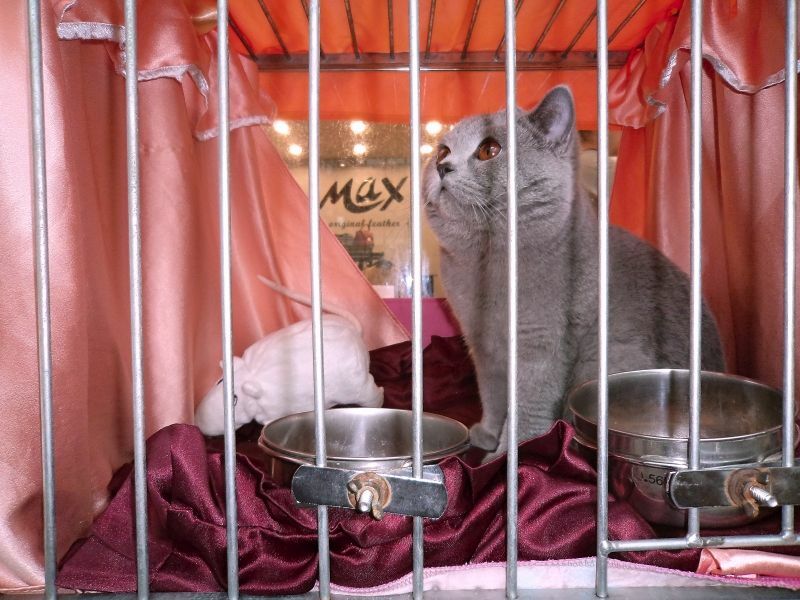 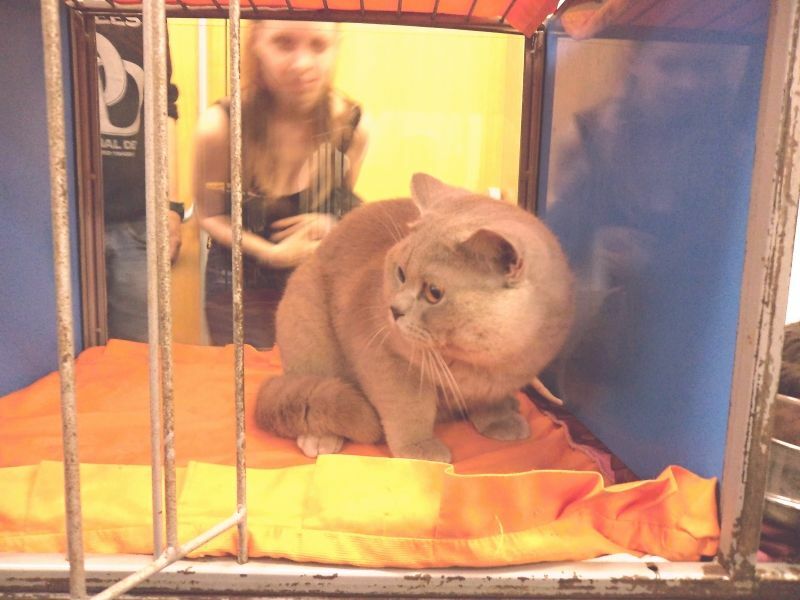 Our British shorthair lilac kitten Persy Agnus Dei, CZ (BSH c) has got Ex.1. 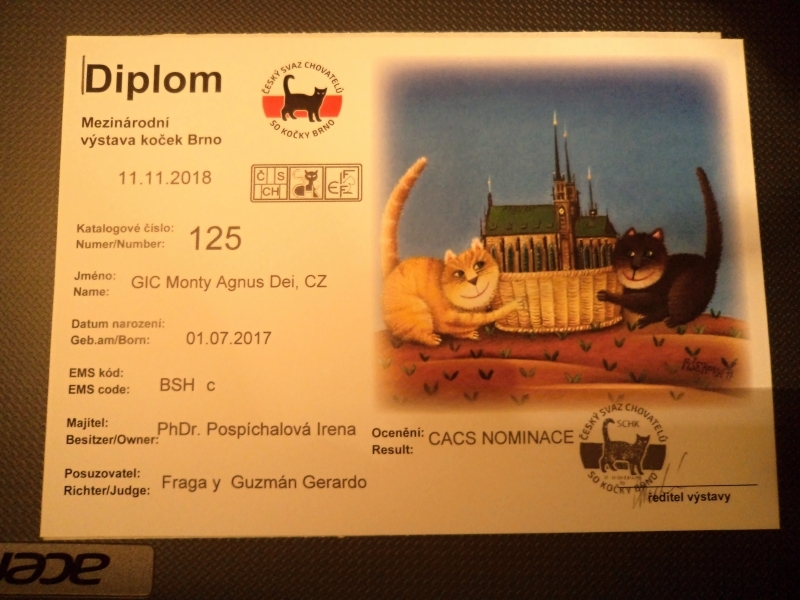 We have kittens - see litter "O" and litter "P"
We have a free lilac male GIC Monty Agnus Dei, CZ (BSH c) - see litter "M"
our lilac male GIC Monty Agnus Dei, CZ (BSH c) got Ex.1 CACS + BIV diploma on Saturday and Ex.1 CACS + NOM on Sunday in the 3rd class. 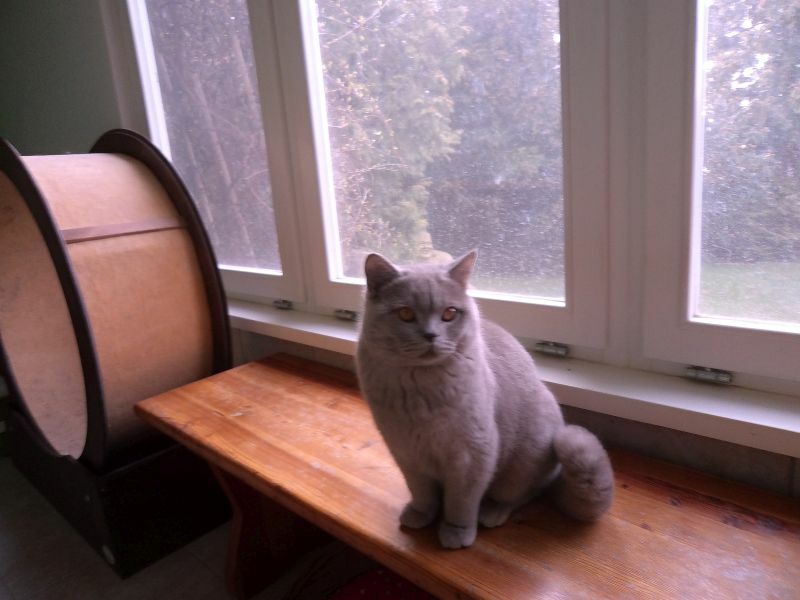 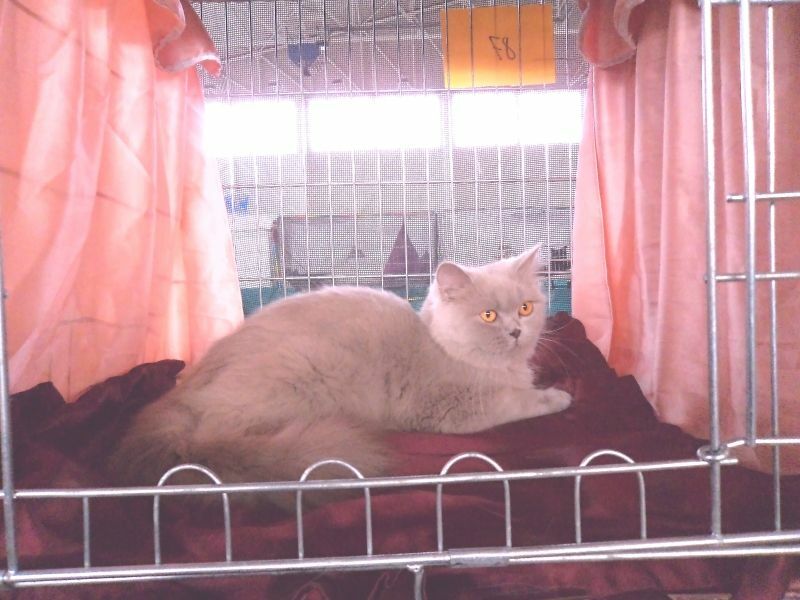 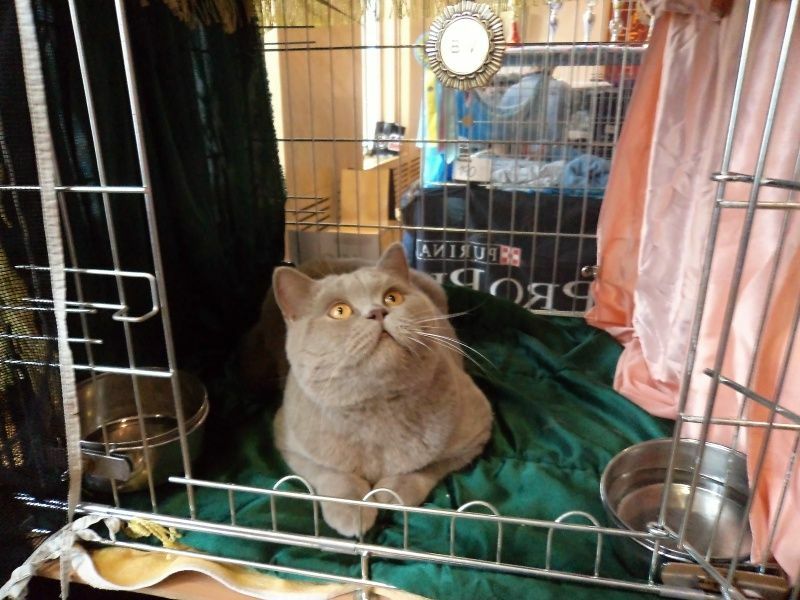 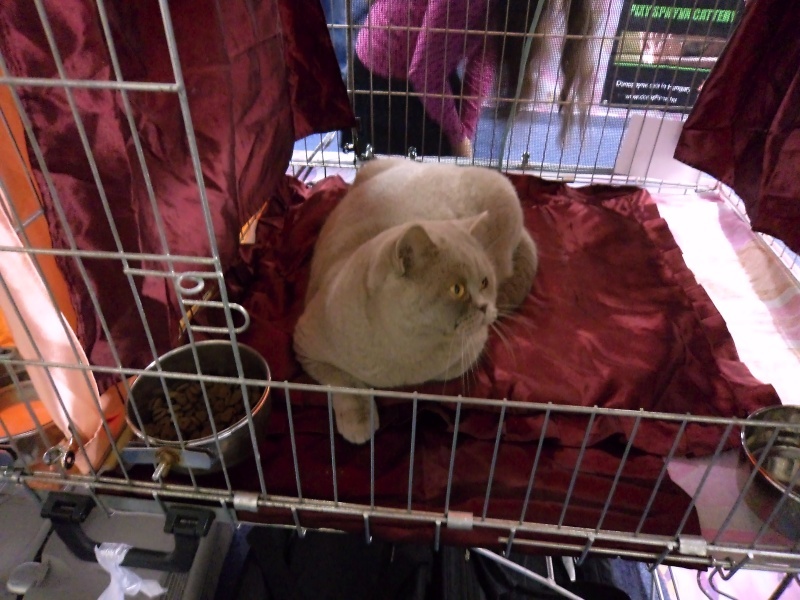 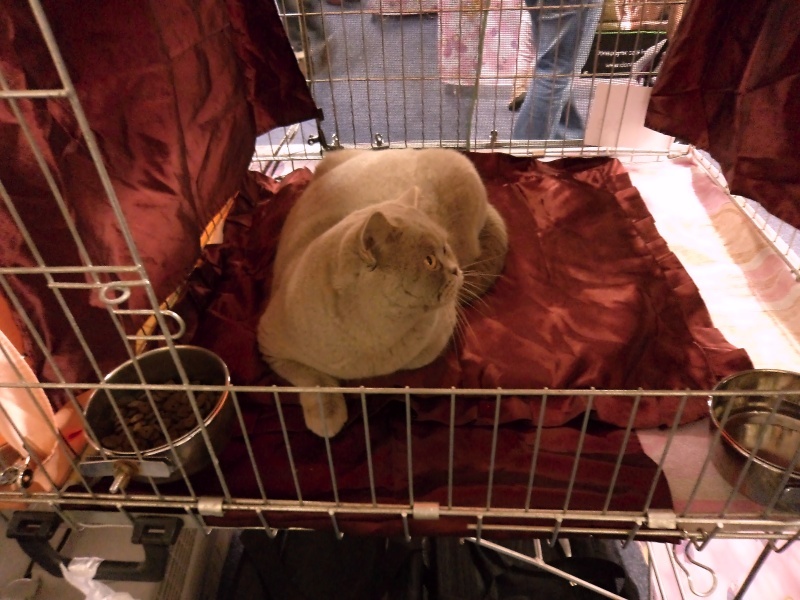 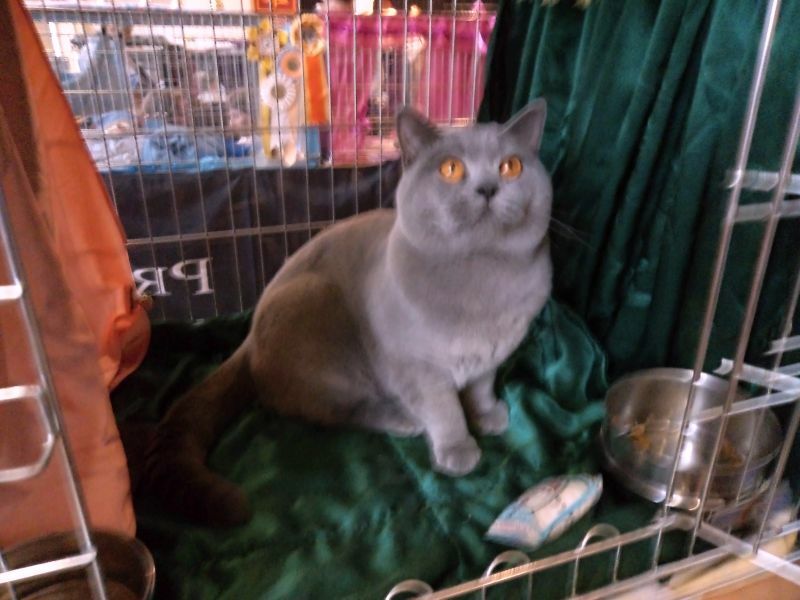 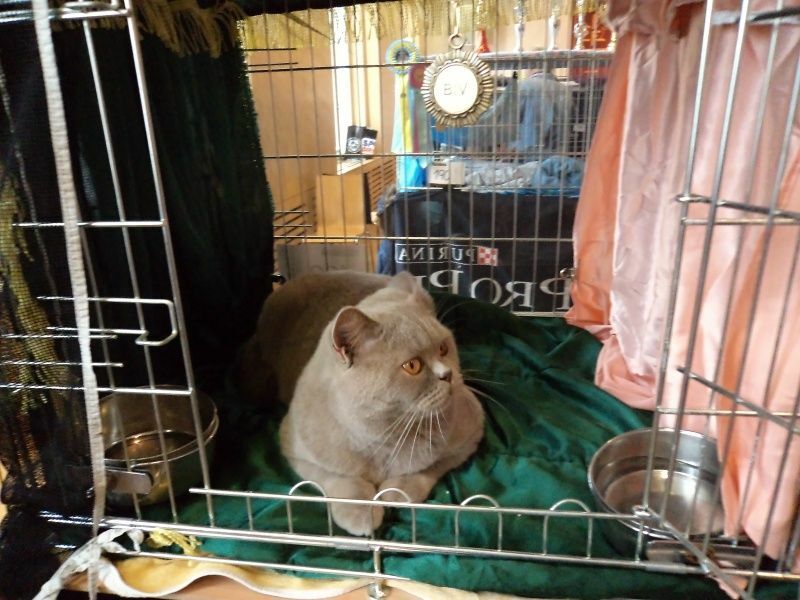 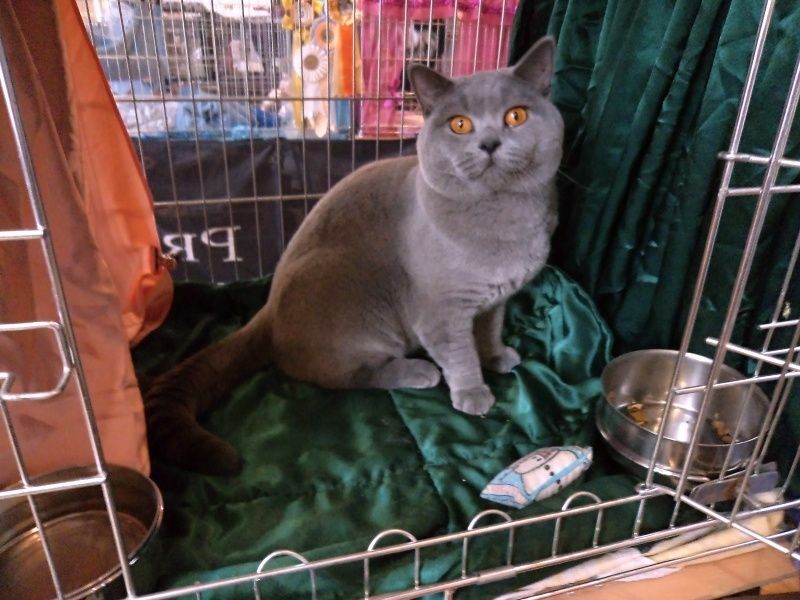 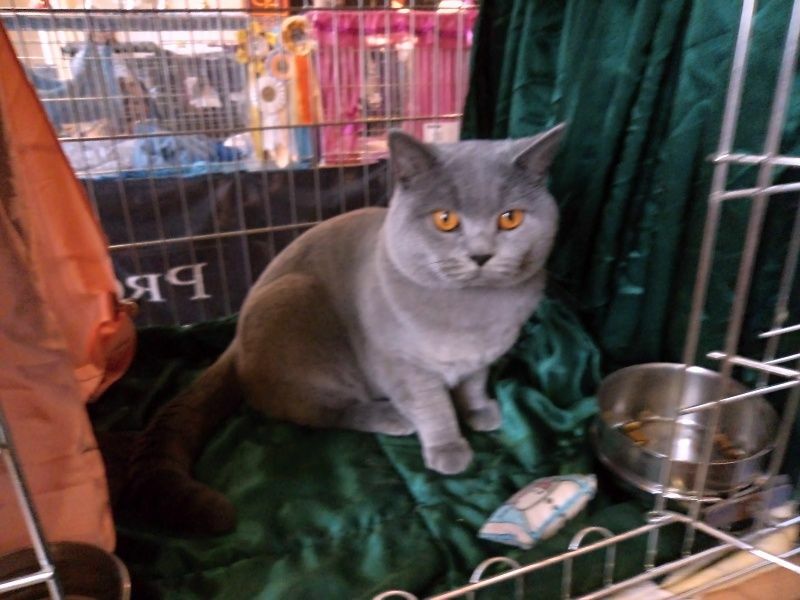 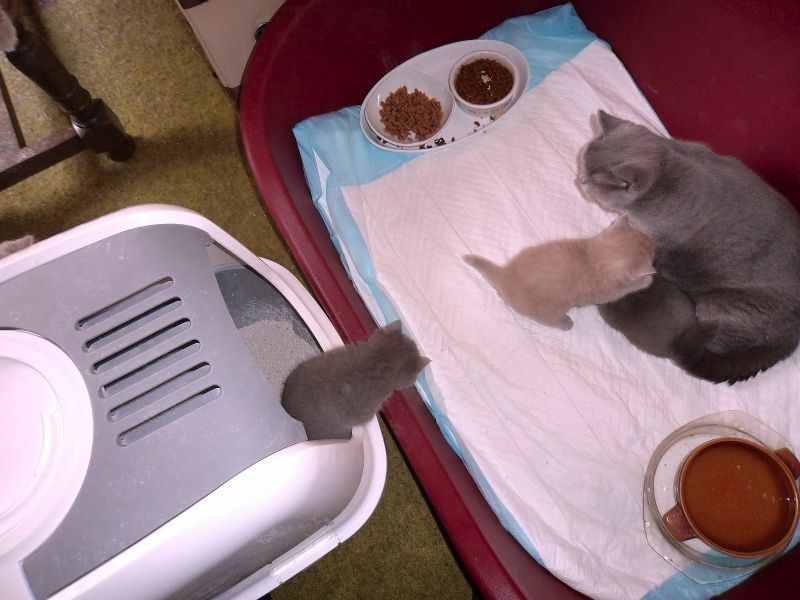 We have a lilac male (BSH c) available / for sale see litter "M"
We have a kitten available / for sale see litter "M"
We have kittens - see litter "M" and litter "N"
we have a kitten - see litter "M"
On 25.June 2016 our blue male IC Gatsby from Stevenshire,RU has got CAGCIB in class 5. 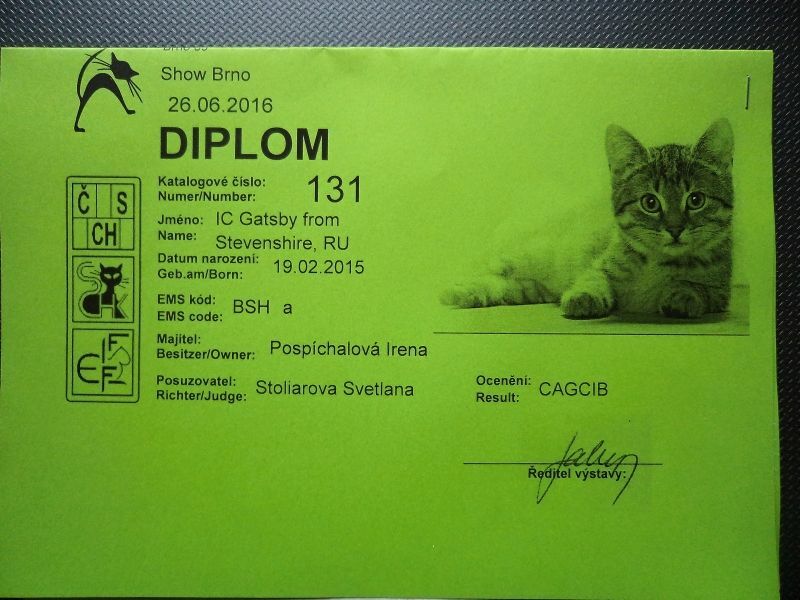 On 26.June 2016 our blue male IC Gatsby from Stevenshire,RU has got CAGCIB in class 5. 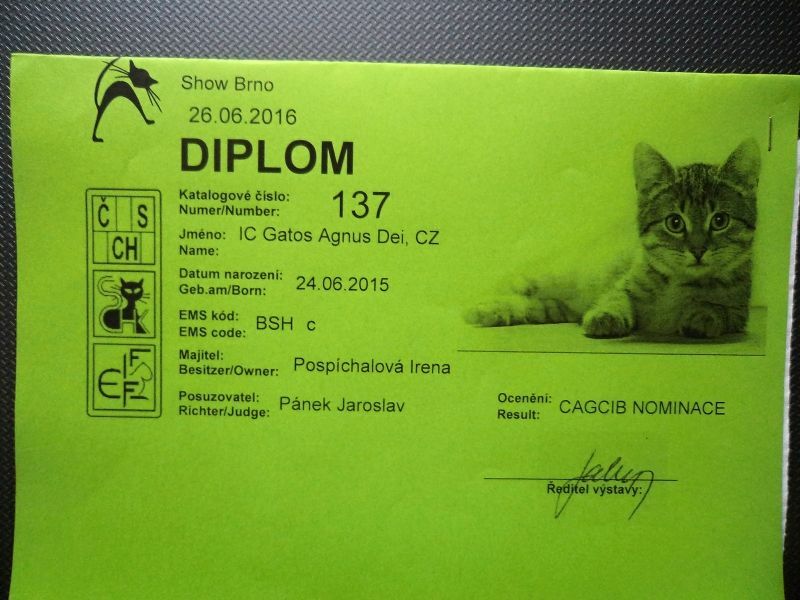 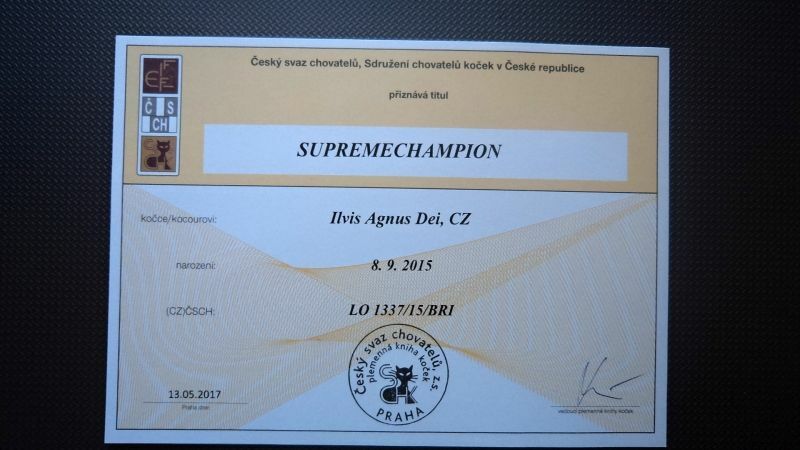 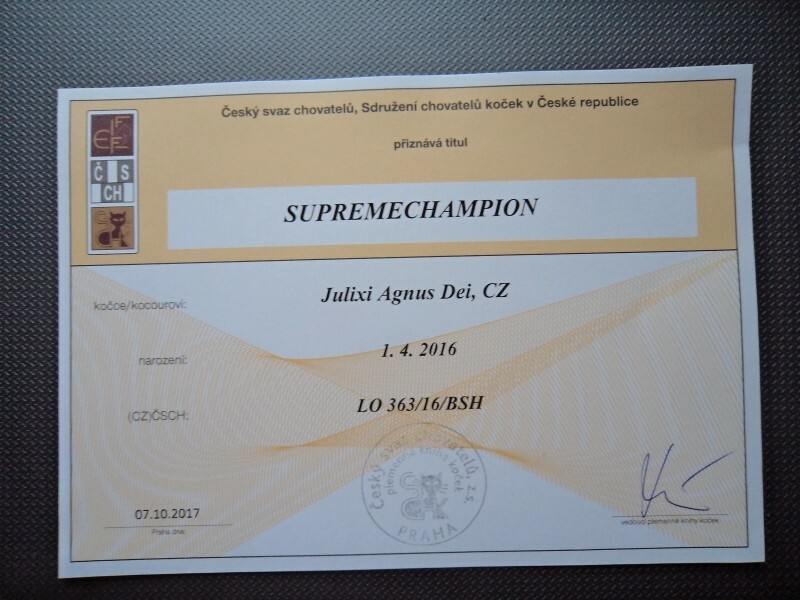 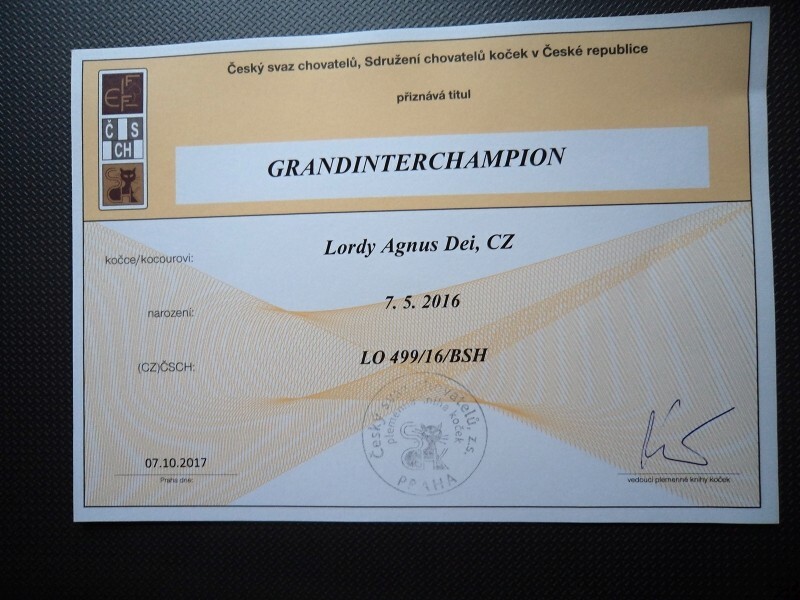 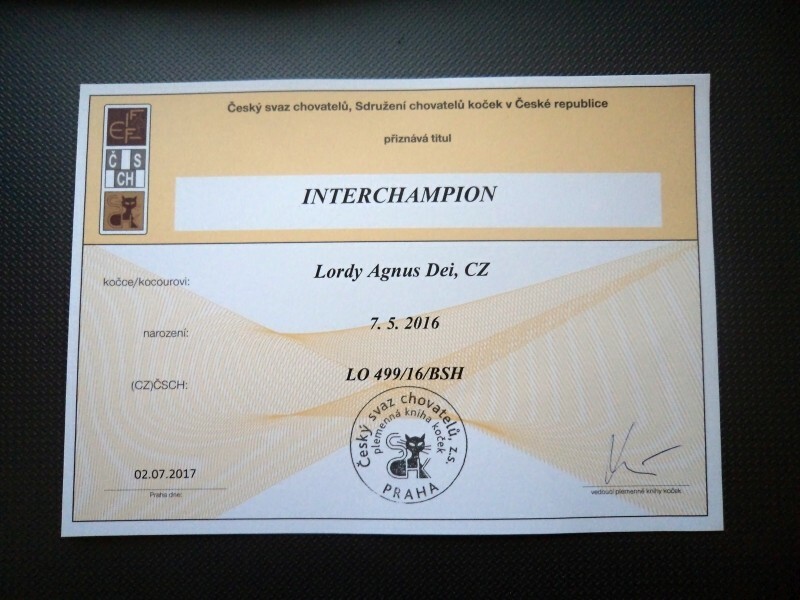 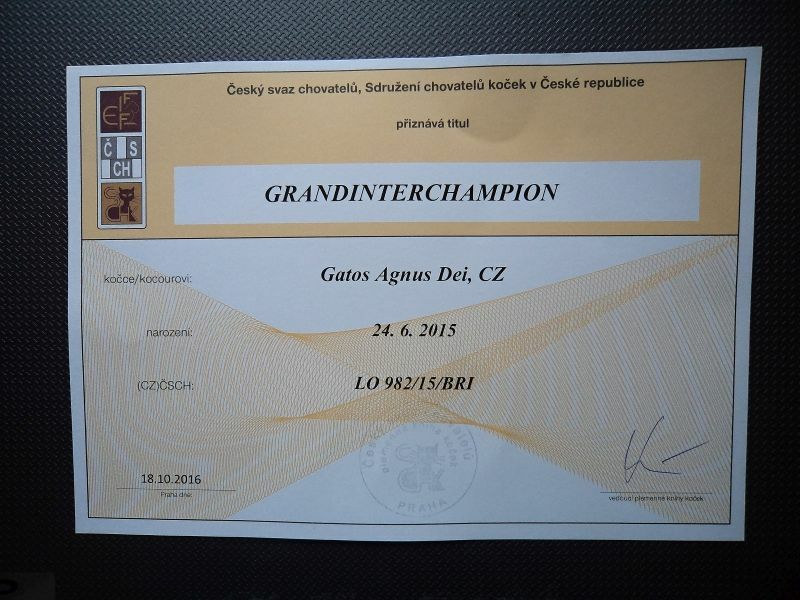 On 25.June 2016 our lilac male CH Gatos Agnus Dei,CZ has got CACIB and now is International Champion. 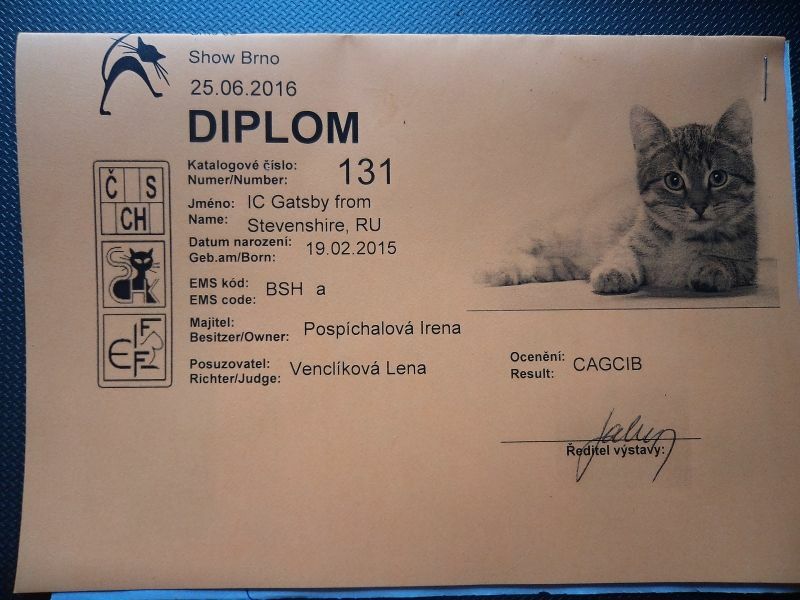 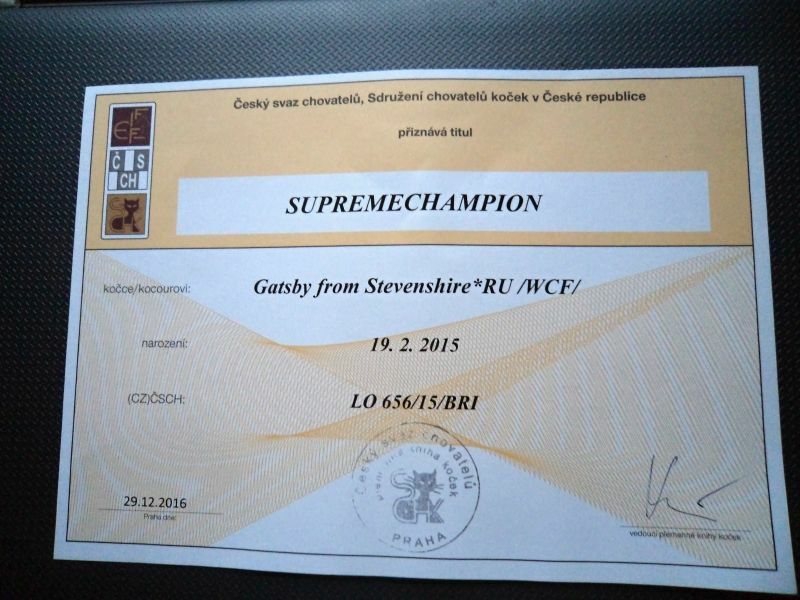 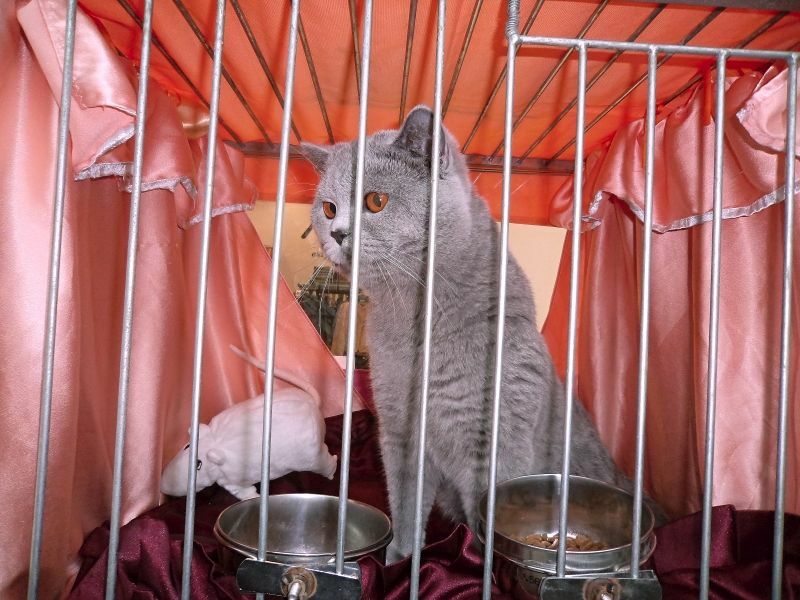 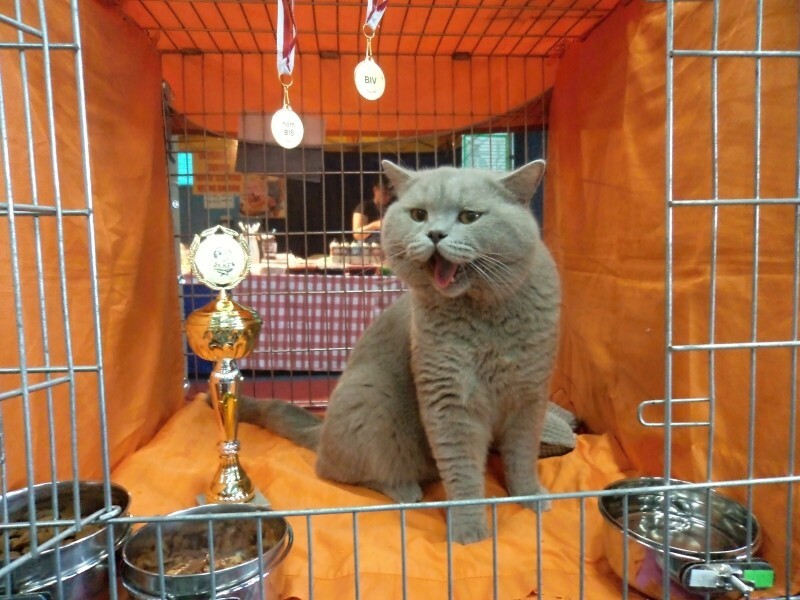 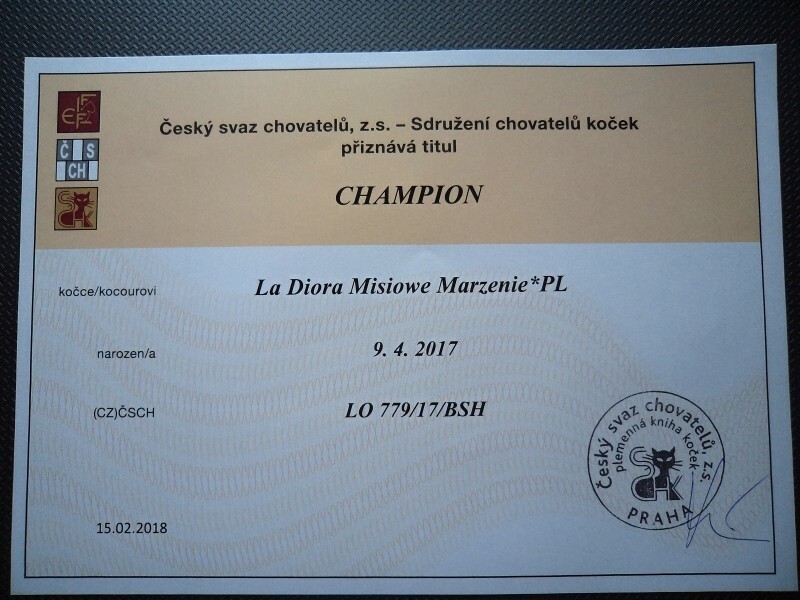 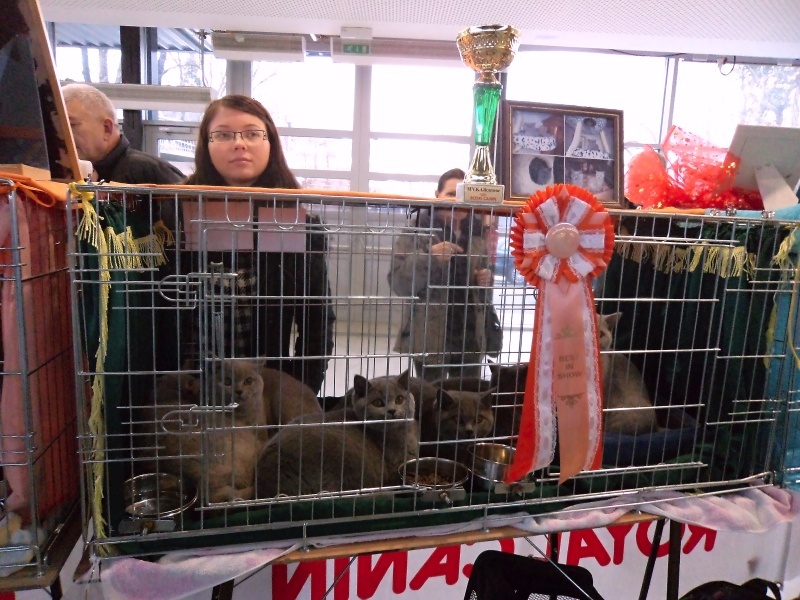 You will find more information "Kittens"
At the International Cat Show in Žilina, Slovakia, our blue male Gatsby from Stevenshire, RU has got his third Ex.1 CACIB and is International Champion. 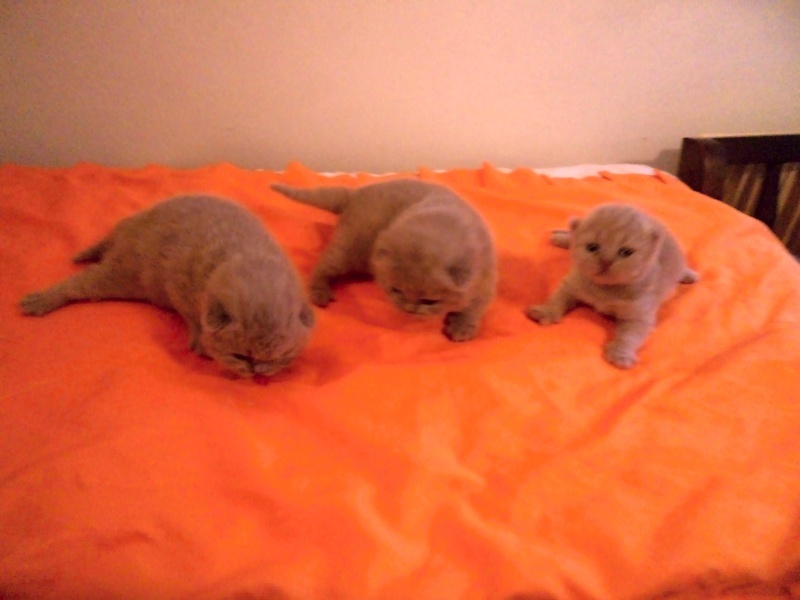 - Our litter "I" was born on 8 September 2015. 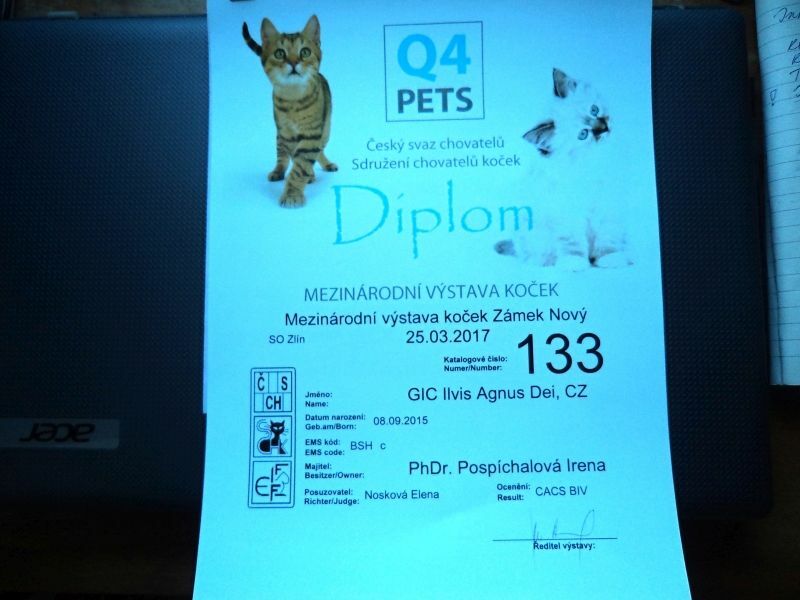 You will find more information "Kittens"
- Our litter "H" was born on 1 August 2015 . 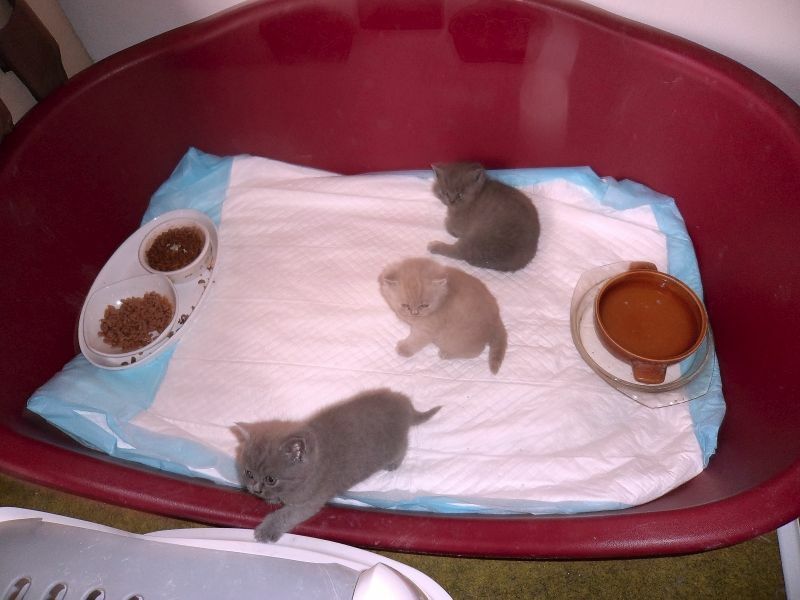 You will find more information "Kittens"
- litter "G" was born on 24 June 2015 . 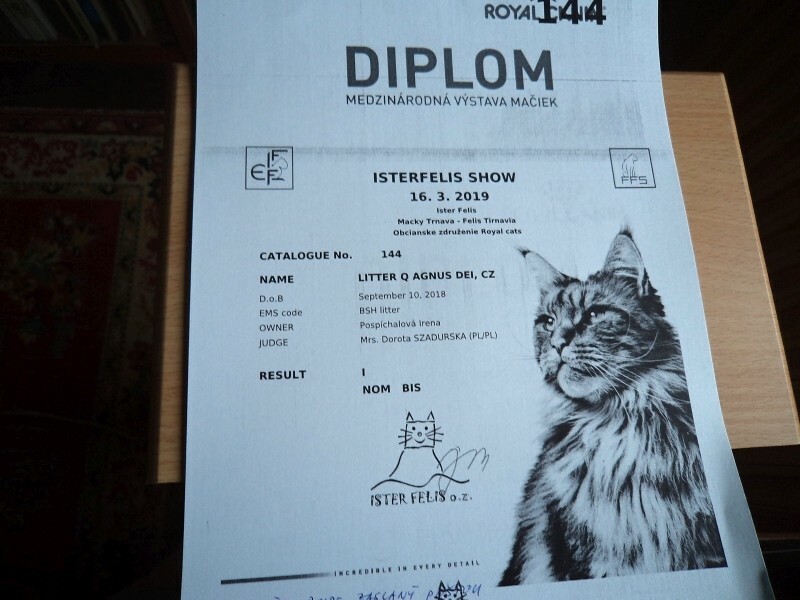 You will find more information "Kittens"